Considering how many small fires I’ve started in my kitchen recently I surprised myself by not inflicting any further injuries whilst venturing into deep fat frying for the first time. Churros have been on my got-to-bake list forever. 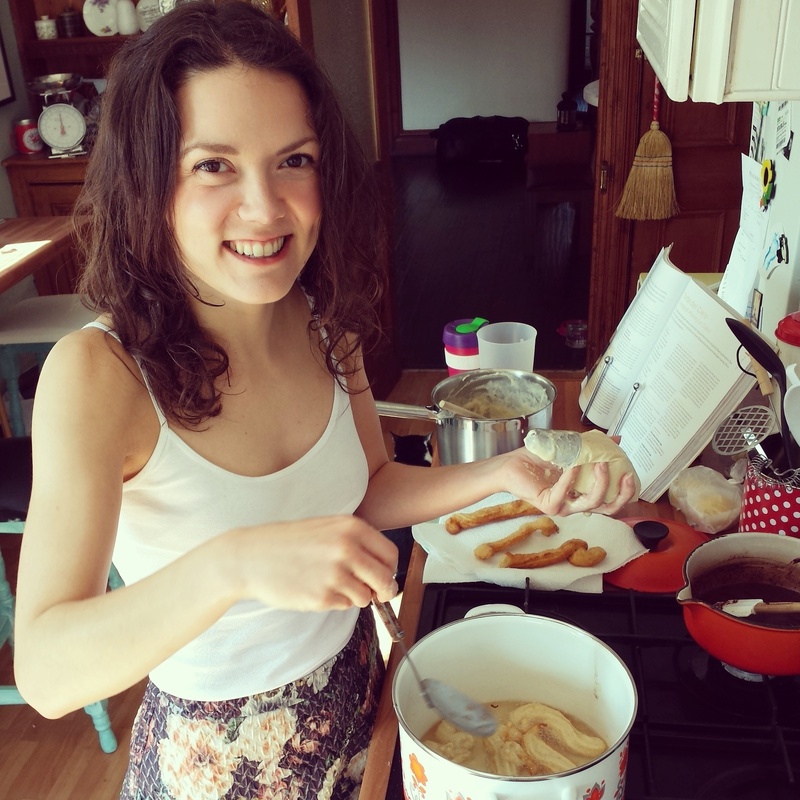 I first tried Churros in Sydney in the bohemian district of Glebe. 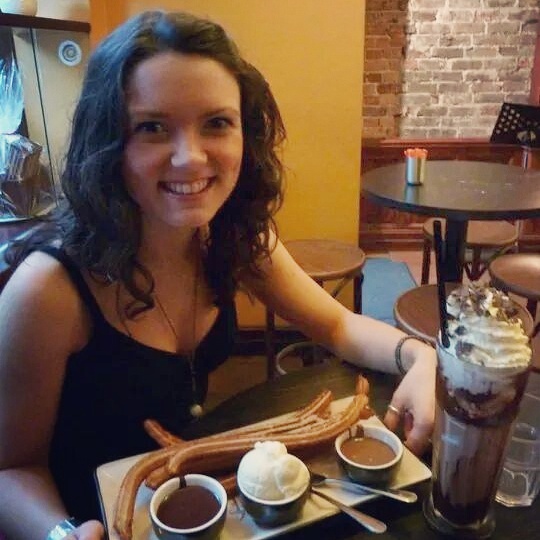 San Churros is a late night chocolate cafe offering half a metre long cinnamon sprinkled churros, thick hot chocolate and ice cream. AMAZING. Newcastle needs one of these. Churros are traditionally Spanish but also very popular in Mexico usually dipped in liquid chocolate for good measure. You could also add some chilli to your chocolate (or chocolate to your churros – substitute some flour for cocoa powder) if you want an extra kick. 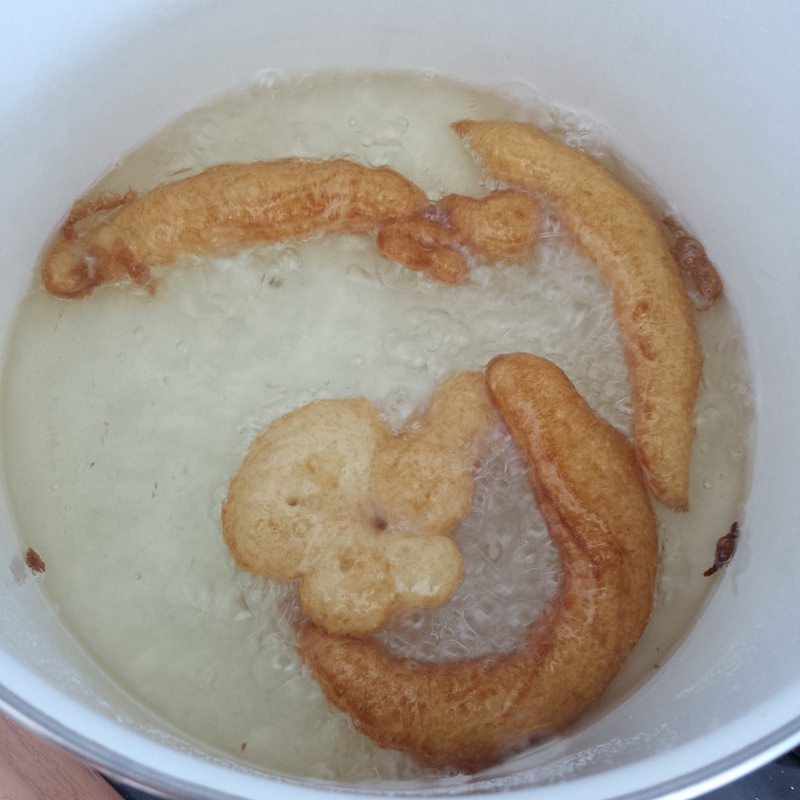 The process for making churros batter is very similar to profiteroles. Heat the water, butter and sugar in a pan until the butter melts. 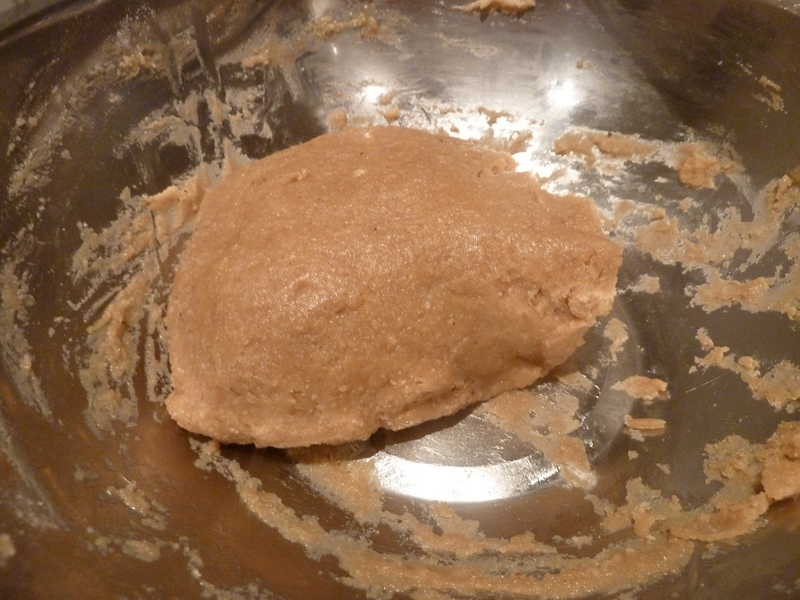 Take the pan off the heat and using a wooden spoon beat in the flour and salt until it comes together into a thick lump. 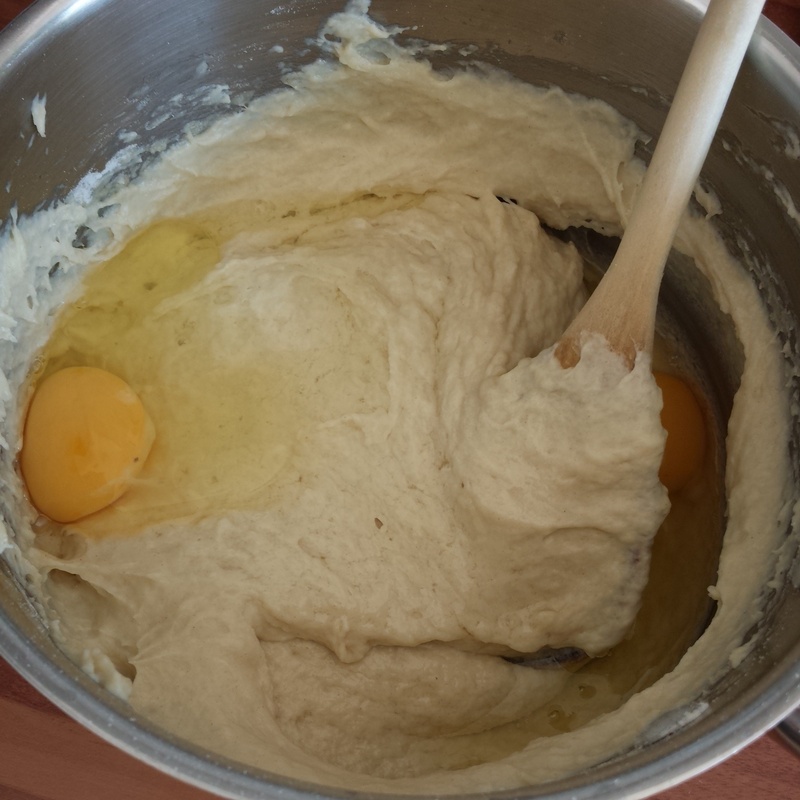 Then beat in the eggs one by one until it’s a smooth and shiny batter. This is quite a precise process so it’s worth setting up your workstation to make it as stress free as possible. Keep a damp tea towel to hand to wipe your hands when you’re covered in batter. 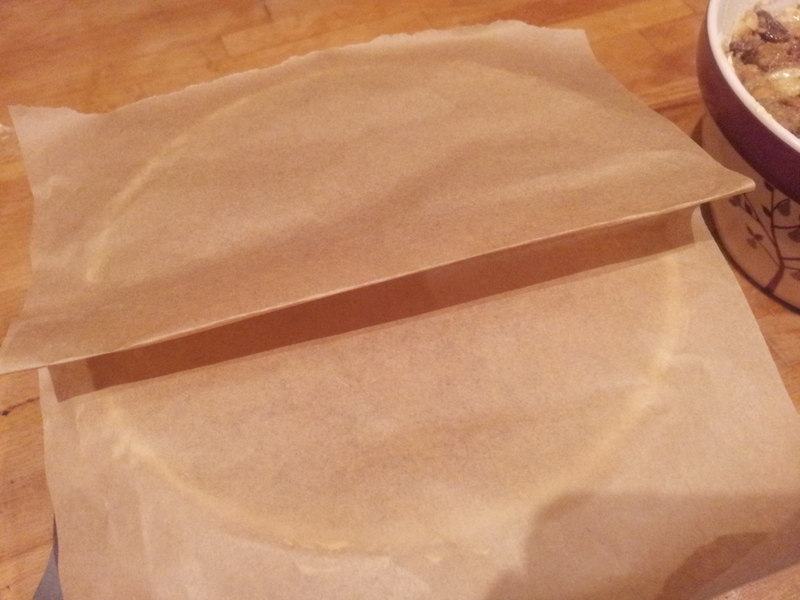 Line a plate with kitchen paper and keep it close to add more layers when needed to drain the churros on. 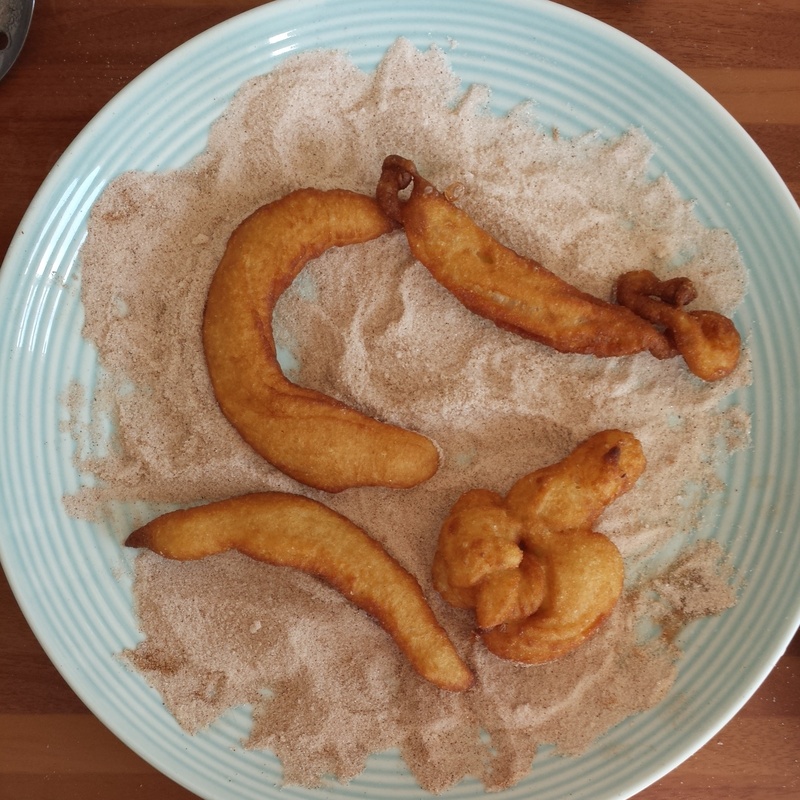 Fill a shallow and wide dish with cinnamon sand to roll your churros in whilst they’re still hot. 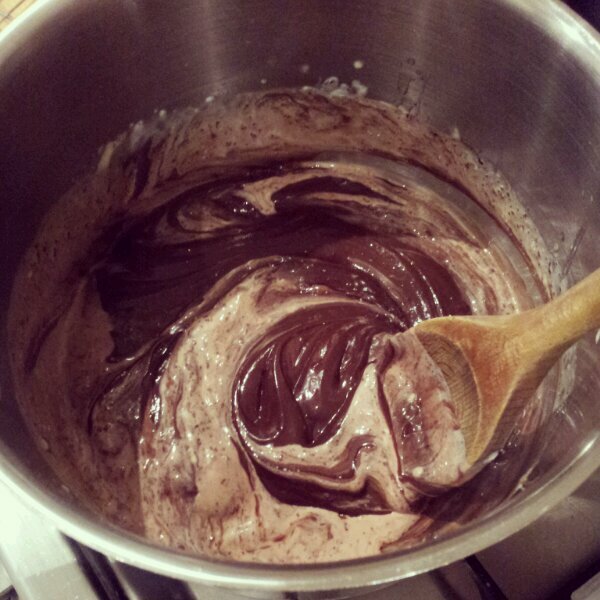 To prepare the chocolate dipping sauce, heat the water and milk in a pan until approaching boiling and point. Take it off the heat add half of the chocolate. Stir until melted. Then stir in the remaining chocolate until smooth and shiny. Pour your chocolate soup into a pot ready for dipping. Heat the vegetable oil in a deep pot about 400ml in a 8 inch round stock pot will give you about 2 inches of oil to fry the churros in. 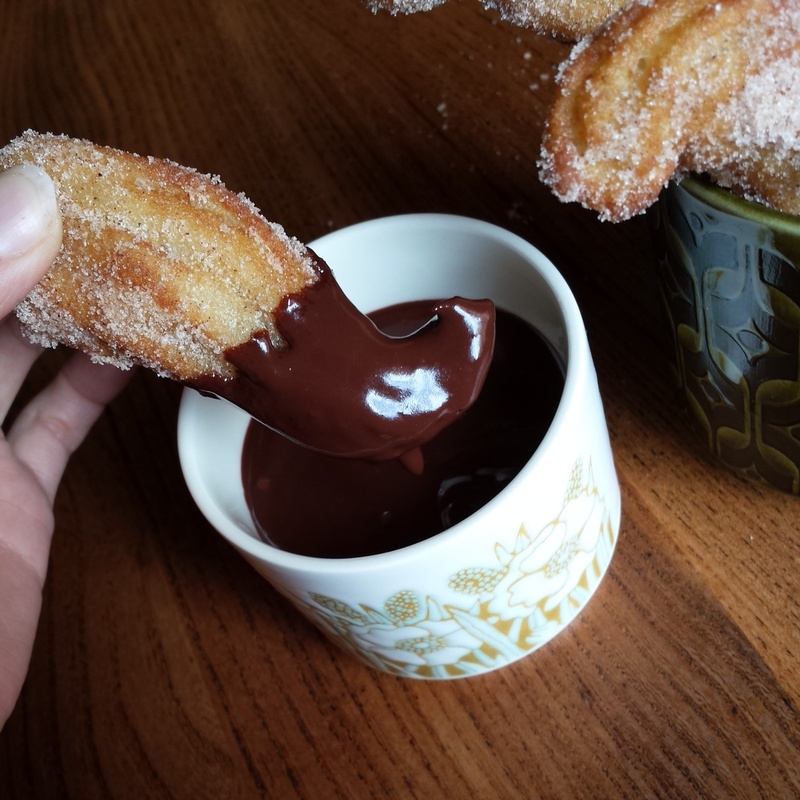 Make sure the oil is hot enough before piping your churros in. Just pop a blog of batter in and if it sizzles you’re good to go. You will need a slotted spoon to turn the churros with and to scoop them out when they’re cooked. 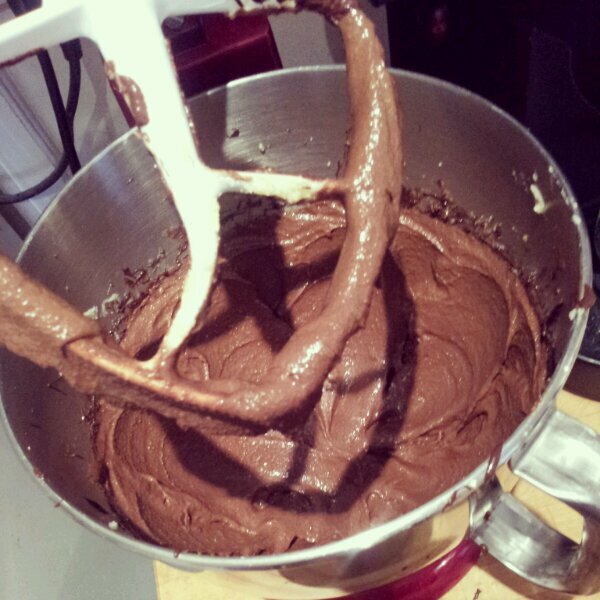 Although the batter is thick it should be free flowing. 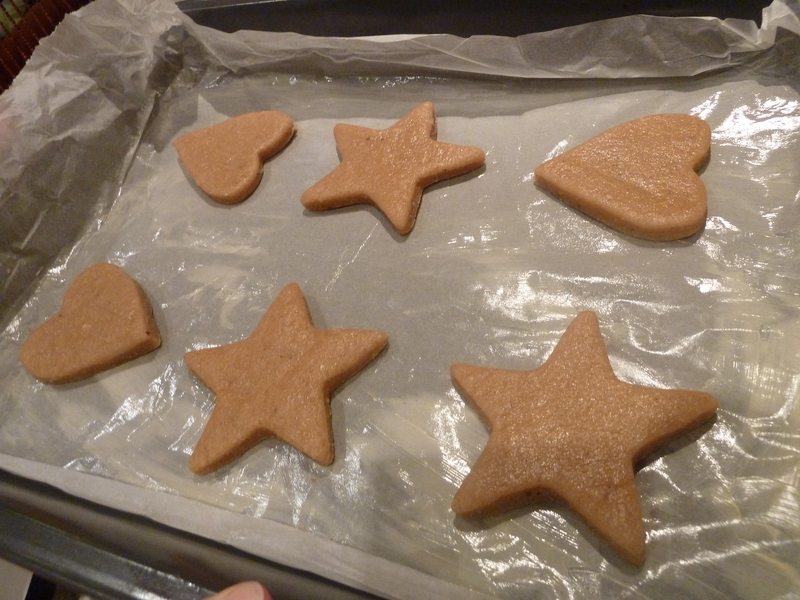 Scoop it into a piping bag with a star shaped tip. 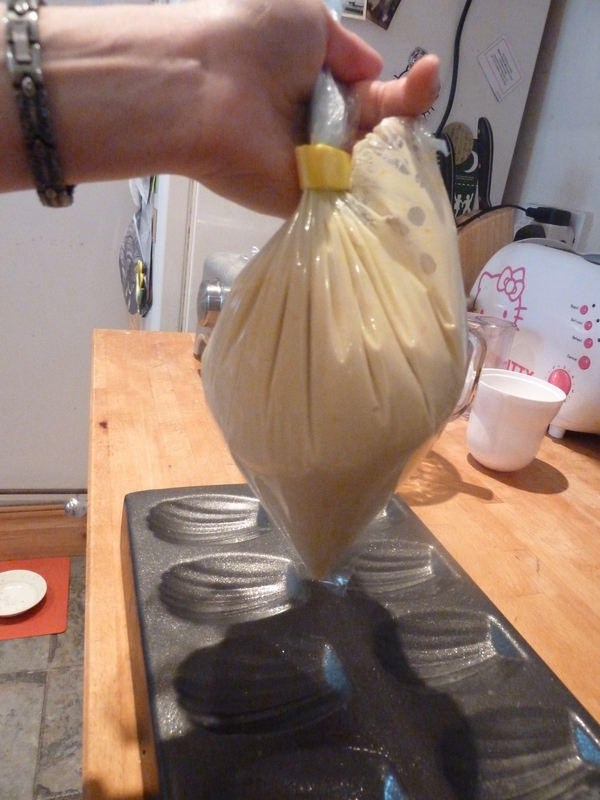 Don’t overfill the bag as it becomes really unwieldly (gushing batter from both ends). You need as much control as possible when piping into boiling hot oil as you really don’t want to get splashed. I’ve watched street food vendors preparing churros and they have special batter dispensers that cut off the flow and deposit long sticks of churros into a deep vat of molten oil. Great method but probably not something that you’ve got in your kitchen at home. TV Chefs have also demonstrated perfectly straight churros. 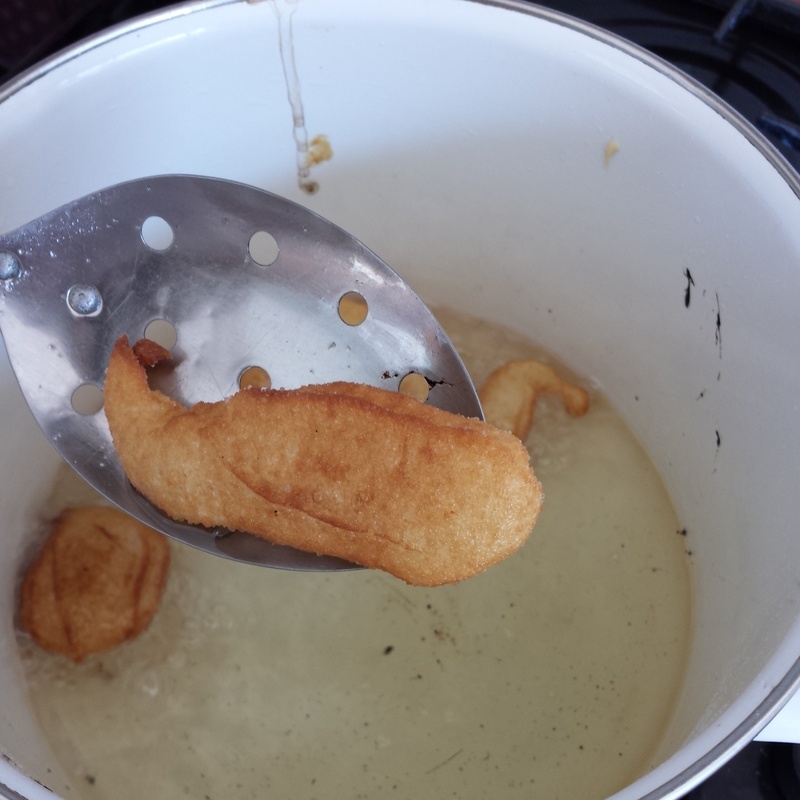 Nigella piped hers into boiling oil using scissors to cut the flow from the bag. She made short churros. 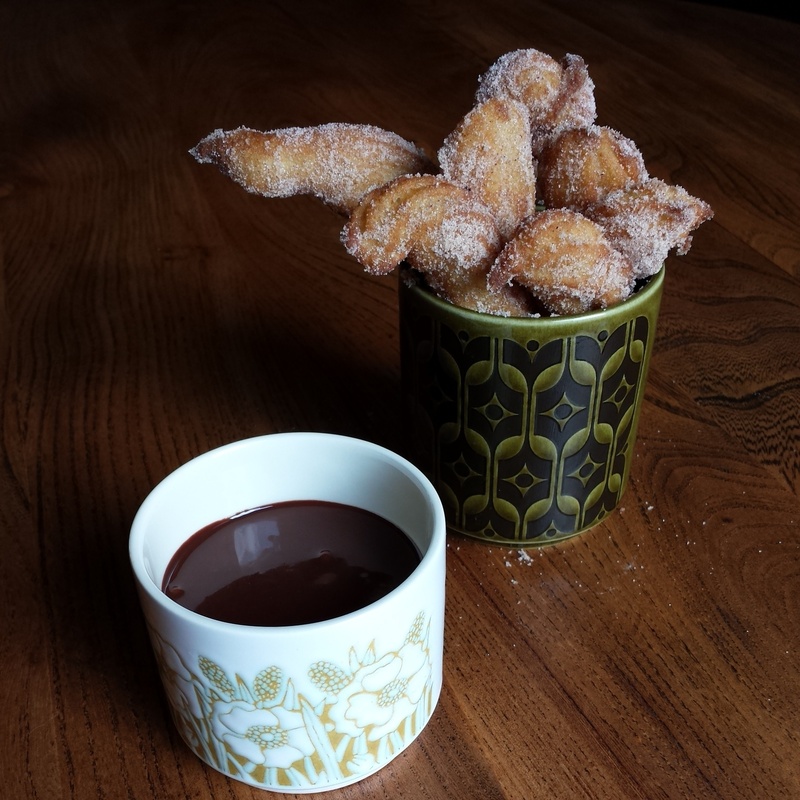 Jamie Oliver made a firm dough and rolled his churros and then fried them. 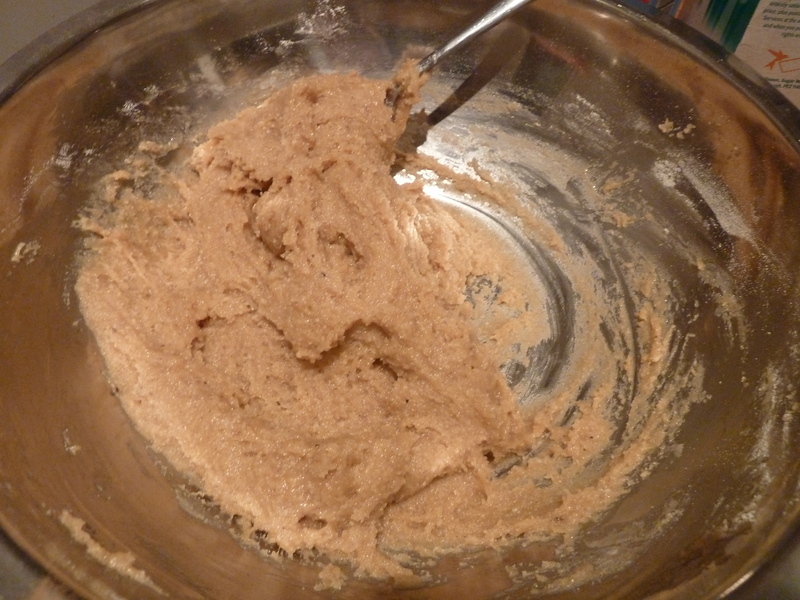 My batter was very liquid and difficult to control so I mostly ended up with it all over my hands and in my hair but I did manage to get some of it into the pot. 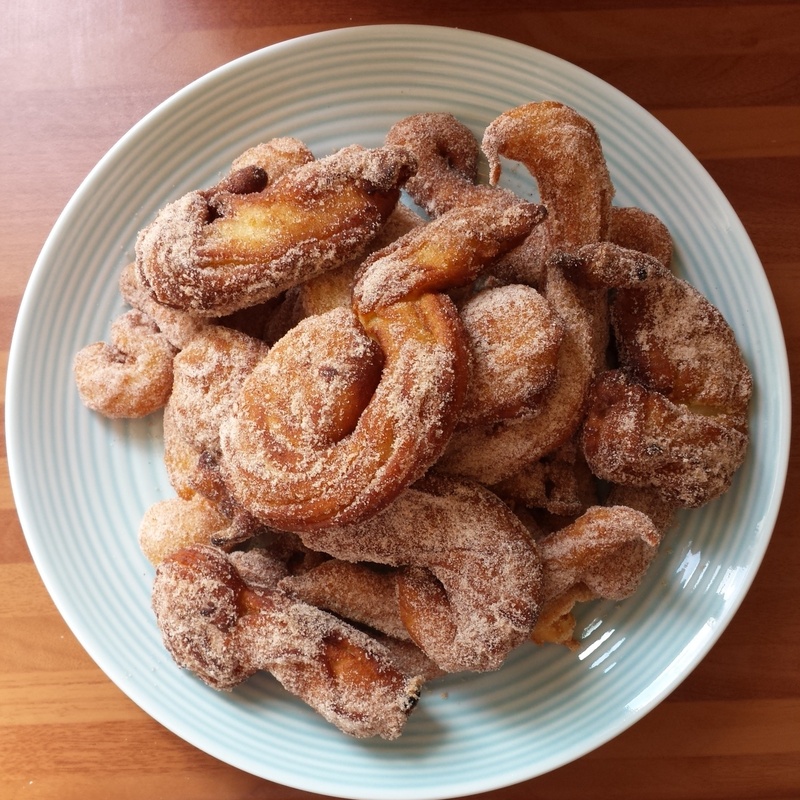 My lack of precision and being covered in batter meant I piped rather curly churros into the pan which instantly puffed up into curious shapes. 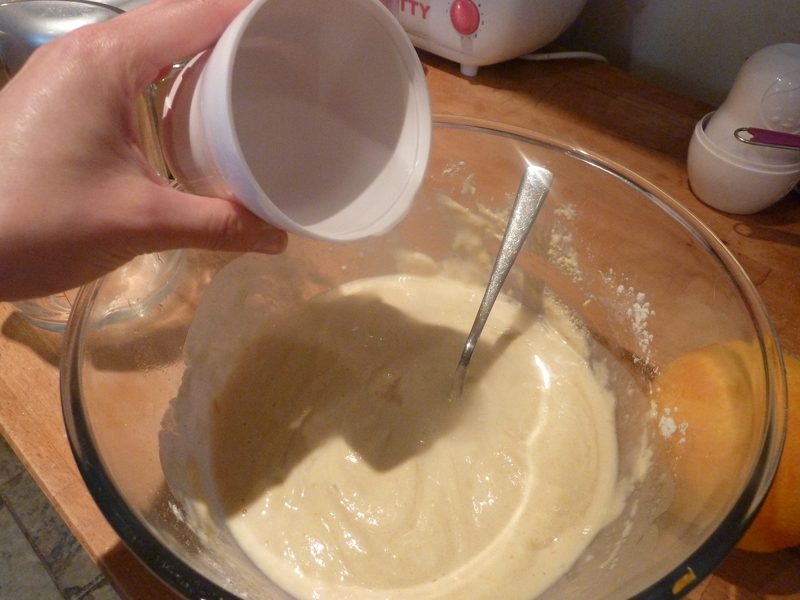 The batter has a mind of its own and using a shallow round pot does have some limitations. Despite their irregular appearance they’re pretty damn tasty. They sizzle instantly as soon as they reach the oil (watch out for sizzly splashes) and take minutes to cook, about 2 minutes each side turning a golden brown. 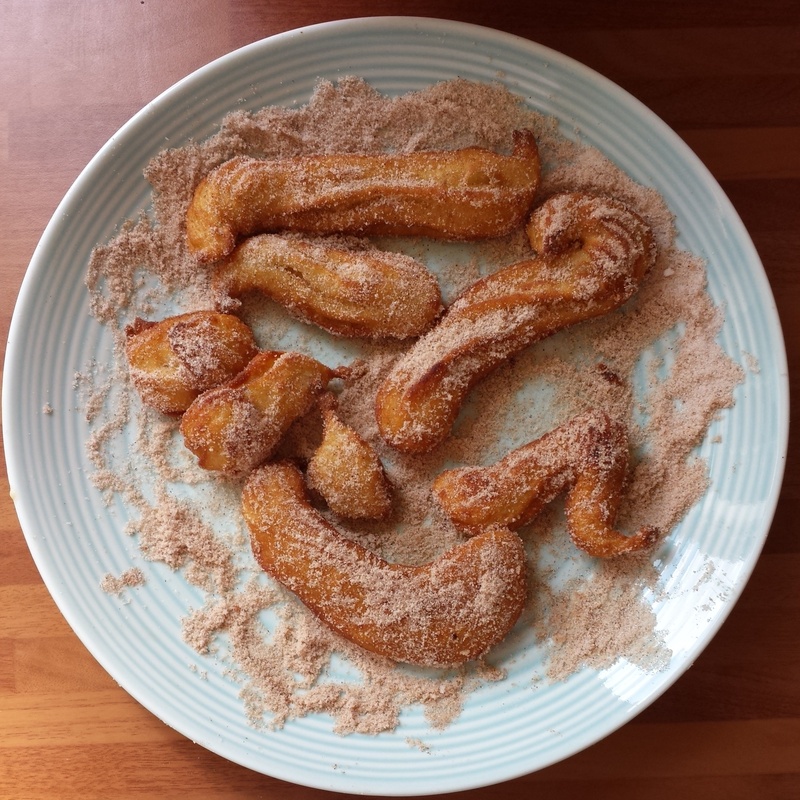 With your kitchen roll at the ready you can pop your churros straight from the pan onto the paper to blot any excess oil before transferring them to the cinnamon sand (caster sugar and ground cassia/cinnamon) for a good sugary coating. Keep piping churros into the boiling oil, flipping them, scooping them out, blotting them off, rolling in sugar until you’ve exhausted all of your batter. This makes an enormous amount of churros, so you may need to friends to help… Be careful not to leave the oil on the heat for too long, for example if you’re messing around taking photos. Without any churros to absorb some of the heat the oil will continue to sore in temperature and scorch the next churros you pipe into the pan. Also make sure you scrape out any scraps from the oil before piping the next churros in to avoid burnt bits attaching themselves to your fresh batch of churros. Eat immediately! The longer they sit, the more oil they absorb so they lose a little of their crispiness. You’ ll not be disappointed by these churros. I shared these still warm and cinnamon scented to my friends at a picnic and with my family. Every single one disappeared. They’re light and fluffy on the inside and just crispy enough on the outside, (with the added texture from the sugar) to be oh so moreish. I quite like the contrast of the dark chocolate against the sweet churros, but my 3 year old nephew winced at the bitterness despite the addition of some milk to my chocolate soup. You could use a lighter chocolate or milk chocolate if you prefer more sweetness in your life. 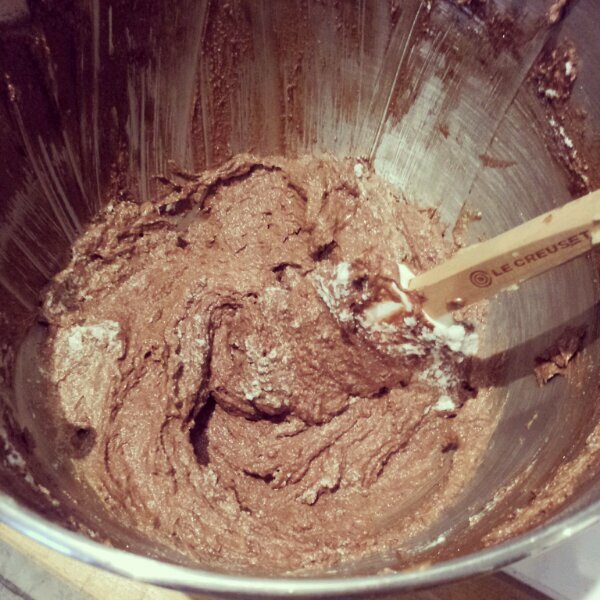 Add the remaining chocolate and stir until melted. 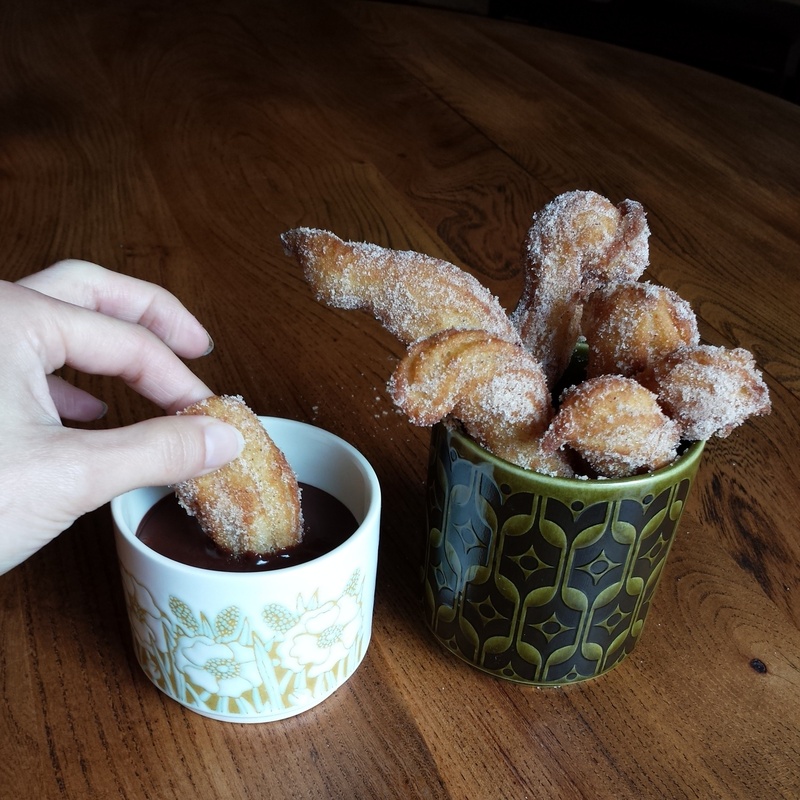 Dip your warm churros in your chocolate soup and enjoy! 53. 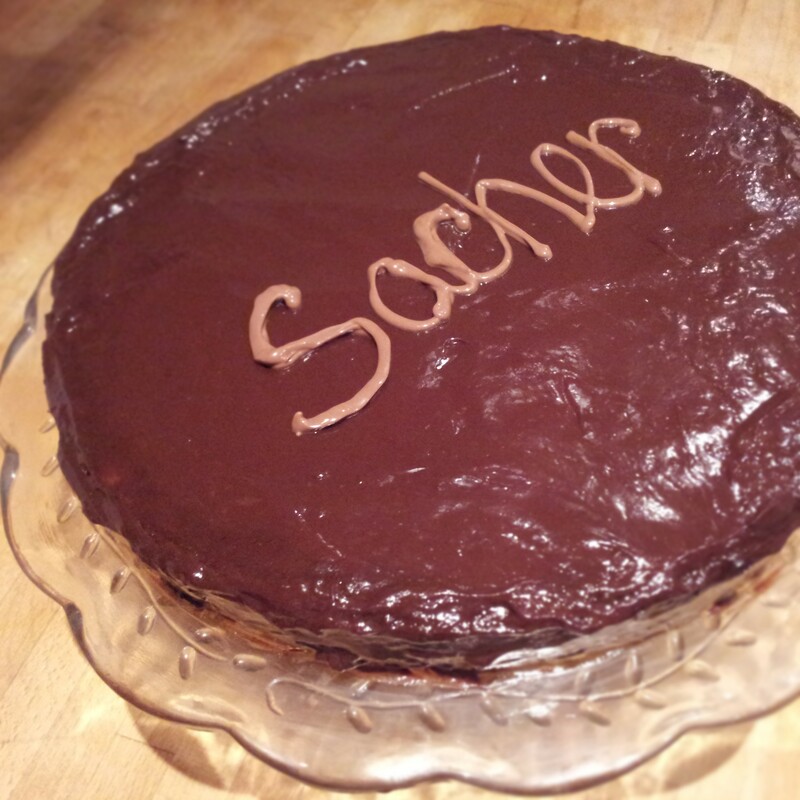 Triple Layer Sachertorte – why have 1 layer when you can have 3? 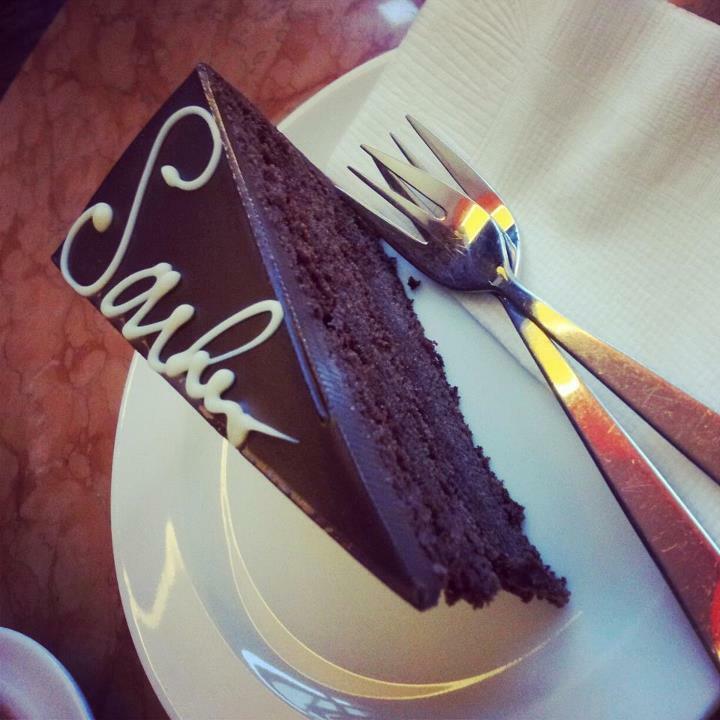 What’s more indulgent and luxurious than a Sachertorte? Surely a triple layer Sachertorte beats them all hands down. Why have merely one layer when you can have three? The Berliners had the best idea and yes I stole it, nay, lovingly recreated it at home for my friend Adam’s 30th birthday present. Sachertorte was invented in Vienna, Austria and although I’m still yet to visit the country I thoroughly enjoy it’s food. One of my very first around the world in 80 bakes, bakes was indeed a 4 foot pastry monster, also known as the Viennesse Apple Strudel. A very rich and dense chocolate cake, two layers of Sachertorte are usually sandwiched together with apricot jam and chocolate ganache. But for this extra special version I made 3! 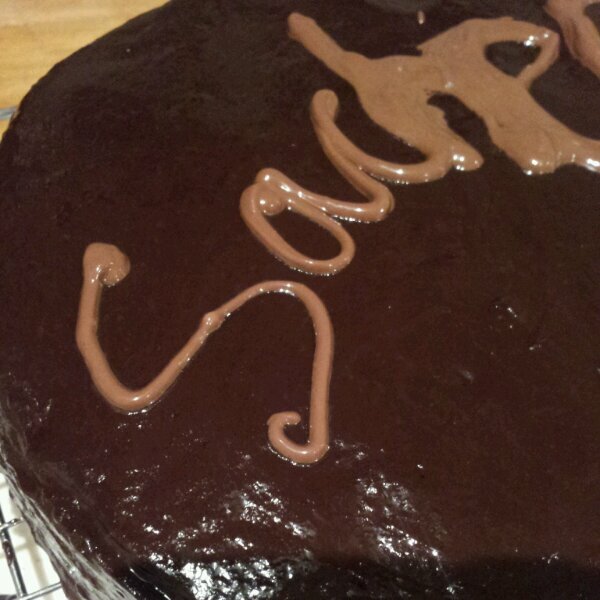 Well it is a special birthday after all and I had been promising Adam a triple layer Sachertorte for sometime. 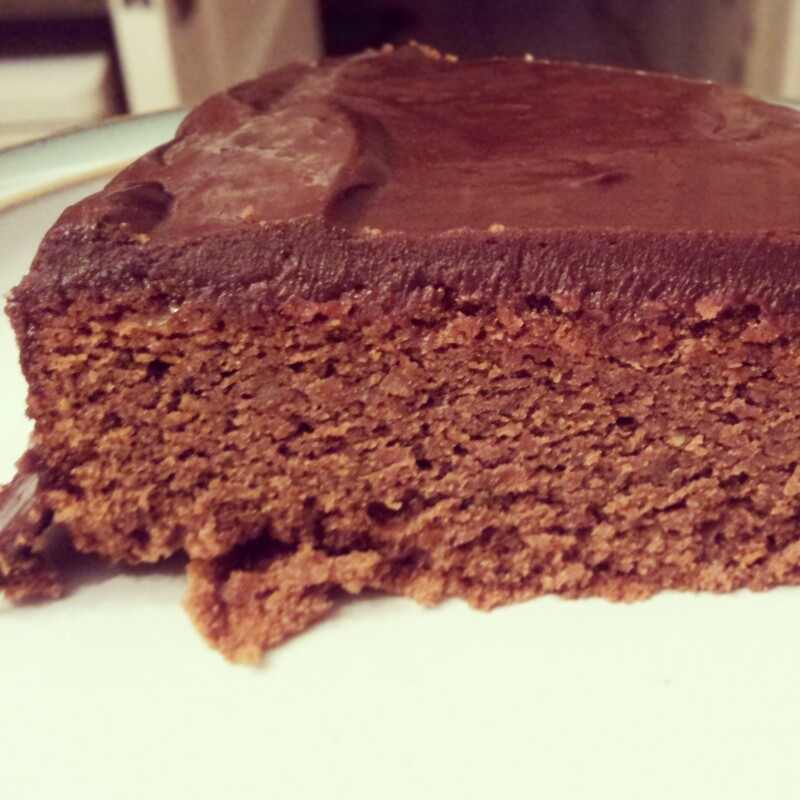 Here’s a slice of my second attempt at Sachertorte (Just the one layer) but beautifully rich and moist! 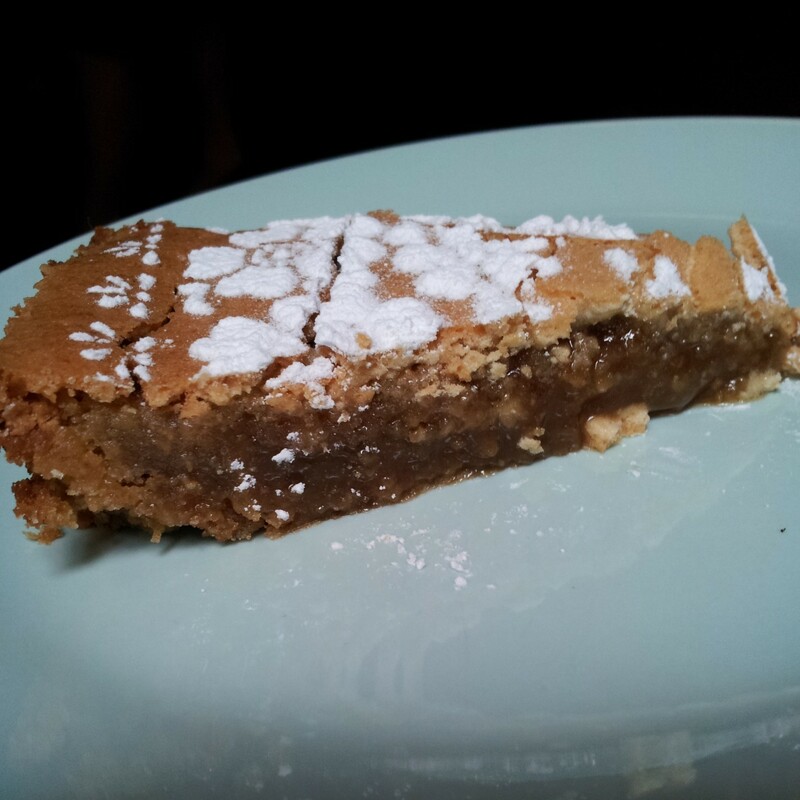 It’s an almost flourless sponge, made mainly from almonds, so it can cope with a bit of handling (or slicing into more layers). It also benefits from a heavy layer of ganache to retain moisture in the sponge. There’s a lot of real chocolate in this cake, so it’s as chocolately as it’s ever going to get, rather than just adding cocoa powder. This is the real deal. 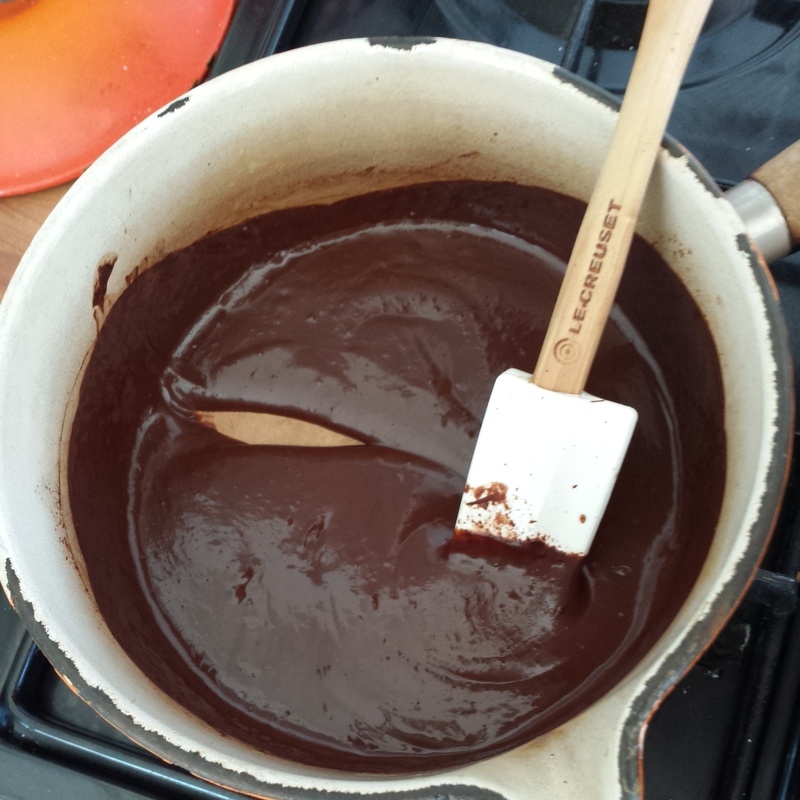 Using a bain marie is the best way to melt chocolate (in my opinion) without burning it. Melt the chocolate gently with a bowl suspended over a pan of boiling water. Once the chocolate is melted, leave it to cool slightly whilst you beat together the butter and sugar until it’s light and fluffy. The slightly cooled chocolate can then be beaten into the melted chocolate along with the vanilla extract. 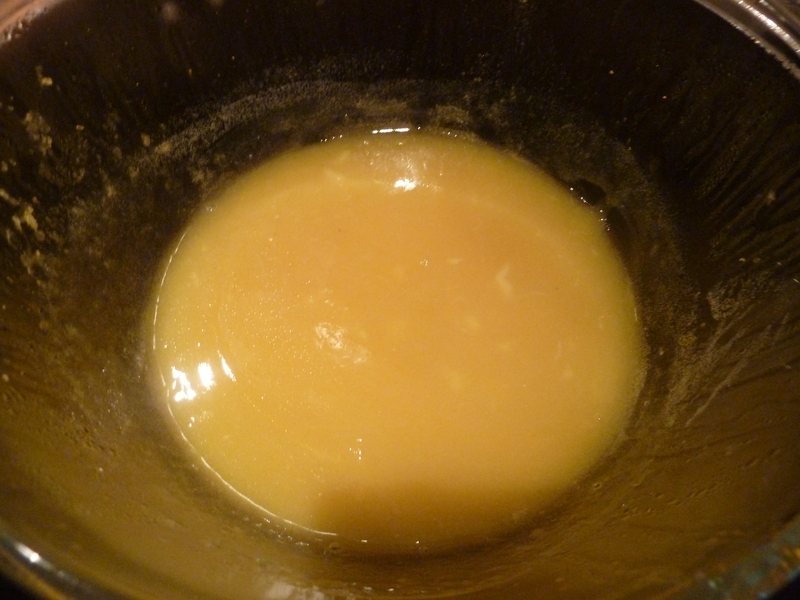 Then whisk in the egg yolks one by one until the mixture is nice and thick. 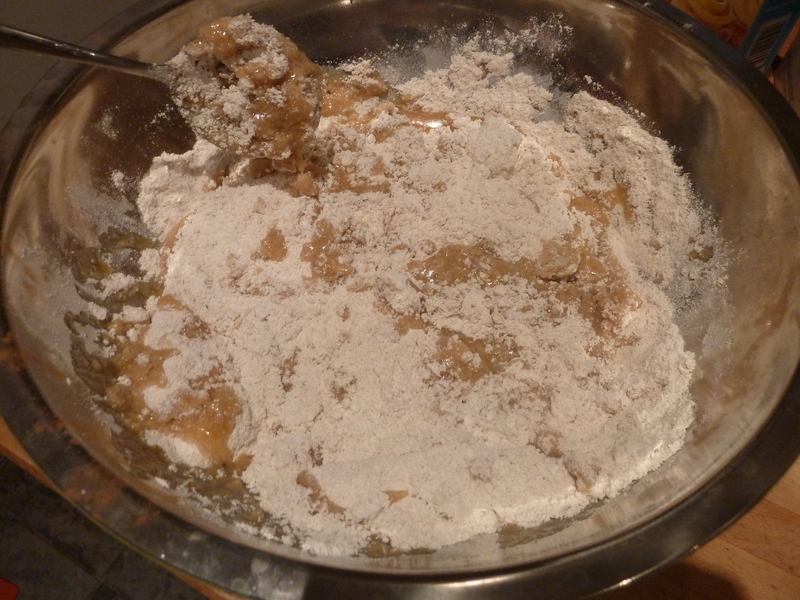 The ground almonds and flour can then be introduced and folded into the chocolatey egg yolk mix. 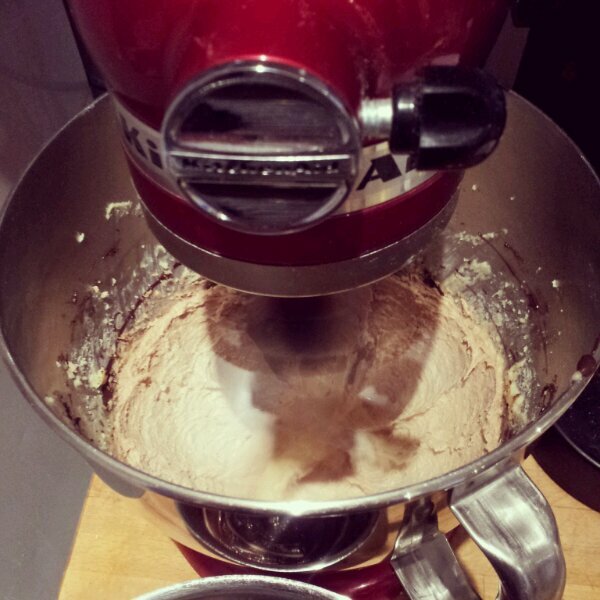 If like me you have a stand mixer you can do a little cheat here. 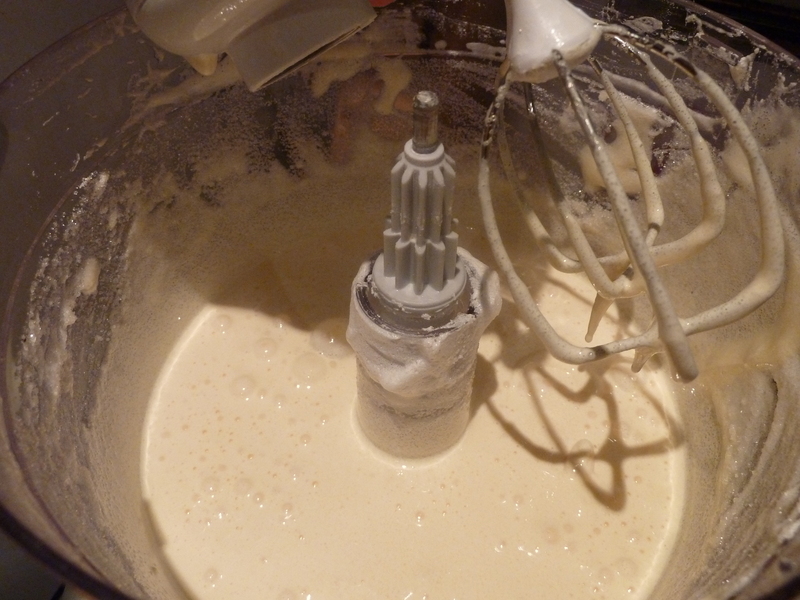 I used my hand held electric whisk to the egg whites to a fluffy state whilst I set my Kitchenaid to task whisking mix the chocolate and egg yolks together in a separate bowl. This helped to save a bit of time and energy on my part. Don’t worry if you don’t have a stand mixer however you could easily whisk your egg whites after you’ve finished the egg yolk mix. The egg whites need to be whisked to incorporate as much air into them as possible as this cake doesn’t have any other raising agent to help it do the job. 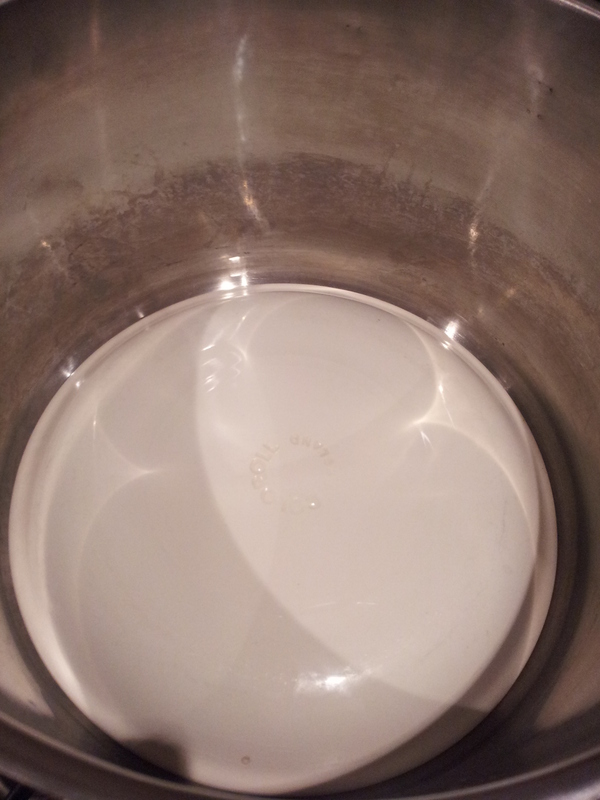 The whites should be whisked for about 2-3 mins at a slow speed until frothy and bubbly. 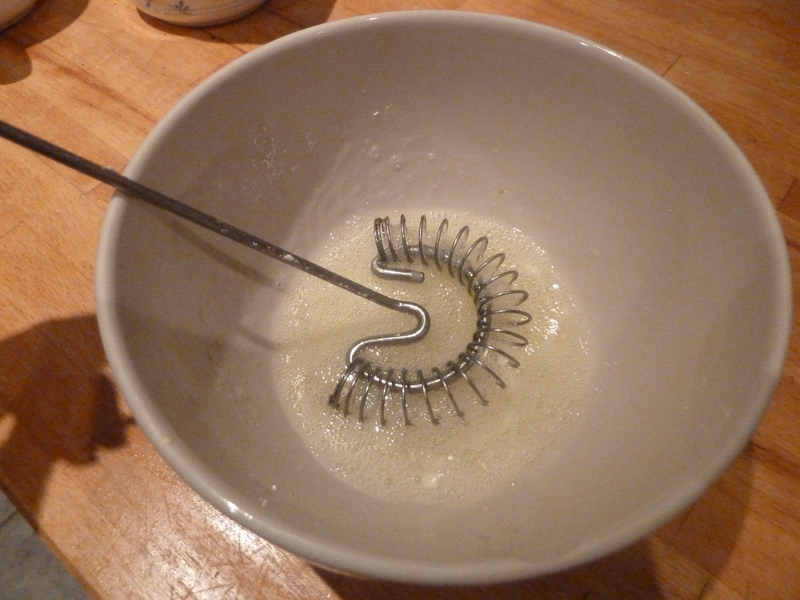 Then increase the speed to high and continue to whisk for about 4-5 minutes, until the whites are stiff but not dry. 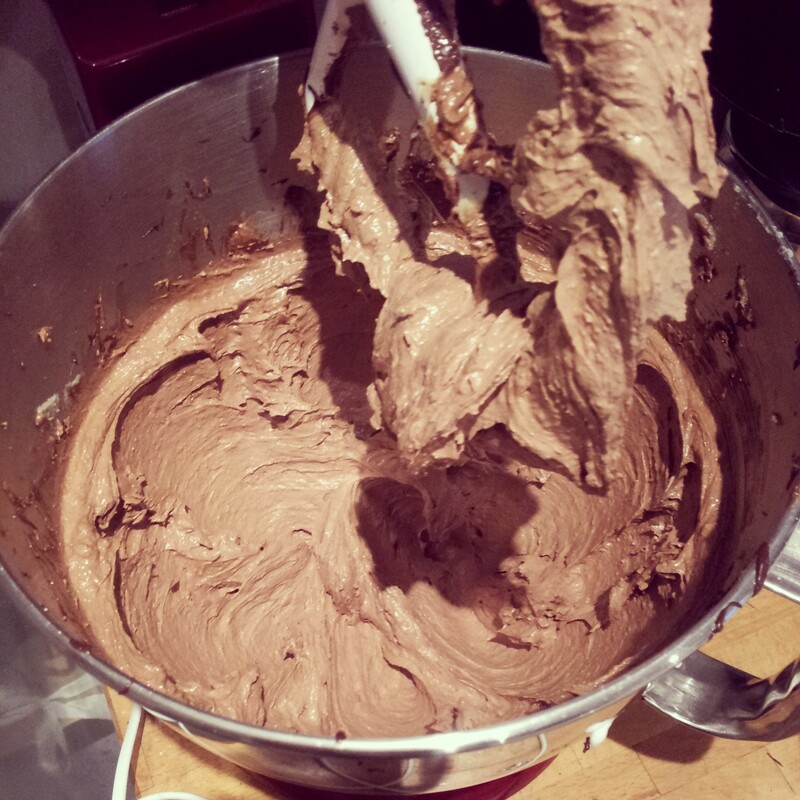 Add a good dollop of the chocolate egg yolk mix to the egg whites and fold in gently to help loosen the mixture up. Then carefully spoon the rest of the chocolate mix into the egg whites and fold in, very gently ,to preserve as much air as possible in the mixture. 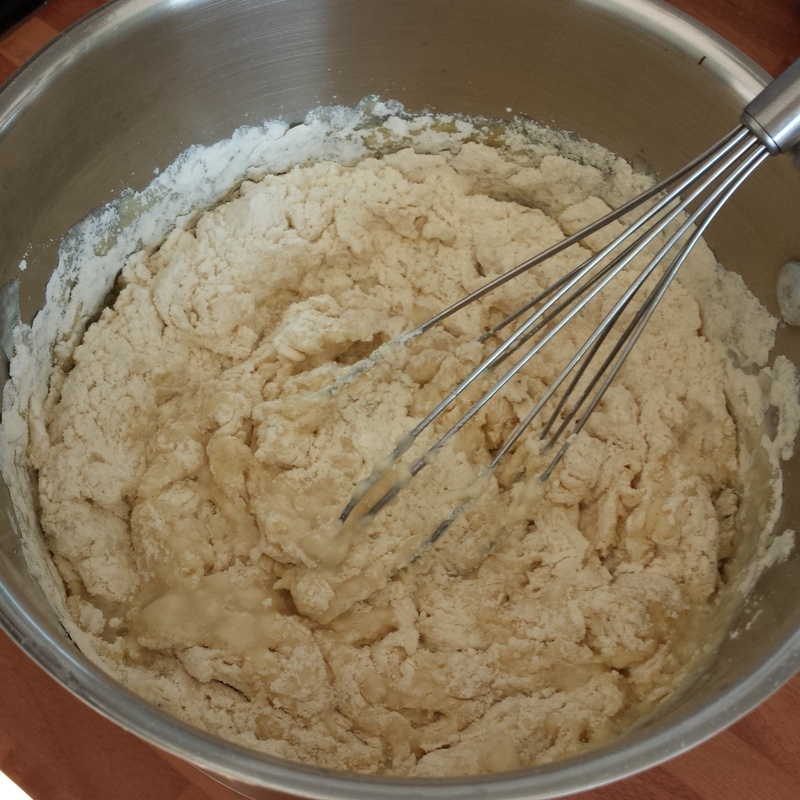 Once it’s all combined (and there’s no tell tale spots of egg whites floating about) the batter is good to go. 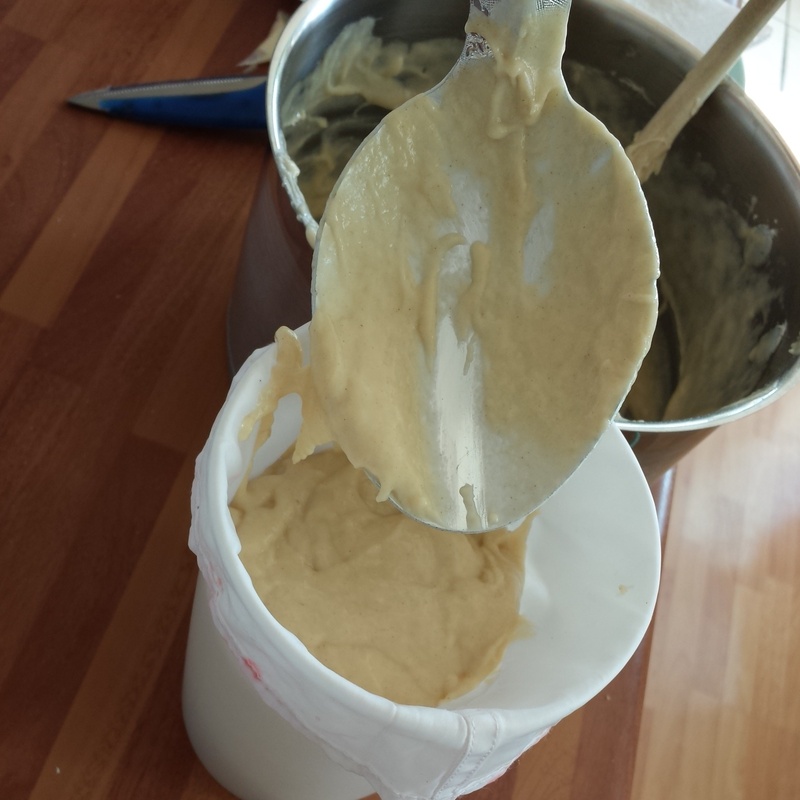 Carefully pour the batter, (holding the bowl as close to the tin as possible so you don’t knock any of the air out of the mixture) into a greased and lined 9 inch round tin and smooth the surface down with a spatula, making sure there’s no holes or lumps. 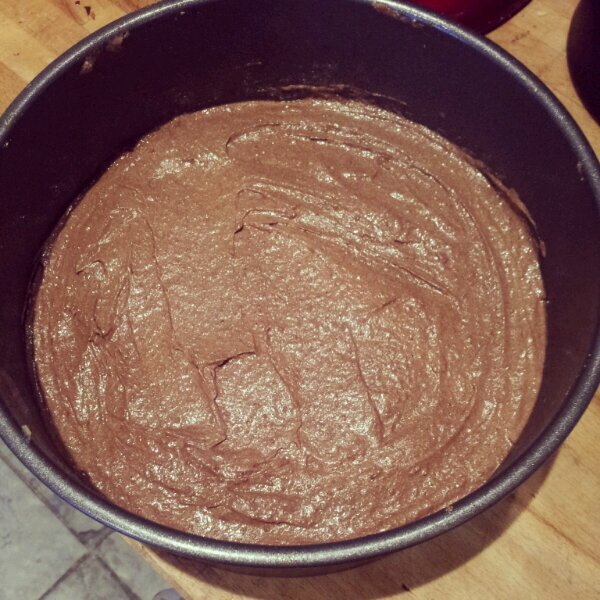 Bake the cake in the centre of your preheated oven at 180 degrees C for 40-45 minutes. 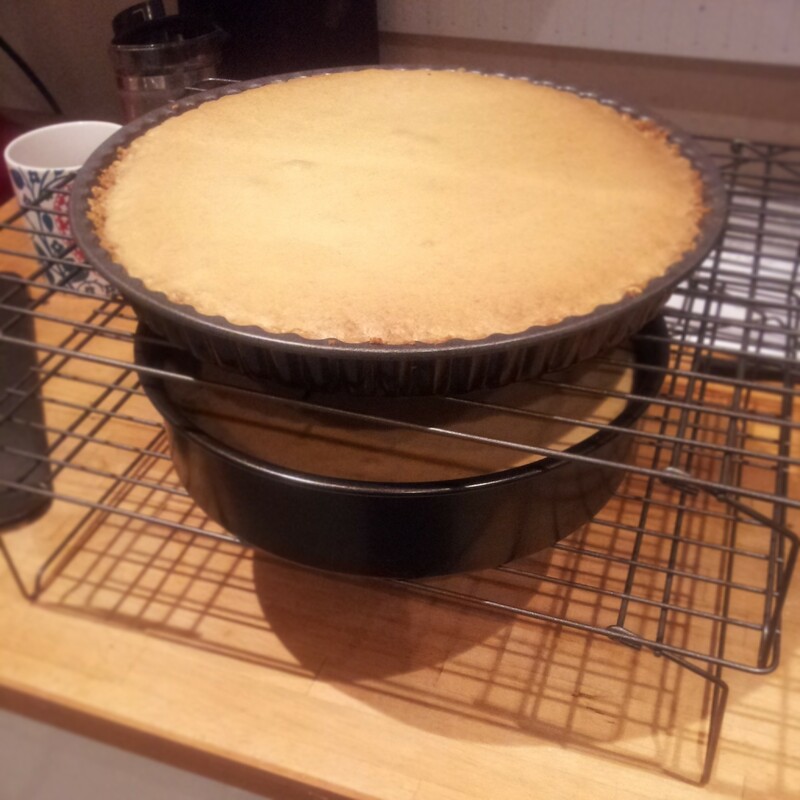 Once the cake is thoroughly cooked, you can tell this as a cocktail stick when inserted will come out clean, the cake will shrink back from the sides of the tin slightly and when pressed in the centre the cake will spring back. Leave it to cool in the tin slightly and then tip it out onto a wire cooling rack. 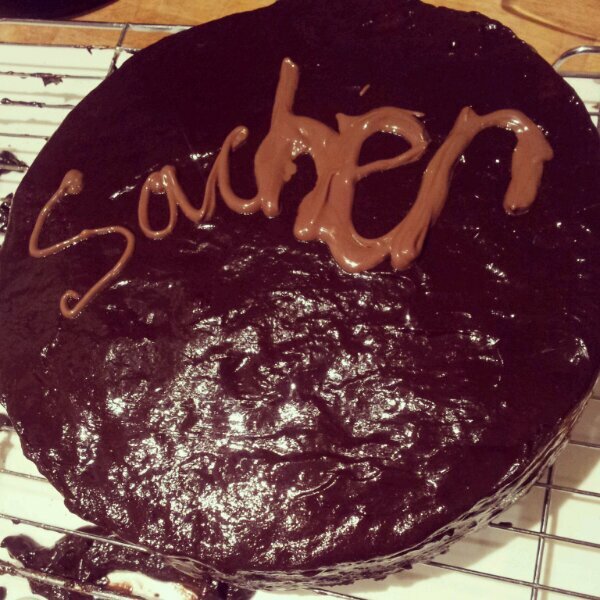 You may remember the Sachertorte from the Great British Bake Off technical challenge in series 2. 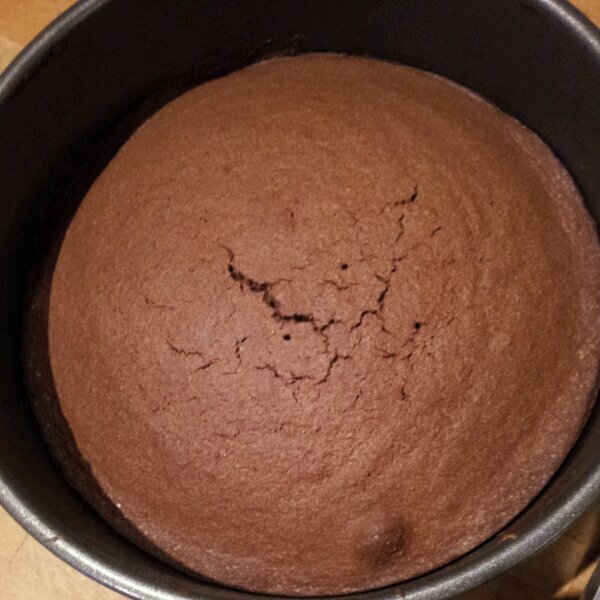 Mary Berry insisted that you had to use the top of the cake so it had to be as flat as can be. I’m not that strict so I use the lovely flat bottom of the cake as my smooth top, although either end of the cake would be fine to use, as it was in fact rather flat. The cake really needs to be entirely cold before you take a knife to it. I’ve learnt this lesson the hard way and broken many a cake cutting into it while it’s still warm too eager to start the layering process. It always ends in tears and much smaller cake than I envisioned. So patience my friend and a really sharp knife. I find it easier to swivel the cake round and hold the knife in the same place to (attempt) to get an even slice. I find it easier to cut the top layer off first and work my way down. Using a palette knife to support the cake to carefully lift each layer off and pile them up on a plate. 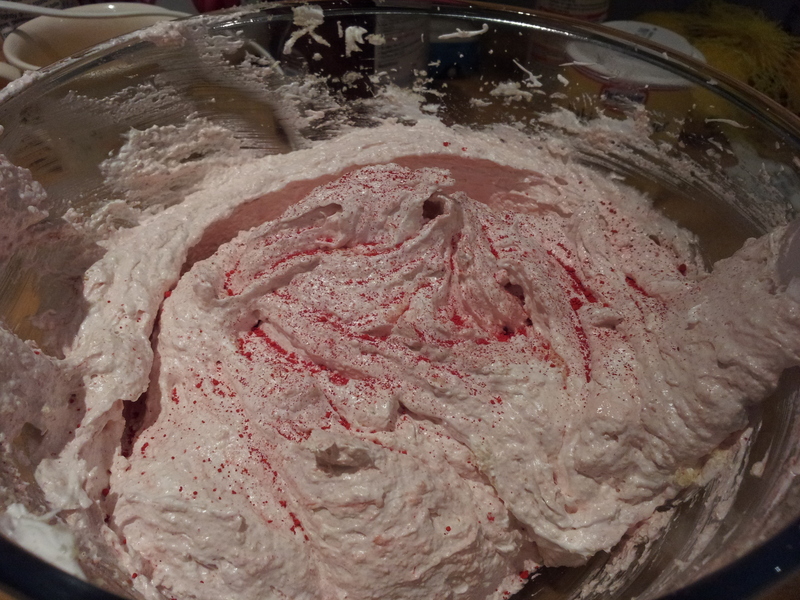 While your slicing up your cake into 3 layers, pop the cream in a pan and heat it to almost boiling point. Take it off the heat and add two thirds of the the broken dark chocolate. 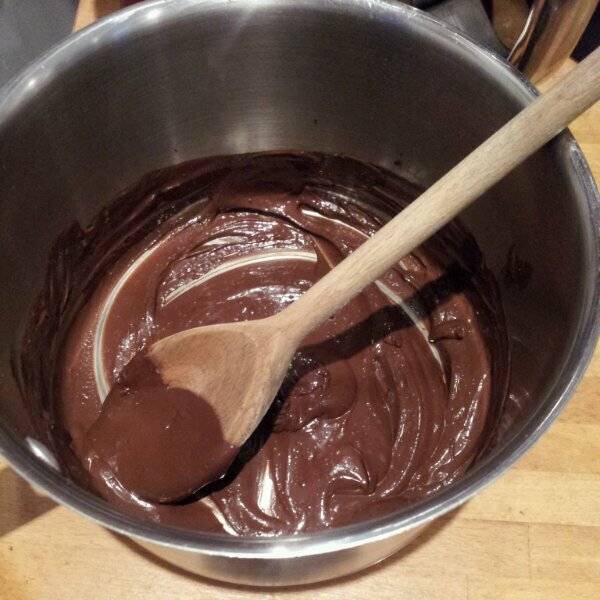 Keep stirring the ganache until the chocolate is fully melted and add the final third of the chocolate. Continue to stir until it’s glossy and smooth. As this was a birthday present I bought a cake board to pile the cake onto. I sterilised the board with a little orange brandy, to get the party started. 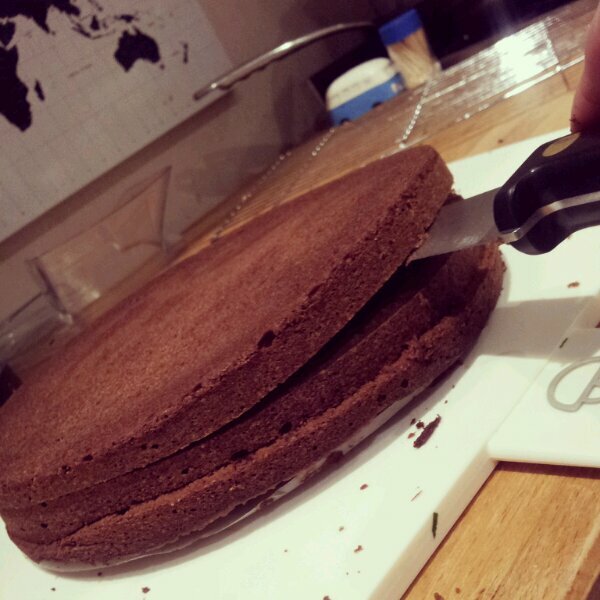 Taking the bottom layer (which technically was the top of the cake previously when it was baking in the tin…confusing?) 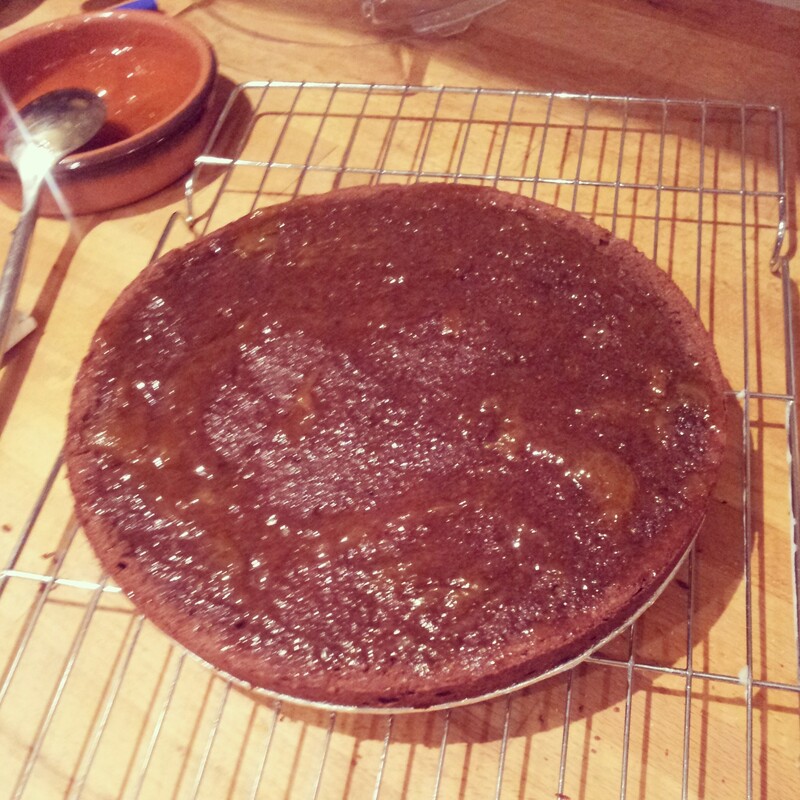 I sat the sponge on top of a splodge of warm apricot jam on the cake board to hold it in place. The jam must be heated to make it extra runny and also to sterilise it, as you want your cake to keep well. 40 seconds in the microwave should do it, but don’t boil the jam! Smear a generous coating of warm apricot jam onto the sponge, to act as a barrier against the ganache so it doesn’t seep too far into the sponge. 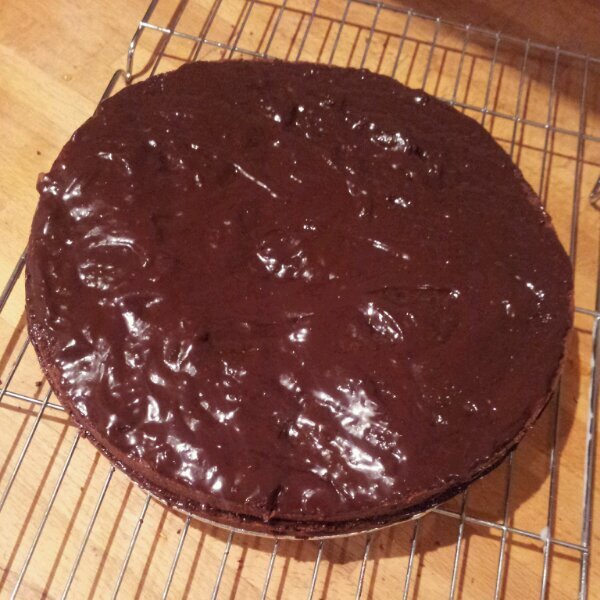 Then add a nice layer of ganache and plop the next sponge layer on top. Repeat for the next 2 layers. The final layer will need to be neat and tidy so pour the ganache all over the top of the cake and using a palette knife and gravity encourage the ganache to run down the side of the cake. You may need to even things up a little, holding the palette knife vertically and pressing it gently into the side of your cake, run the knife around the side of the cake to straighten up the edges. 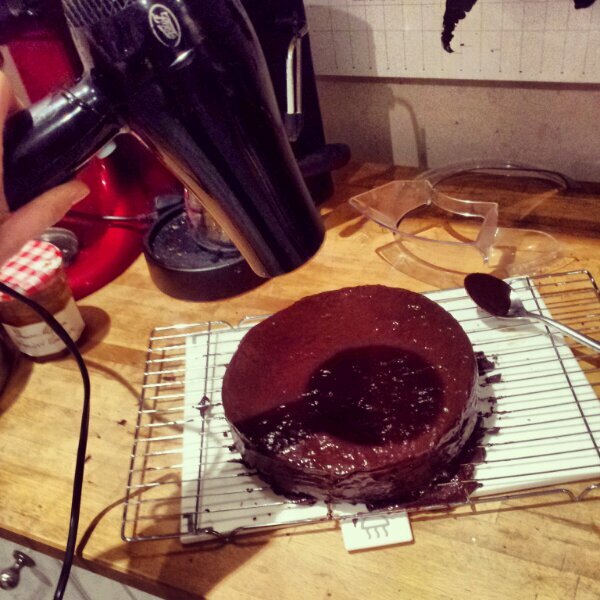 The ganache may start to set before you want it to, so keep a hairdryer to hand (yes a hairdryer- I haven’t lost my mind honest) to heat the ganache a little and allow you to continue to work with it. You can always tip the cake slightly to let the ganache flow around the top of the cake. Undoubtedly you will get ganache everywhere at this point, on your face, in your hair, up your arms and all over the kitchen, but that’s part of the fun. Keep some paper towels close by to mop up any spillages and to wipe excess chocolate off your palette knife. 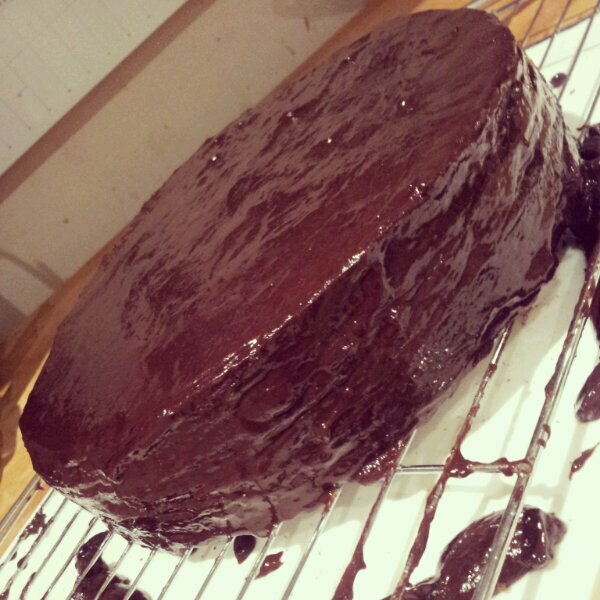 You’re also going to need a damp paper towel (or 10) to wipe the excess ganache off the cake board. Apparently it’s a really clever idea to put pieces of greaseproof paper under the sponge to catch the ganache which can then be disposed of later on. Or if your cake board is entirely flush to the cake (like mine), you could pop it on a wire cooling rack and let the ganache drip onto a plate underneath, ready to be used again, or eaten with a spoon (I’ll let you decide). The pièce de résistance. The chocolate ‘Sacher’ signature. The name of this wonderful cakes creator. You need milk chocolate to contrast against the dark ganache, melted and in a piping bag. Or like me you may use a sandwich bag with the tip snipped off. 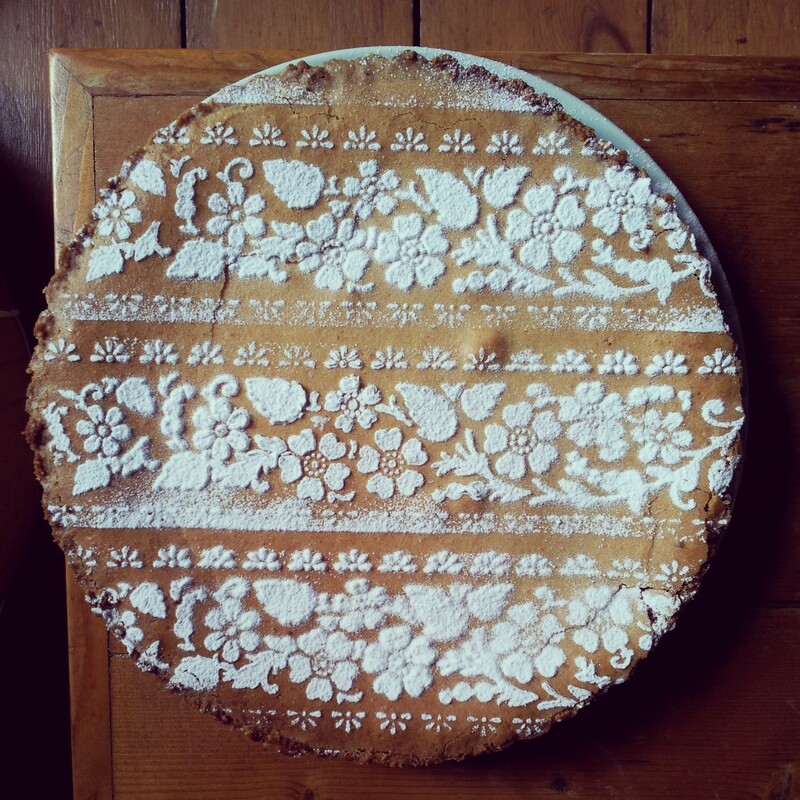 You only have one attempt at this, unless you fancy re – ganaching your entire cake, so no pressure. 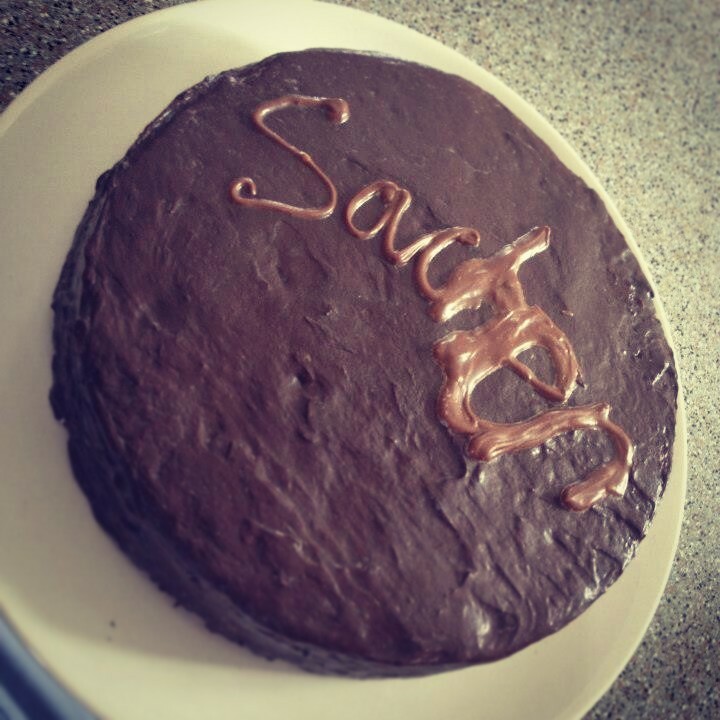 I made a right hash of it (sorry Adam) as my piping/sandwich bag exploded half way through dripping unslightly chocolate onto the cake which then had to be incorporated into the signature. Well my signature is certainly distinctive. But on a positive note the ganache is extremely glossy and mostly smooth. Perhaps I should have stopped while I was ahead… Please note how nice and neat the ‘S’ ‘a’ and ‘c’ are. 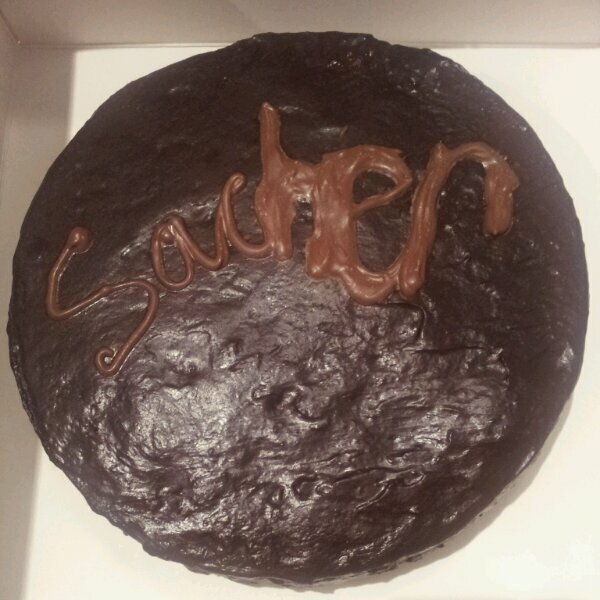 Maybe it’s a subliminal message to myself SacHER! Triple Layer Sachertorte! Happy Birthday Adam! Anyways I’m sure your chocolate handwriting skills will far surpass mine. I’m assured that it tasted lovely despite how rustic it actually appeared… I boxed it up and delivered it complete with sparkler candles to wish Adam a very happy 30th Birthday! 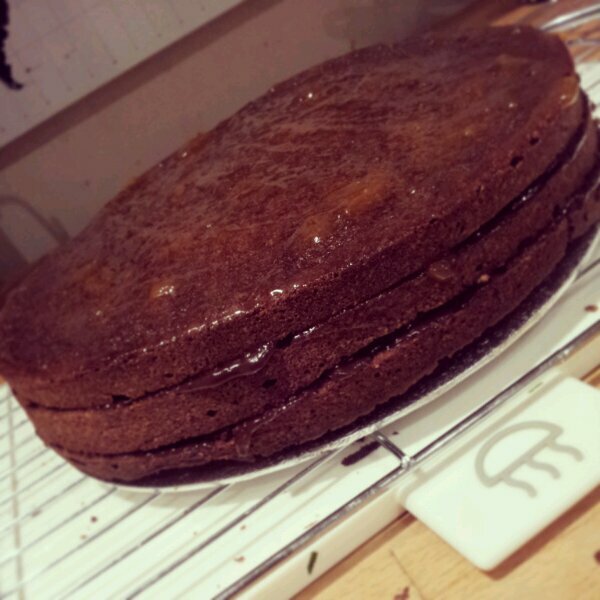 I wanted to try making a traditional one layer Sachertorte just to make sure I could definitely do it right, second time round and definitely not because I’m a greedy guts. I absolutely love this cake. It’s a moist sponge and improves (as most cakes do) when left for a day or two to cut it. 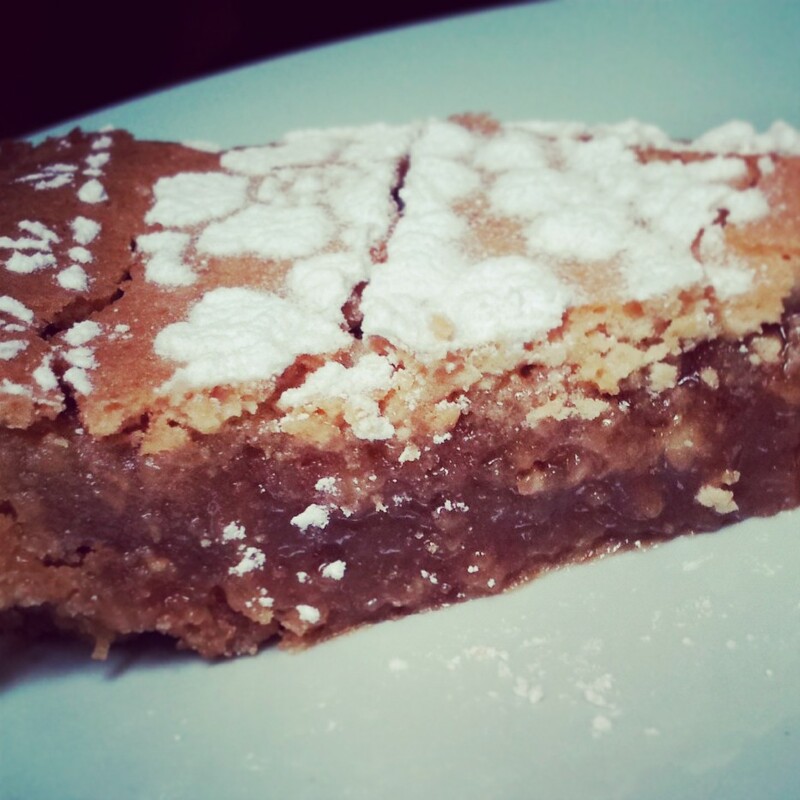 I must admit that home made was actually more moist than the shop bought cake we sampled in Berlin. The apricot jam infuses the chocolate with a gorgeous fruity flavour, balancing out the slightly bitter dark chocolate ganache with the sweetness of the jam. The ganache is smooth and luxurious and means the sponge keeps really well. One thing to note, if you store your cake in the fridge your ganache will lose it’s shine so it’s best to keep it at room temperature if you want to see it glisten in the birthday candle light. It’s a classic celebration cake that will be loved by everyone. Happy Christmas – The Rosca de Reyes results are in! Wow what a year this has been indeed! 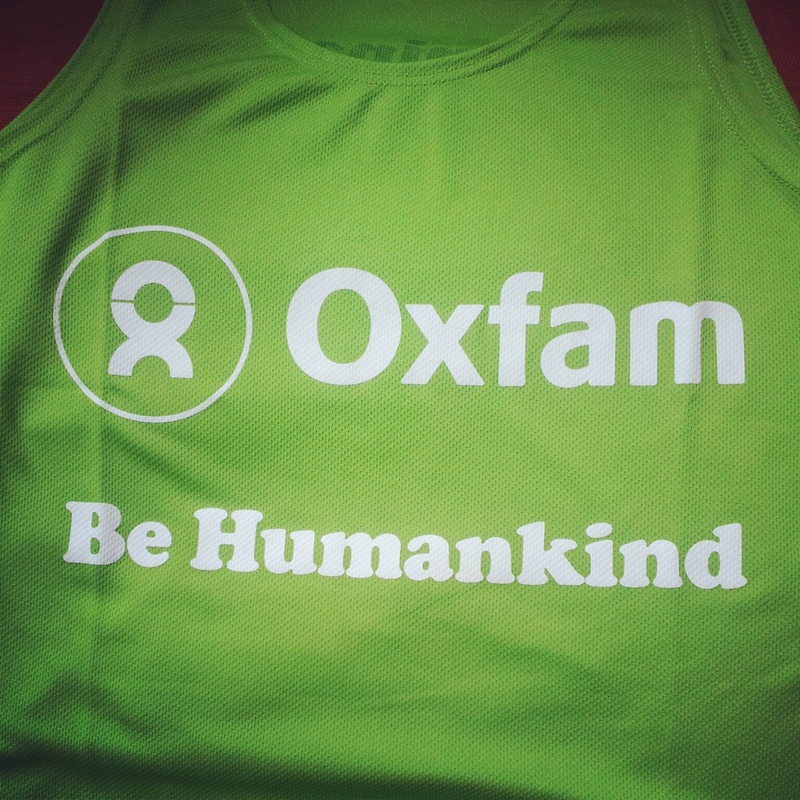 We’ve made it over half way around the world in 80 bakes, ran my first half marathon (raising over £700 for Oxfam! ), baked (and devoured) some wonderful (and some not so wonderful…) cakes AND been very lucky indeed to win the Blog North Best Food and Drink Blog Award. And that’s not even the end of this amazing year’s excitement, it doesn’t all finish there! I’m very excited to let you know that I won the online bake off and £500 of holiday vouchers for my Rosca de Reyes 3 Kings Cake! Amazing! Thank you all so much for reading, commenting and also voting for me. I can’t thank you enough for your support and love. We will be using the £500 of Cosmos Holiday vouchers to book our honeymoon in the new year, a trip somewhere hot and relaxing will be perfect after our wintery wedding (which is taking place in less than 2 days…)! Fingers crossed the cake stays upright! The lucky winner of the £50 very.co.uk voucher is Jenny B. 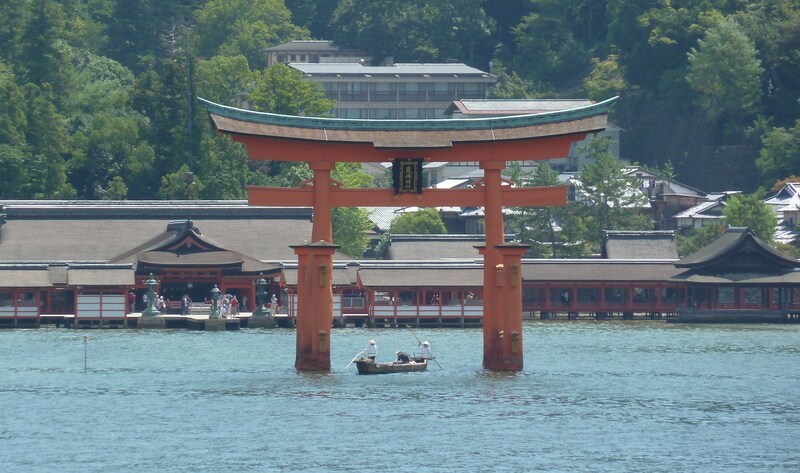 The company will contact you directly to arrange your voucher. Thank you so much for voting! I can’t go without mentioning the 4 brilliant bakers and bloggers, in the Rosca de Reyes bake off. They are exceptionally good bakers and I’ve been enjoying their blogs for over a year now and follow them all on twitter. I really recommend checking out their blogs, if you haven’t done so already. They are very talented and inspirational foodie bloggers. I hope you all have had a wonderful Christmas and are looking forward to the New Year as much as me. I will be returning shortly as a married baker, with a new name and everything. 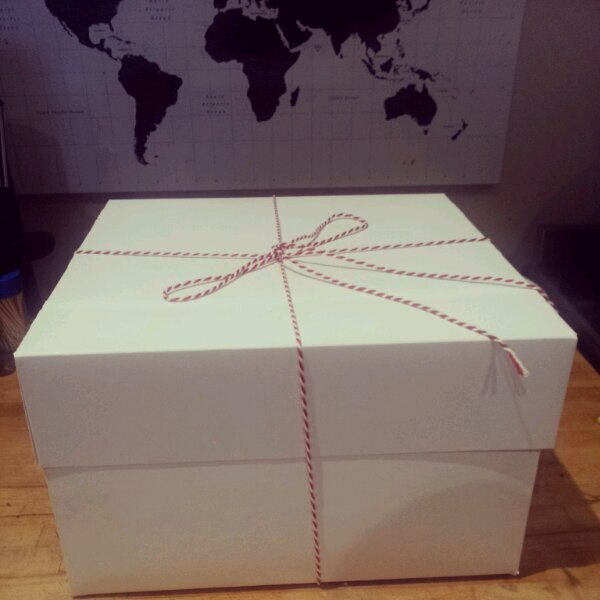 Looking forward to letting you know how my biggest challenge so far pans out… my 5 tier wedding cake! Lots of love and happy new year! p.s Now would be a perfect time to have a go at baking your own Rosca de Reyes to celebrate the Epiphany on January 6th. p.p.s. My golden Rosca de Reyes – 3 Kings Cake even got a mention in the The Mirror within an article about Christmas eats and treats around the world! Can this be real? 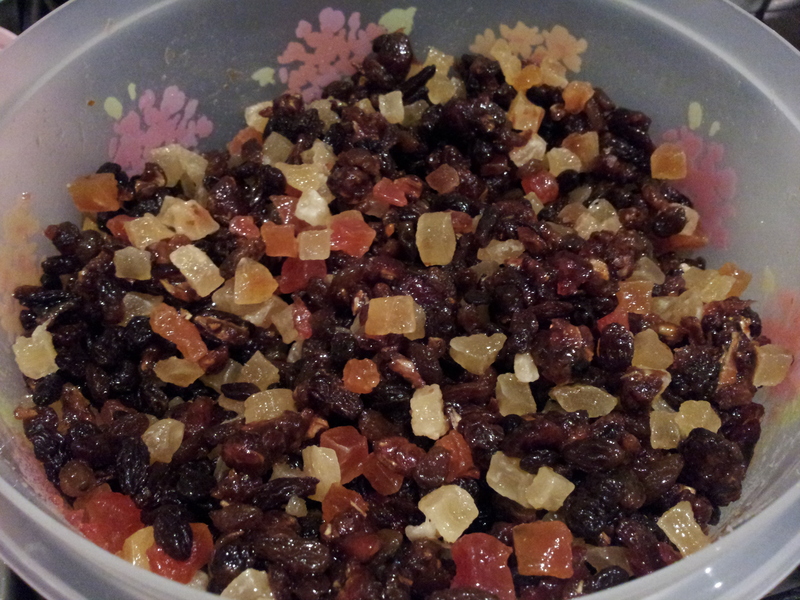 Is there such a thing as a healthy Christmas Pudding when you soak your fruit in booze and add copious amounts of sugar? Well according to the Great British Bake Off (series 2 cookbook) it is. So what’s the difference you may wonder? It’s breadcrumbs, would you believe and no suet!! 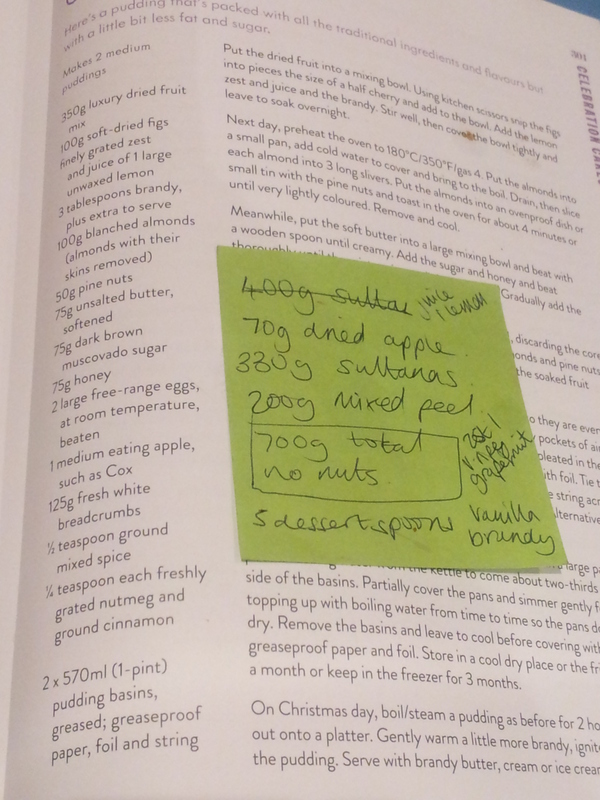 Obviously I can never leave a tried and tested recipe alone so I accidentally modified it… I decided to make it nut free, adding the equivalent amount of dried fruit in place of the nuts to soak in the booze. Then promptly forgot about my decision and added the nuts as well. This will surely be an extra fruity pudding! 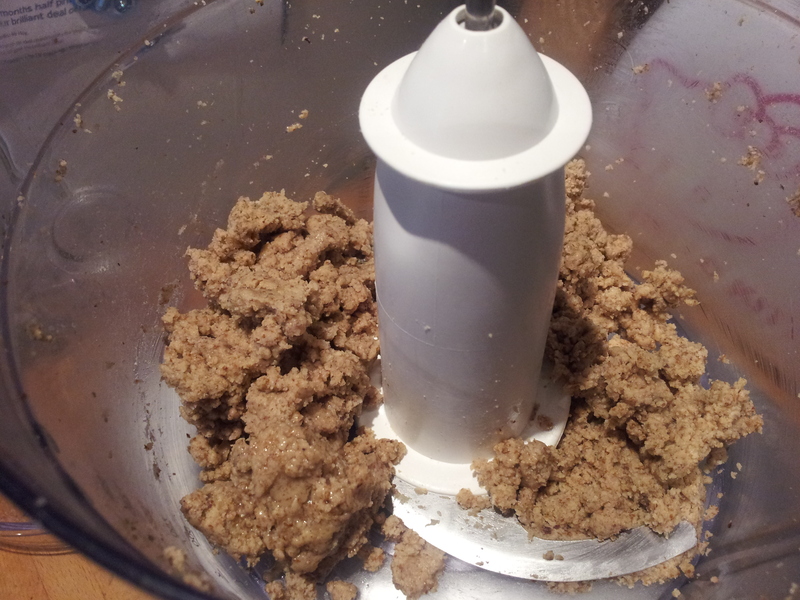 I have only attempted one Christmas Pudding, an original Bero recipe, full of suet and other wonderful stuff. However it didn’t cook all the way through despite it’s initial 3 hours of steaming and the additional steaming on Christmas Day itself. The breadcrumbs required a little preparation so a quick blast in the hello kitty toaster and a whizz with the blender makes some lovely breadcrumbs and decorates the kitchen beautifully in bread dust. 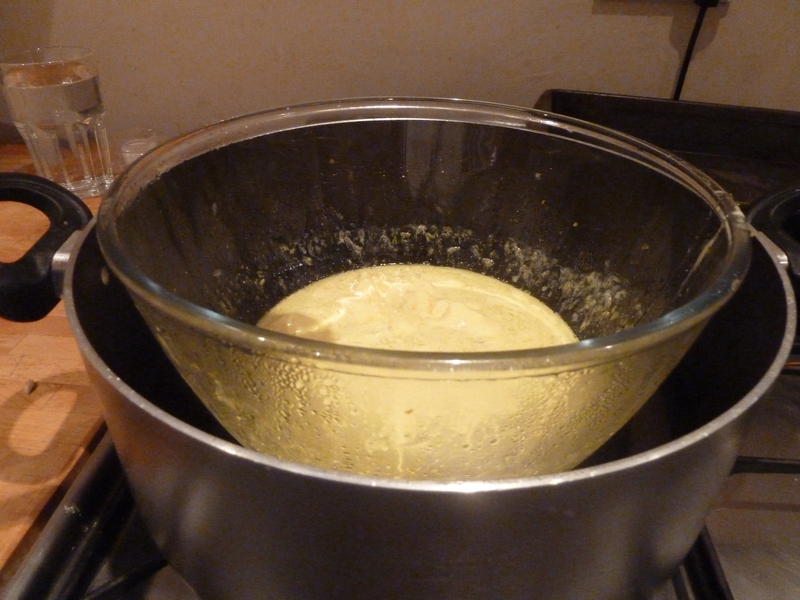 Whilst the bread is toasting you have time to whisk together the butter, honey and sugar until light and fluffy. Then to whisk in each egg individually. 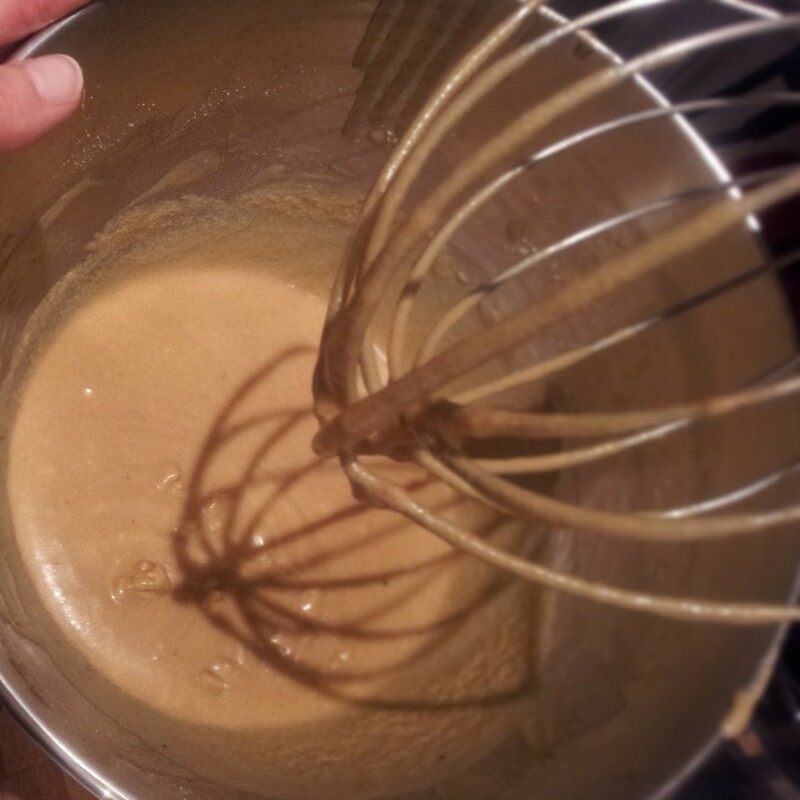 The more you whisk the lighter the pudding, so whisk away! 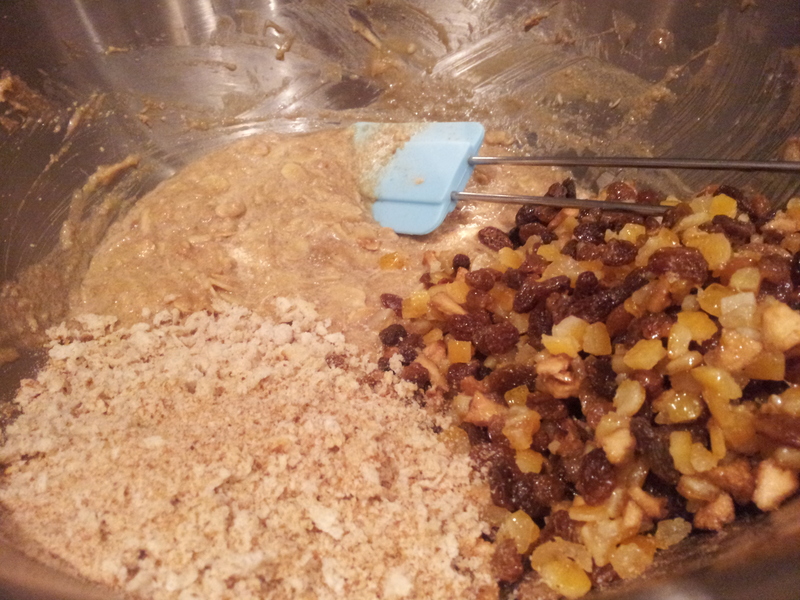 Then to stir in the grated apple, spices, (nuts) and brandy soaked fruit. 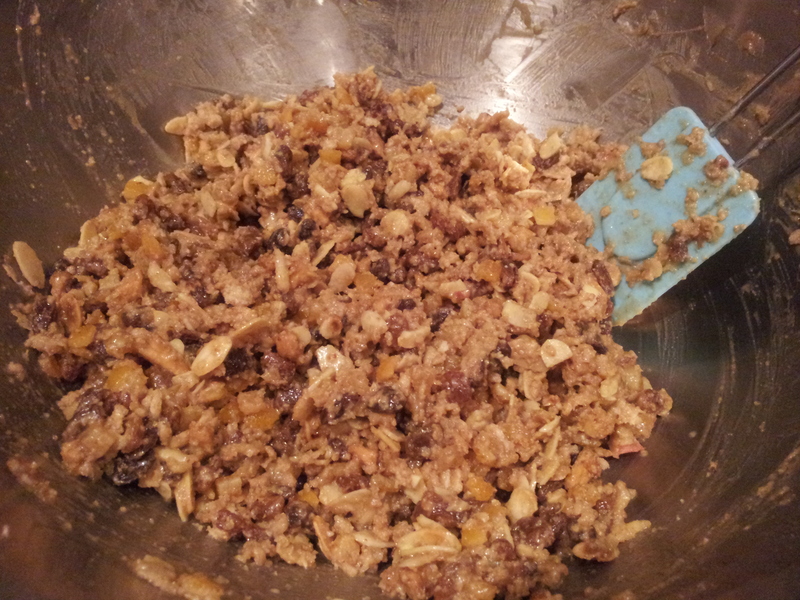 With the grand finale stirring in the toasted breadcrumbs along with the dried fruit. 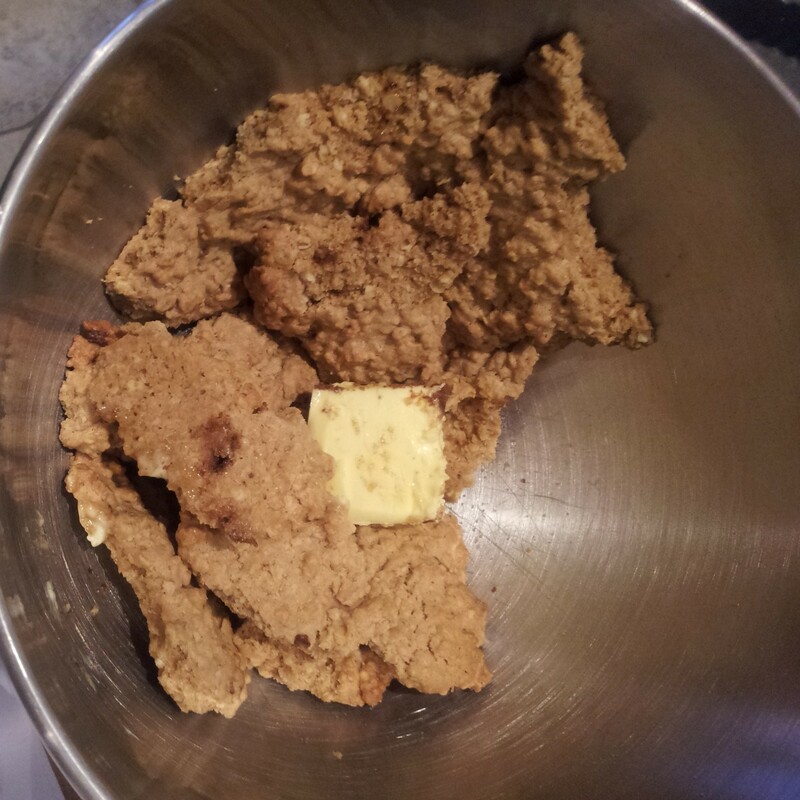 This forms quite a pale and loose mixture Once it’s all mixed together well it’s ready to be spooned gently into your pre prepared greased pudding bowls. 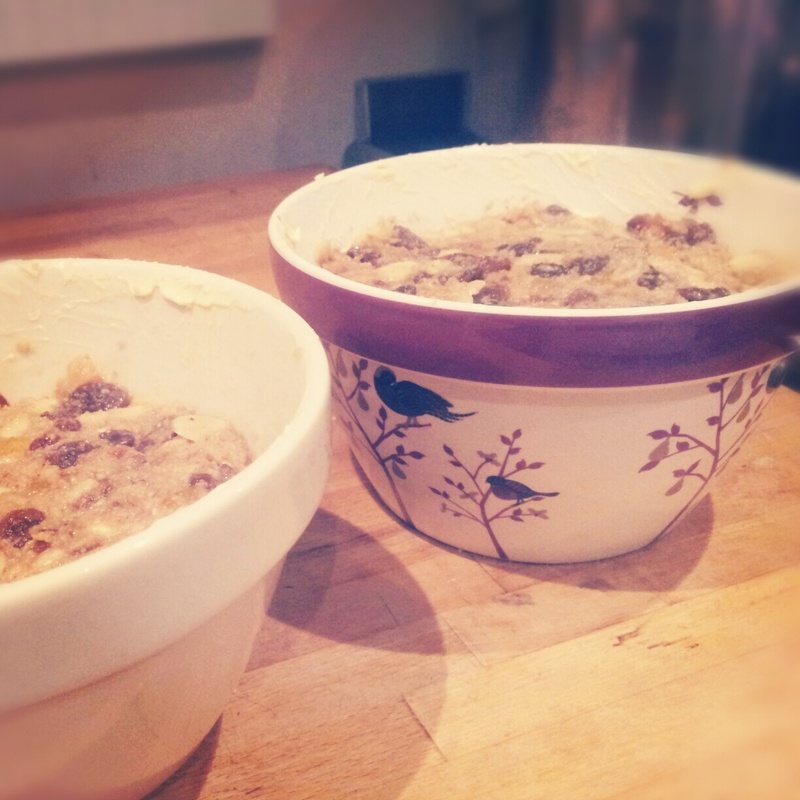 This recipe is enough to make two Christmas puddings. I used a 1lb bowl and a 3/4 1 lb. bowl. Fill the pudding basins until at least 3/4 full and make sure the pudding is level by pushing the mixture level with a spatula and tapping the bowl gently on the worksurface to release any air bubbles. Then for the exciting bit! I’ve read so much about wrapping puddings in greaseproof paper with a pleat (a double fold about an inch wide) in it to allow room to expand as the pudding steams, but never before have I actually had a go at it! 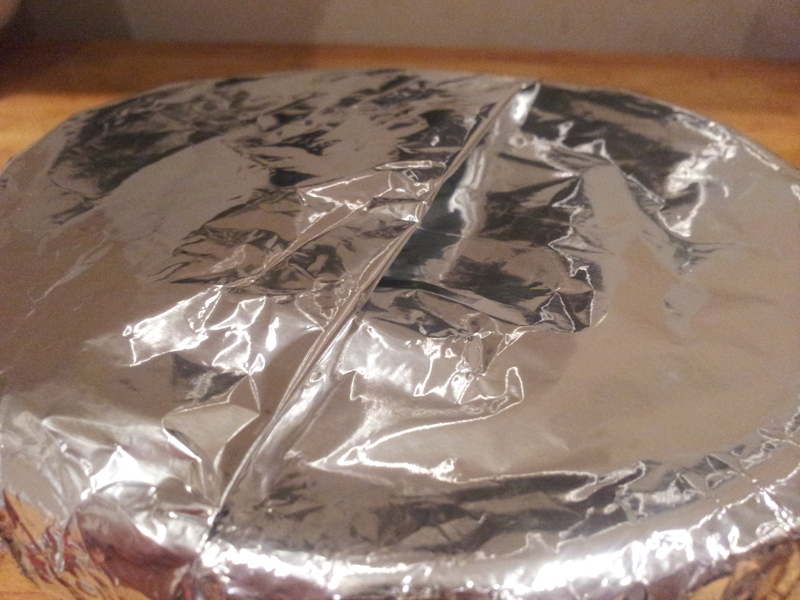 Both puddings needed a lid made out of a layer of greaseproof paper and tinfoil (both with wonderful pleats) before being trussed up like a turkey in lashings of my trusty cotton string. There is definitely a knack to this technique. My theory is always to tie stuff as tight as possible, it needs to be water tight, (you don’t want to drown your pudding when you submerge it in your pan of boiling water) and when in doubt add more string and tin foil. 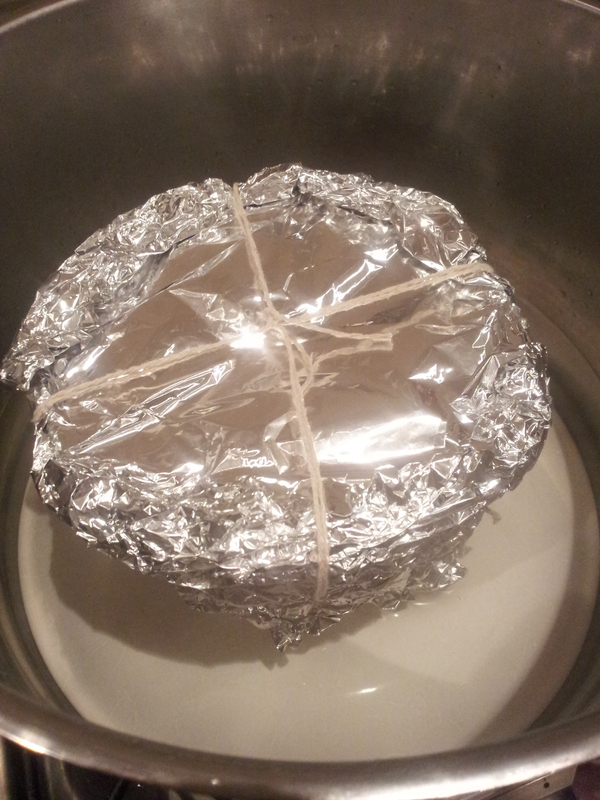 I added a full coat of tin foil, wrapping the pudding basin from the bottom to ensure the water couldn’t seep into the pudding. It seemed to do the trick. I added an additional length of string, tying it to the string around the edge if the puddings to create a handy handle for lifting out in and our of the pot too. 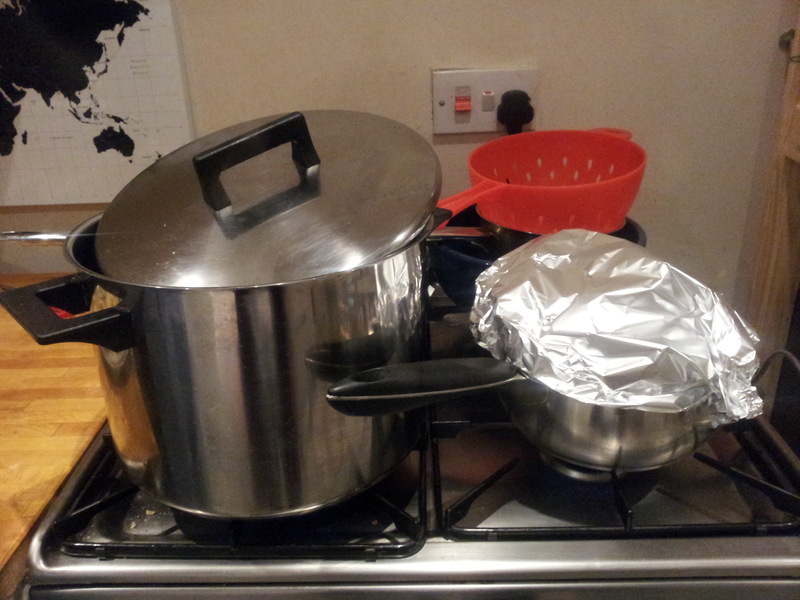 I had planned to economise and steam both puddings together however I failed to measure the pan…. So 2 separate pans were required to steam the little beauties. 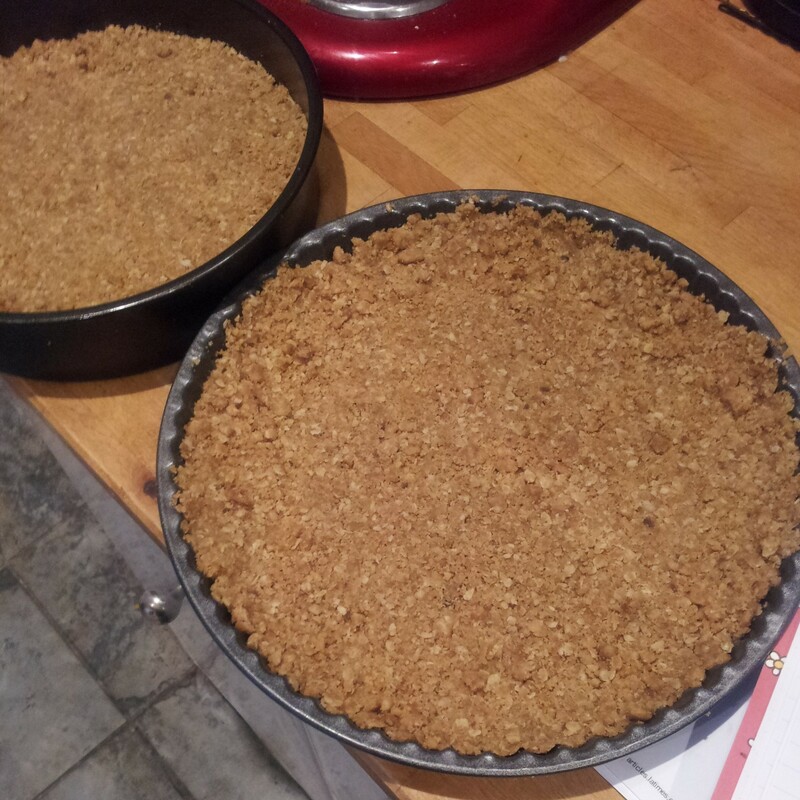 After 3 hours remove the puddings from the pans and allow to cool. 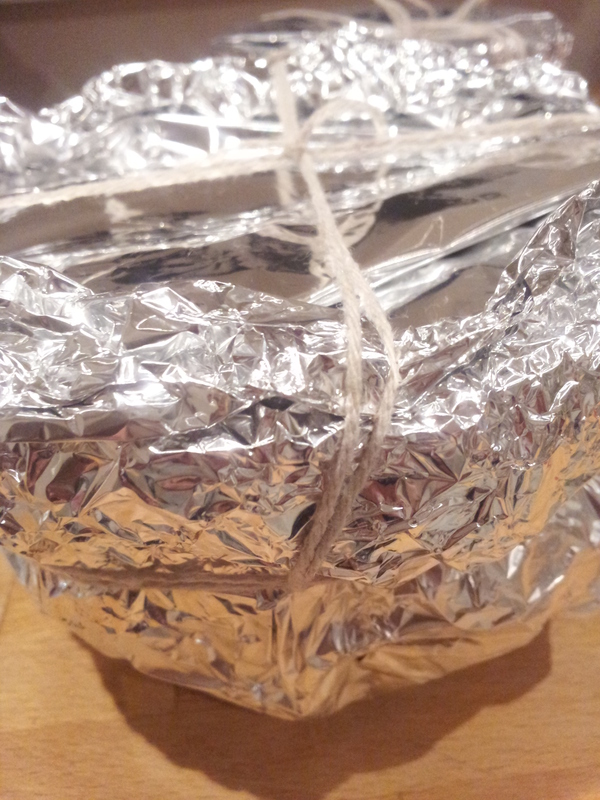 Take off their tin foil and greaseproof paper and wrap them with a fresh coat. 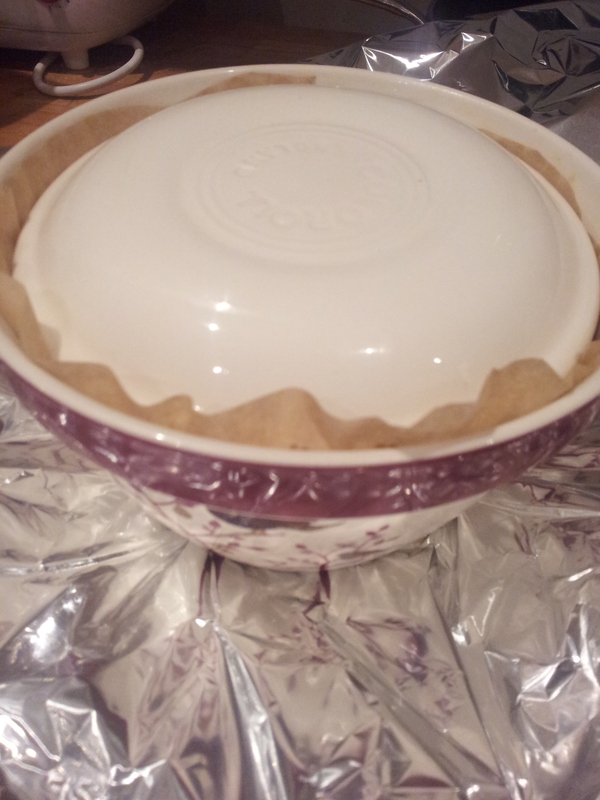 This will help to create a seal and prevent any mould from forming on your lovely puddings. I placed a clean saucer on the top of mine to weigh down the paper and create a good seal. 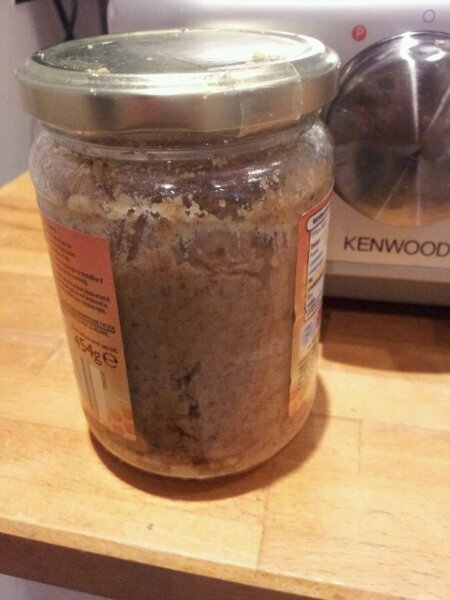 Apparently it’s very easy to make your own Raw Almond Butter and it’s supposed to be really good for you. (Especially, if like me, you’re training to run half marathons.) I had to give it a whirl. 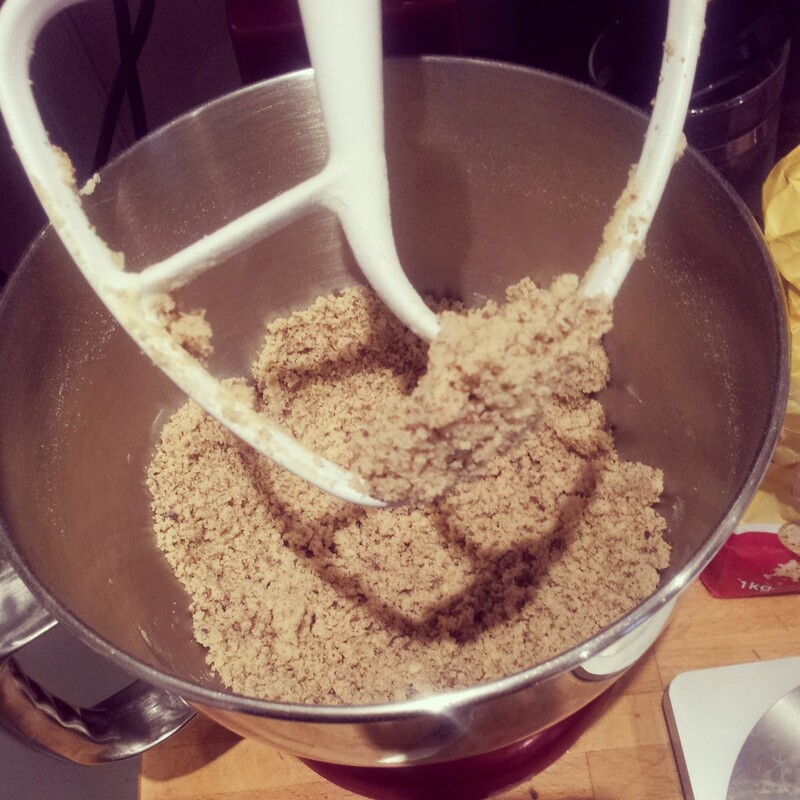 Perserverance is the key to making your own almond butter. 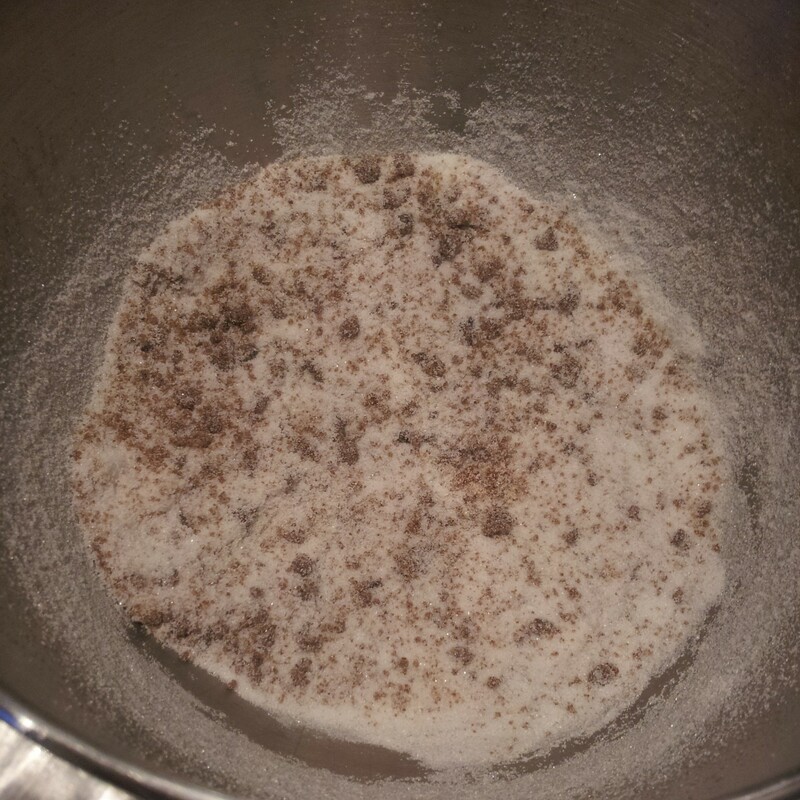 It should only take 10 minutes of whizzing up almonds in a food processor to produce wholesome wonderment… However an hour later my head and ears were buzzing from the incessant food processor screeches and I was getting a bit annoyed. 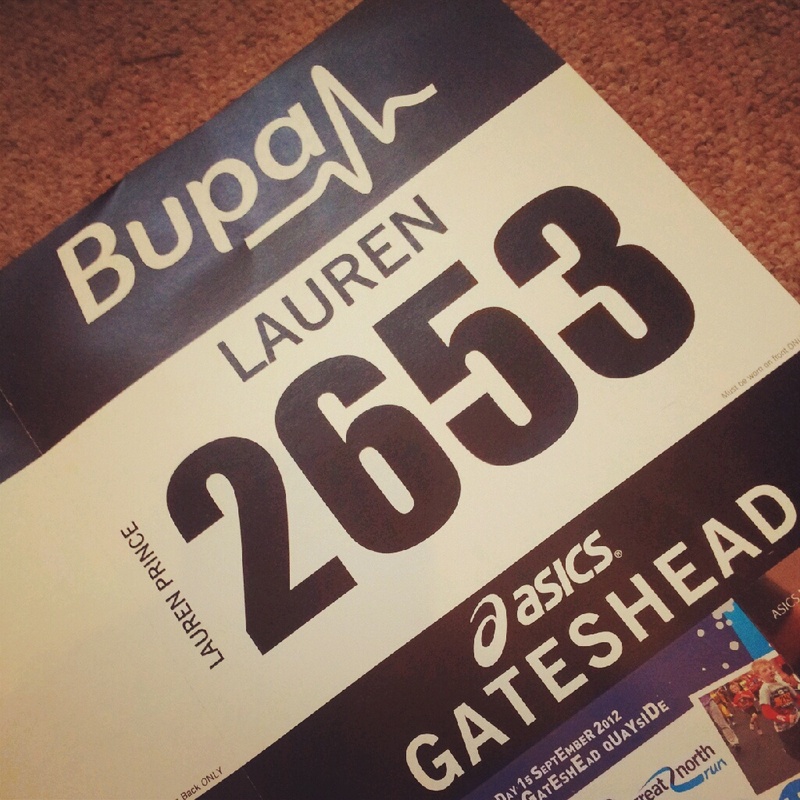 You may remember that in my wisdom this year, I have decided to run The Great North Run (all 13.1 miles of it) to raise money for Oxfam.I am trying my best to train as much as possible to gradually reach my target distance, but a few niggles have made the path to fitness nirvana rather steep. Entered (and completed) 3 competitive races! Yet I’m undeterred! In fact I’ve even threw myself in at the deep end. Running in the UK monsoon conditions, which others may call ‘the Summer’, with my eyes closed as it’s too difficult to keep them open (perhaps this is a talent that I didn’t know I possessed?) and an all terrain 10k trail run. Almond Butter, promised me a miracle. It’s a high protein food that is full of Vitamin E and supposed to help prevent sore muscles and ease my aching legs! Hurrah! AND I had a bag of almonds already in the cupboard. It had to be made. 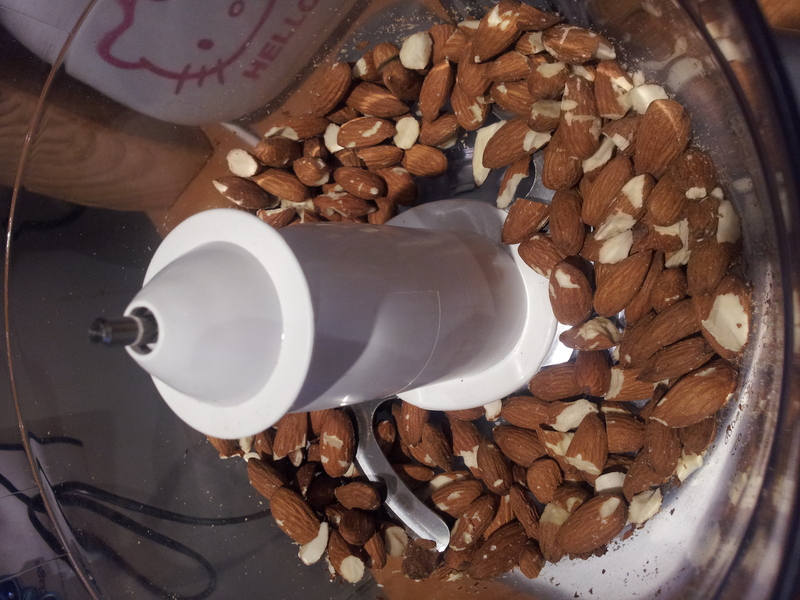 I threw a 200g bag of almonds (with their skins on) into the food processor and turned it up high. It wasn’t particuarly happy with this challenge, but with a little encouragement it ploughed through the almonds. 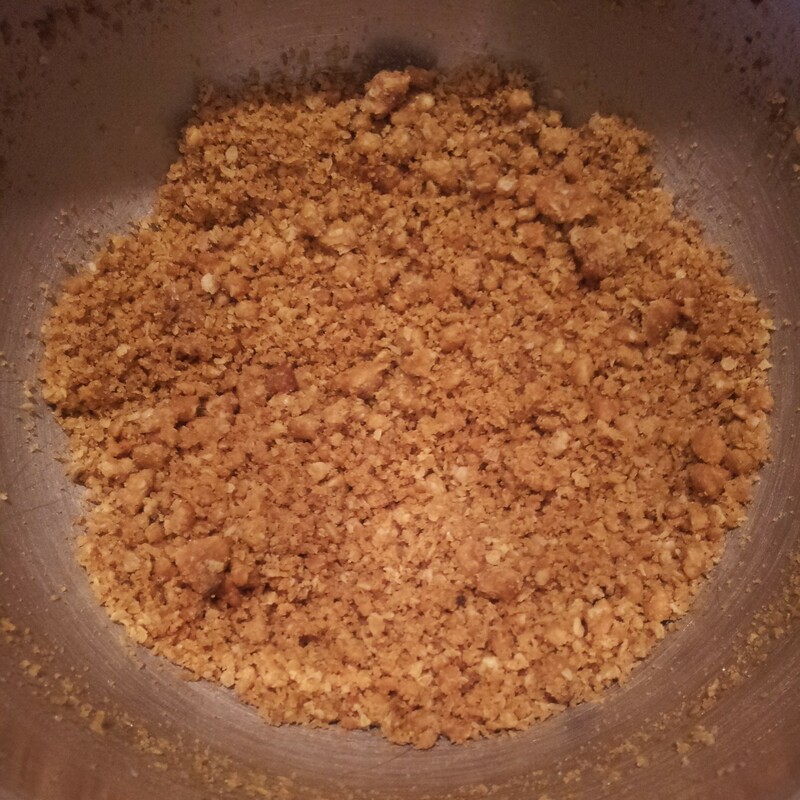 About 4 minutes in (and a bit a scrapping down the sides of the bowl)the almonds looked like ground almonds, the kind you would use in macaroons. 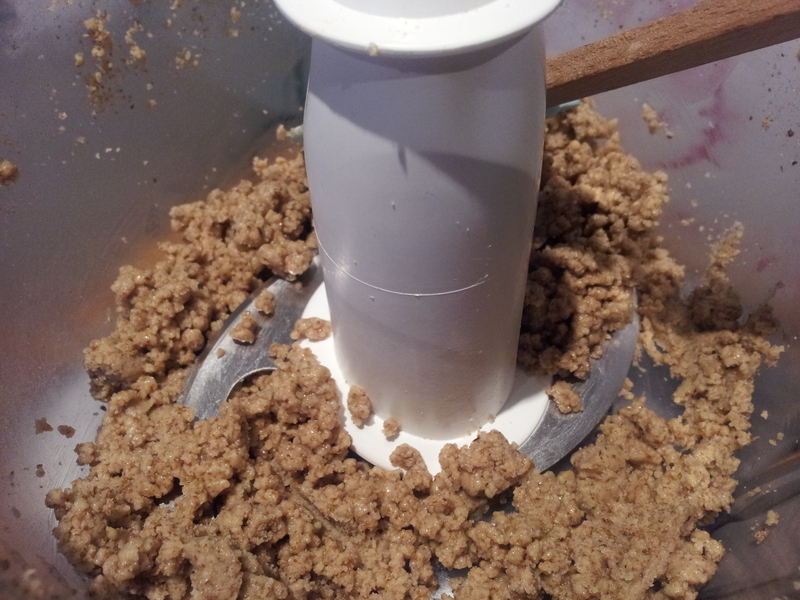 So you could make your own ground almonds from scratch too if you wished. The instructions said to keep going and blitz them up as much as possible. About 10minutes in the almonds should ‘release’ their oils. 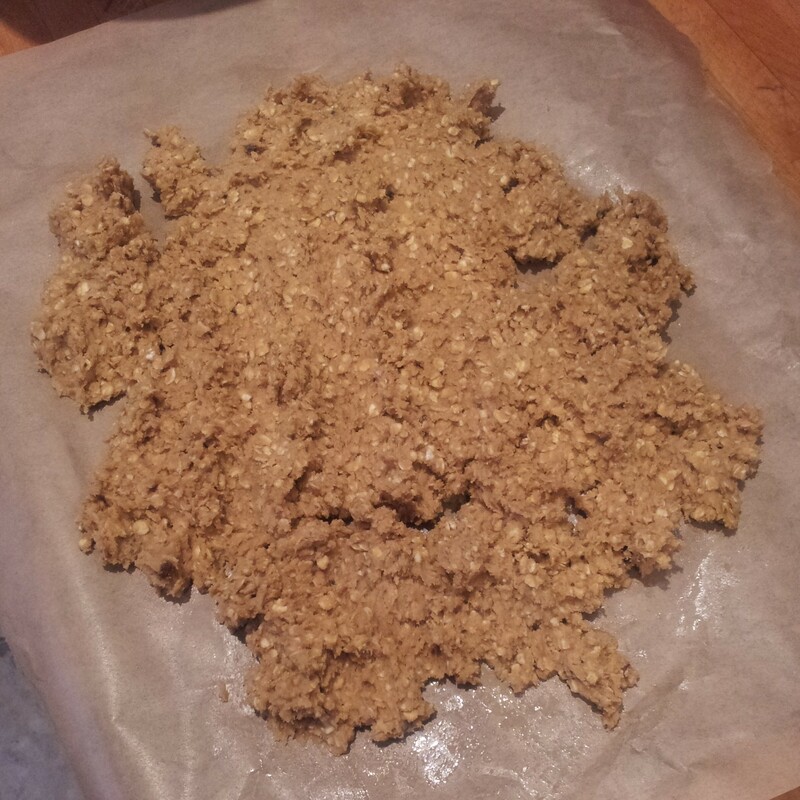 This means that the almonds should then ball up in to a nice big lump of almond butter. However mine did not. It just kept looking like scrambled eggs made out of almonds and sticking infuriatingly to the bottom of the bowl. I religiously scraped the bowl with my spatula to ensure all of the almonds were getting an even blitzing, so much so my spatula got a bit sliced up on the blade and had to go to spatula Heaven. RIP trusty spatula. 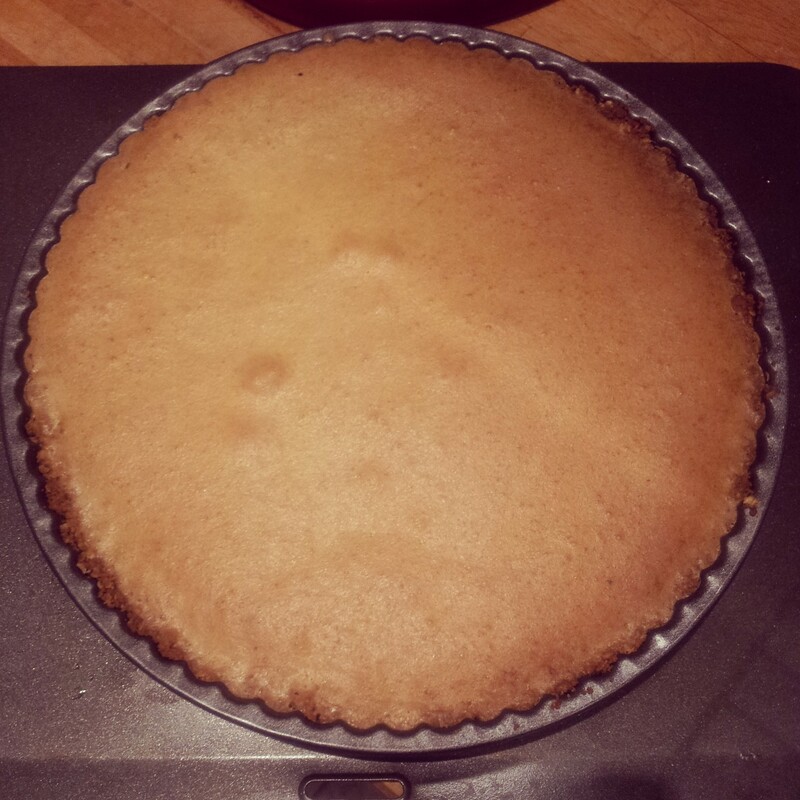 Adding coconut oil and honey – starting to come together…. Apparently you probably don’t need to add any oil to the mix as the almonds have enough oil to suffice. However I couldn’t get mine to stick together so I gradually added coconut oil, another super running food full of energy and good stuff (I clearly known my science stuff here) to help with those extra miles, until I got it to more of a paste like consistency. 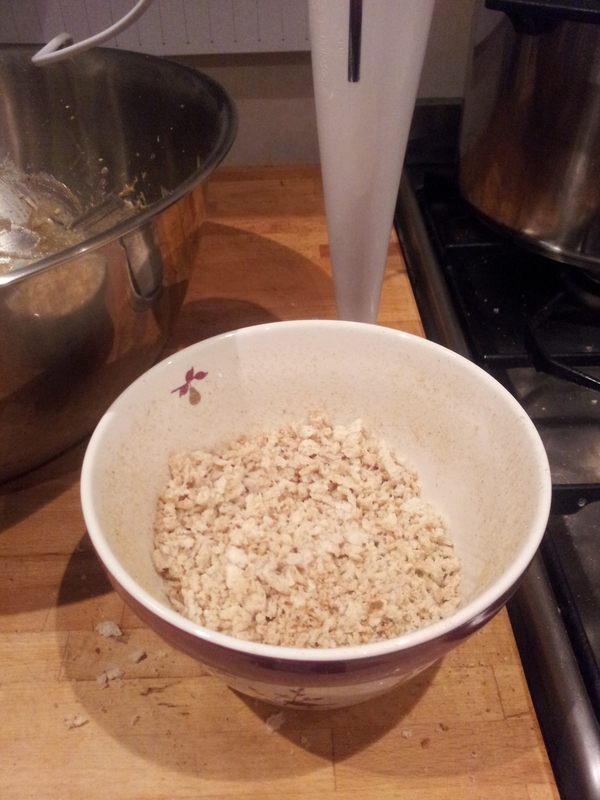 I also added a good slosh of honey to sweeten the mix, tasting it as I went to make sure it was to my liking. 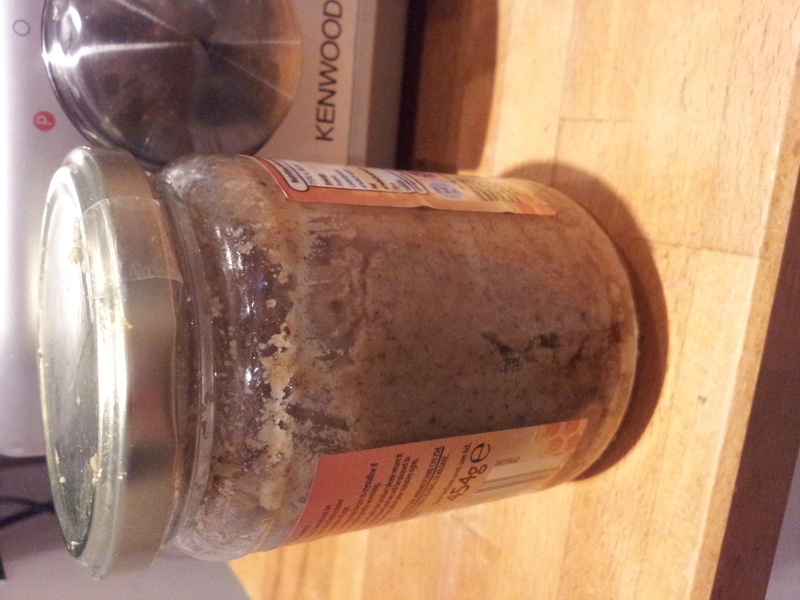 Eventually I realised that I wasn’t going to get a peanut butter smoothness or glossy texture so I declared my Almond Butter done and popped the lot into a jam jar, ready for my pre run toast. It is a little on the dry side and almost savoury (maybe I didn’t add enough honey or oil?!) but I quite like it. It doesn’t have any preservatives in it and it almost tastes healthy. You could use rapeseed oil or any other oil that you prefer too. As it contains no preservatives, it needs to be stored in the fridge as the almond oil may go rancid. However the honey may help to preserve it as it’s the only natural substance that does not go off! I’ve eaten a lot of sponge cake in China and sampled a few egg yolk sponges at my favourite Chinese Bakery, Bread Point, in town. It’s not half as eggy as it sounds. In fact they are a lovely light and moist sponge cake. 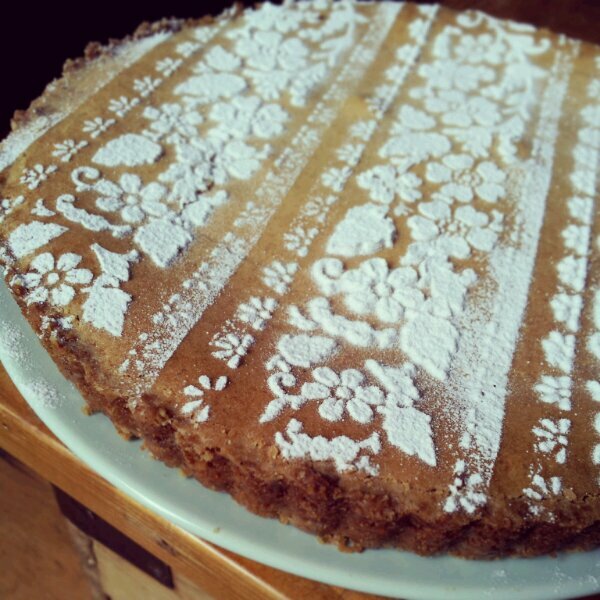 Almost like a Madeira Cake but a bit richer. In a bid to use up everything that I have in my fridge and cupboards I went on a baking spree. Baking 3 types of cake simultaneously, for my Mam’s birthday. I succeeded to use up EVERYTHING, and then went for a run in the rain. (I have to keep squeezing them in every chance I get!) 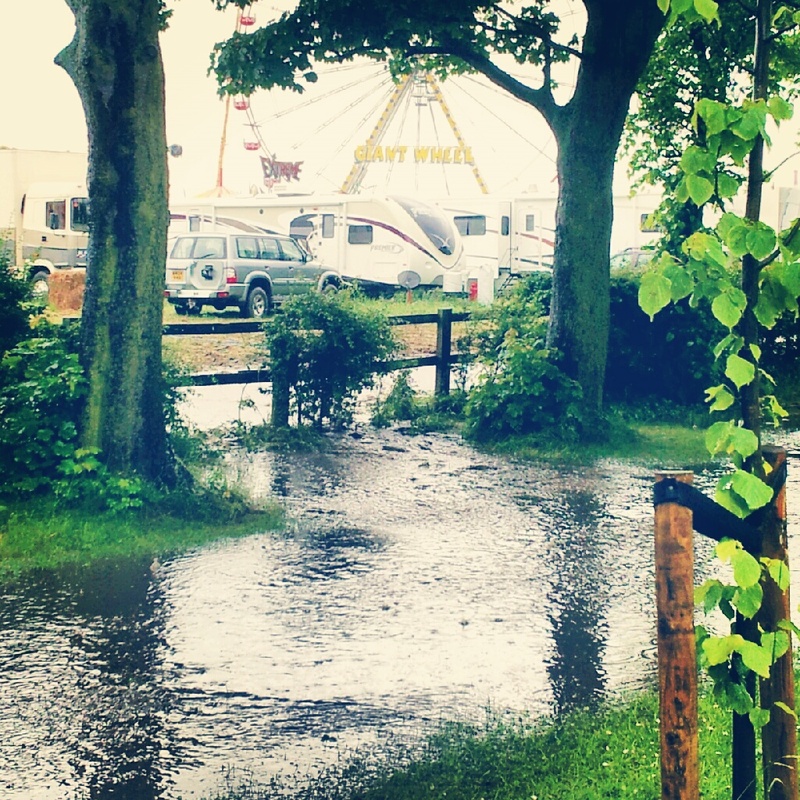 What an achievement for a rainy Jubilee Bank Holiday weekend. Although I forgot to actually bake anything regal or jubilee related. As I had used up the egg whites having another bash at macaroons I had 3 egg yolks left over to create the Egg Yolk Sponge Madeleines. I started by whisking the egg yolks and whole egg together with my food processor using the whisk attachment for about 5 minutes until they became thicker and lemony coloured. 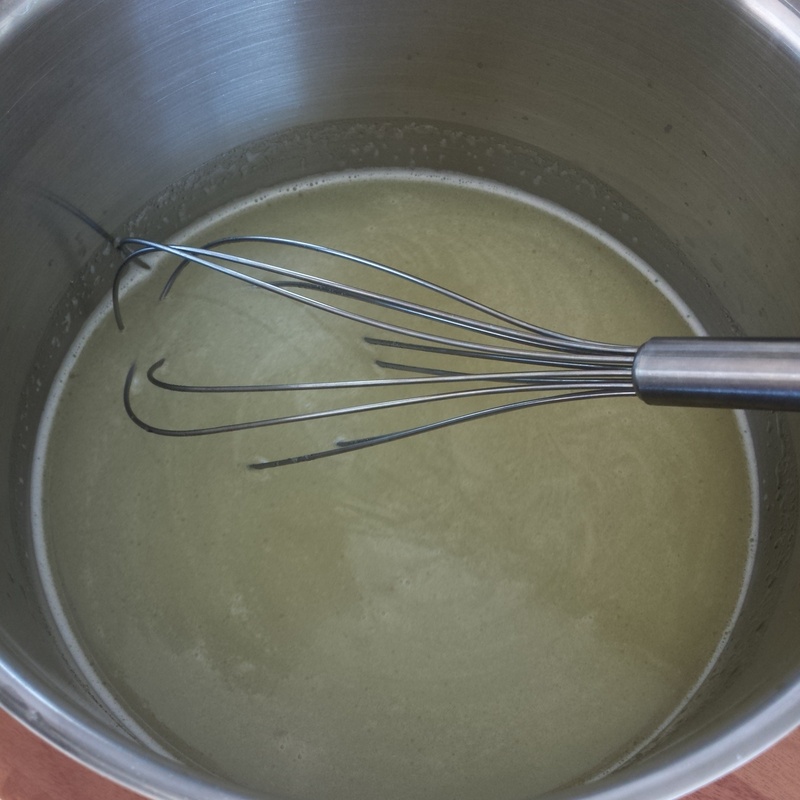 (You could of course use a hand held electric whisk instead, I just used this as I already had it to hand from macaroon making…) This creates a lovely warm yellow liquid with all those egg yolks in it! 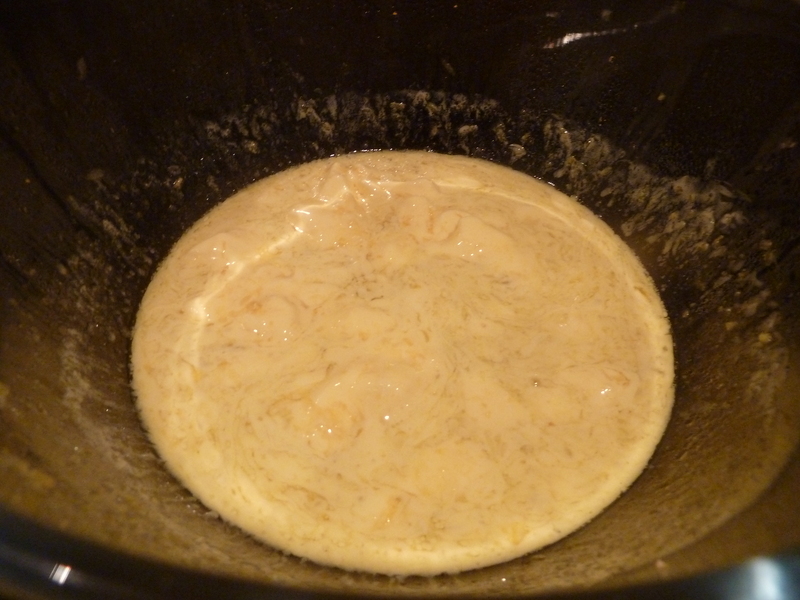 While the mixer is running, add the sugar gradually to the eggs and continue to whisk the mixture for about 10 minutes. While the mixer is running if you have your hands free, you can then use the time to measure out and sift together the flour, baking powder, and salt in a separate bowl. 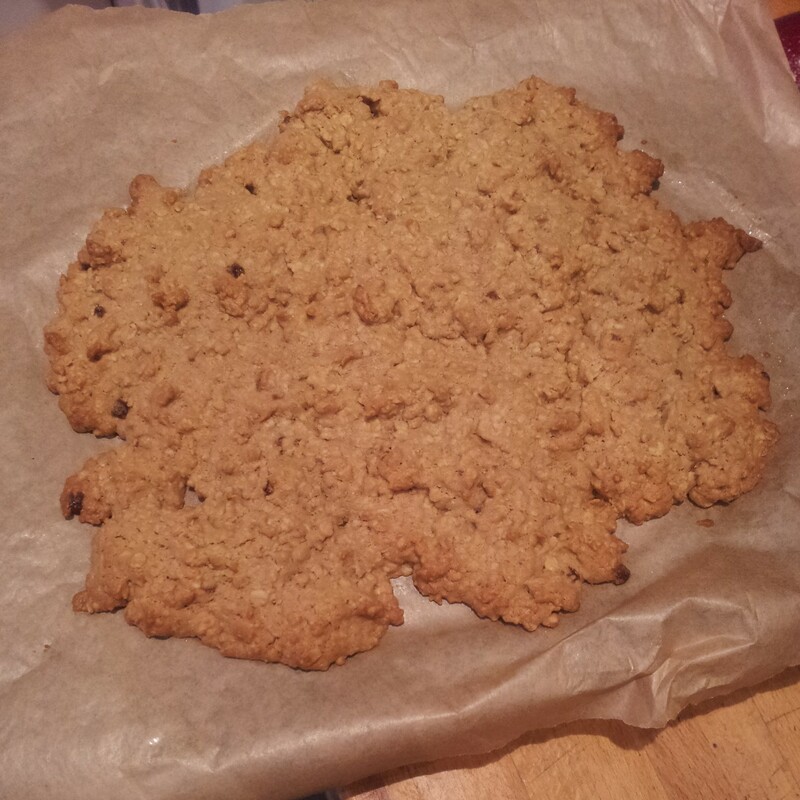 Admittedly I erred from the recipe at this point. 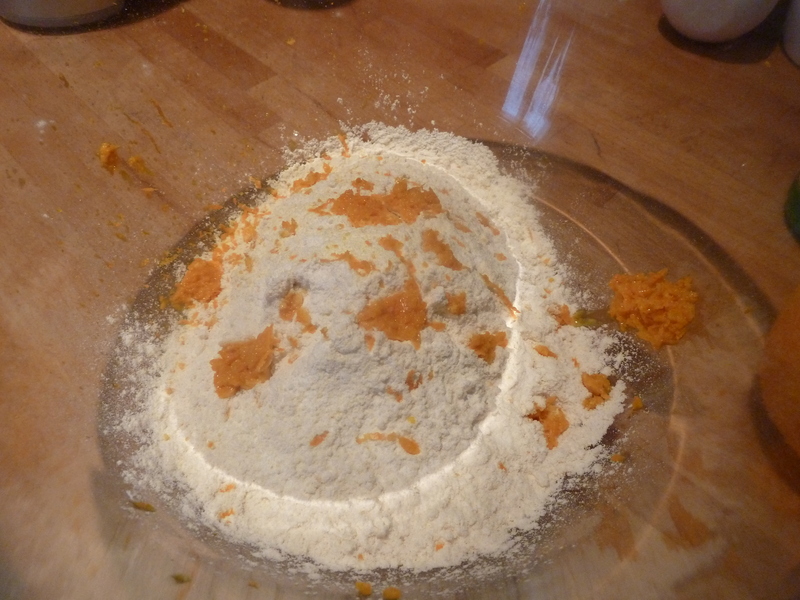 I added the zest of an entire orange to my dry ingredients rather than folding them into the wet mix… I don’t think this made the slightest bit of difference, other than I could stir the flour more vigorously without the fear of knocking all of that wonderful air out of the eggy batter. I also couldn’t be bothered to juice my orange, so took the lazy option of adding some lemon juice that I had in the fridge already. Hopefully this added to the citrussyness of the sponge. 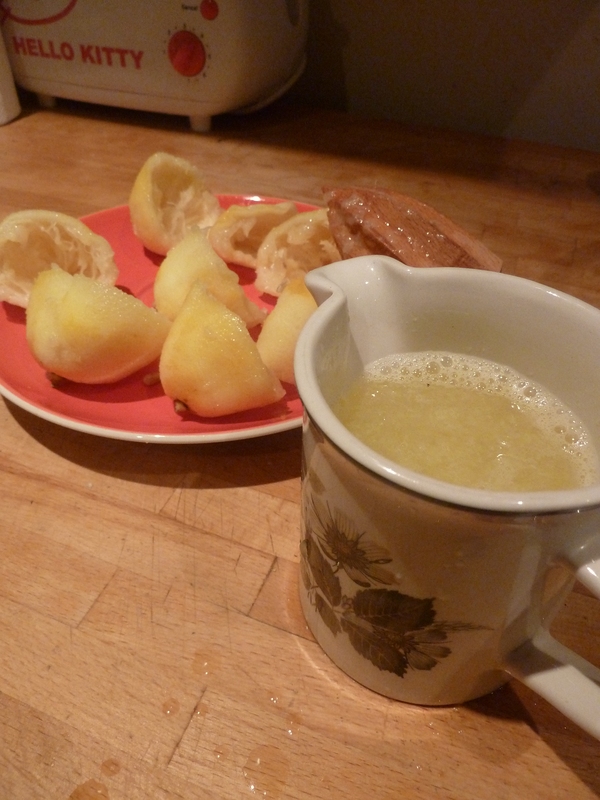 I then continued folding in the orange extract and lemon juice. 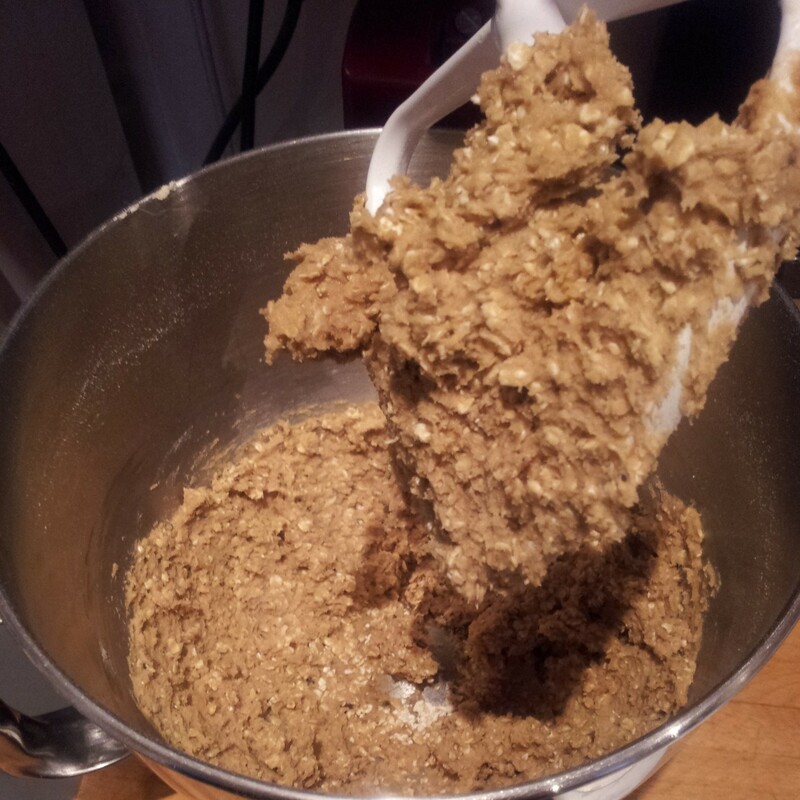 I was also in a hurry so didn’t bother to sift the flour into the mix, but rather opted for the ‘all in’ method. Dumping all of the flour into the egg fluff and folding it in with a metal spoon. I read somewhere that bakers are divided on this sponge making method. Some say to fold in a third of the flour at a time with a metal spoon to keep in all that lovely air in the whisked eggs. Others say put it all in, in one go, to minimise the amount of folding you have to do, but don’t drop the mixture into the eggs from a height as this will knock out the air. I have tried both methods and I think I have to agree with the latter. And it was quicker too! Whichever sponge making method you prefer the golden rule is always do not stir or beat the mixture and fold with a metal spoon to cut through the mixture. What do you prefer?? Then last but not least all that is left is to fold in the boiling water carefully to produce a fluffy and luxuriously thick batter. Step 1. 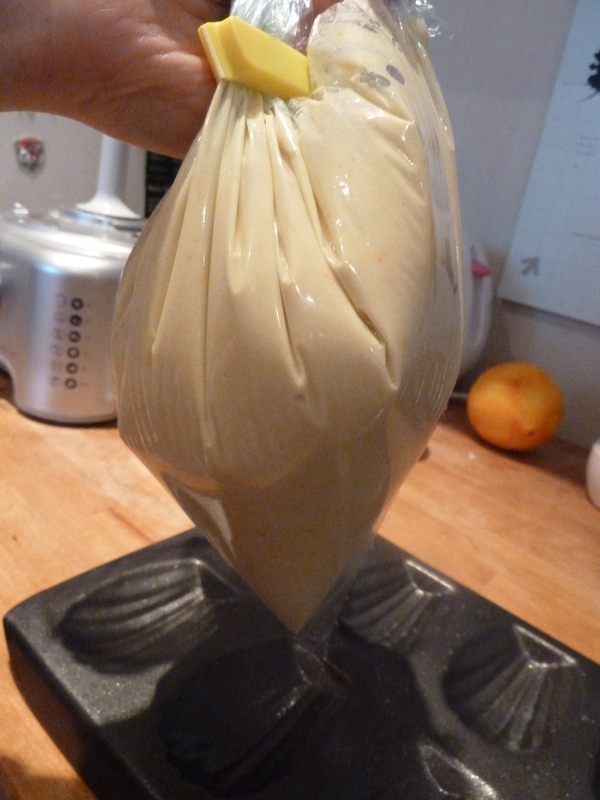 Carefully empty the batter into a plastic sandwich bag opened over a measuring jug. The jug helps to support the bag and you can fold the bag down over the edges. I also balanced the bowl onto the wide jug neck so to reduce how far the batter had to travel (and preserve the air content!). it also means you can get the spatula out and encourage the rest of the batter into the bag. The jug helps to support the bag and you can fold the bag down over the edges. I also balanced the bowl onto the wide jug neck so to reduce how far the batter had to travel (and preserve the air content!). it also means you can get the spatula out and encourage the rest of the batter into the bag. Step 3. Snip the corner off the ‘piping bag’ and you’re good to go! Squeeze the bag gently to release an even flow of batter into your pre greased tin and use your spare hand to put your finger over the ‘nozzle’ when you have piped enough mixture into each portion of the Madeleine tin. Less mess and no waste! 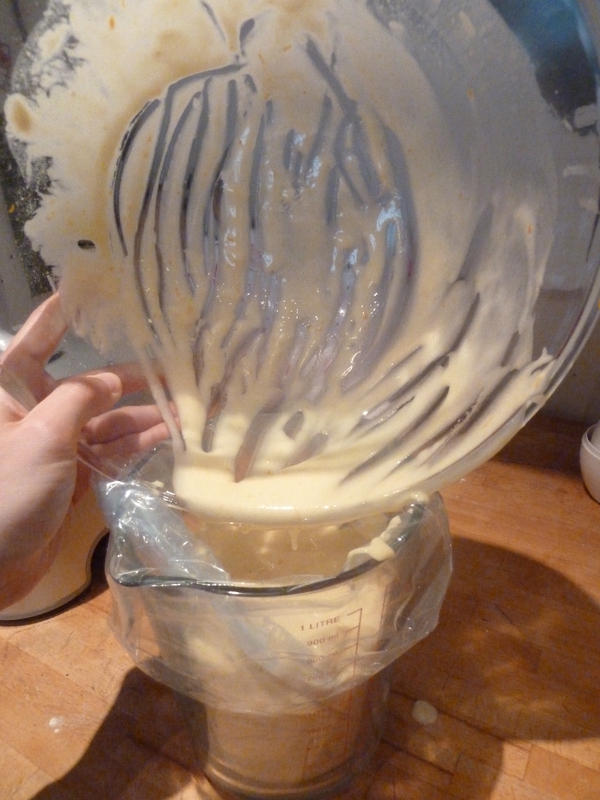 I found this much easier and quicker than trying to spoon the batter into the tin as it went everywhere and left lots of mess on the tin too. 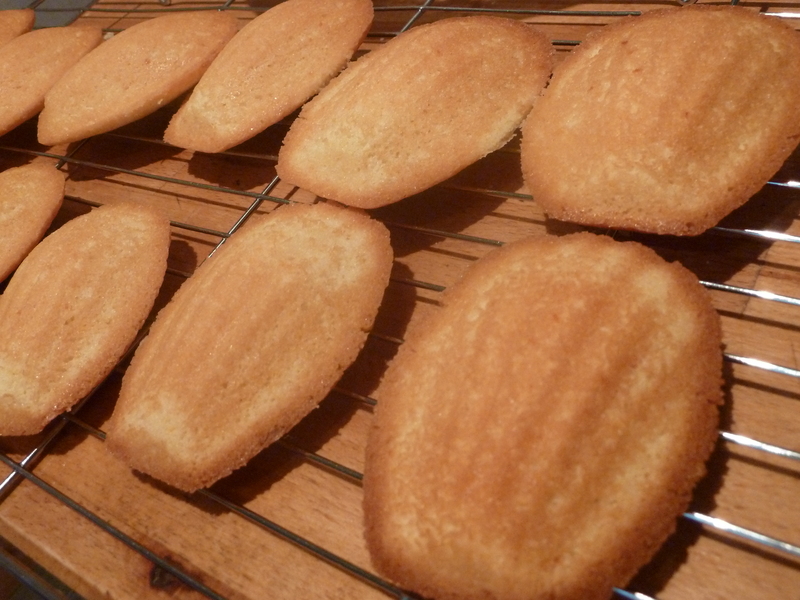 Don’t forget to grease your Madeleine tin well (I love my quick release spray!) 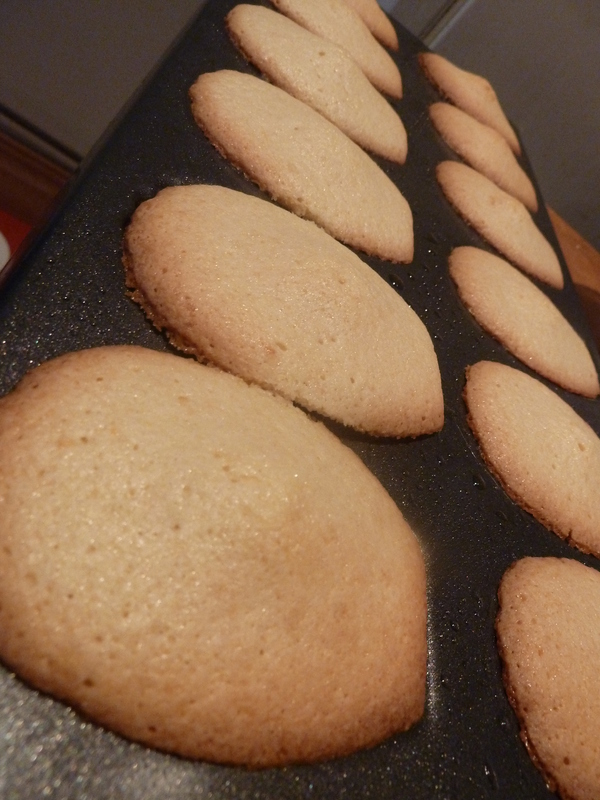 and only fill each Madeleine well one third of the way up so they have room to expand. If you over fill, they will spill out and burn. 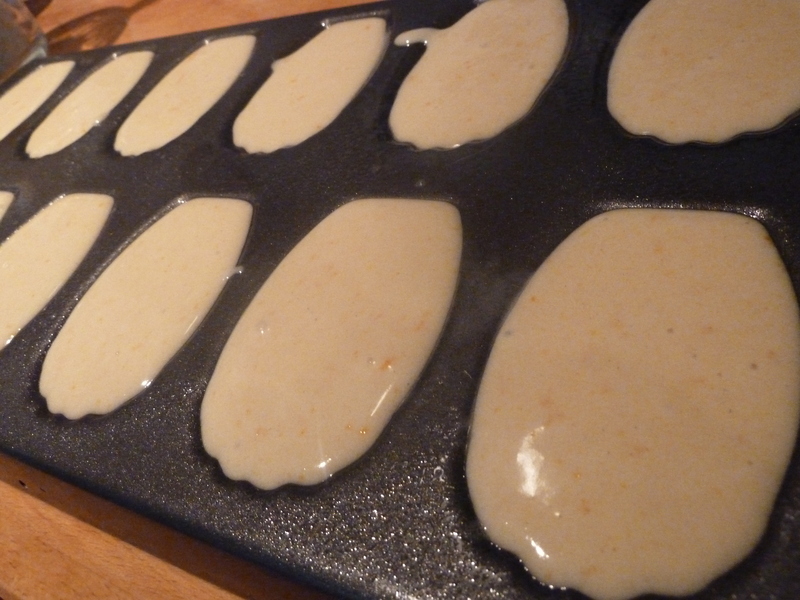 Egg Yolk Madeleines ready to bake – look at those flecks of orange! Leave the tray on a flat surface to settle and let gravity do its job. 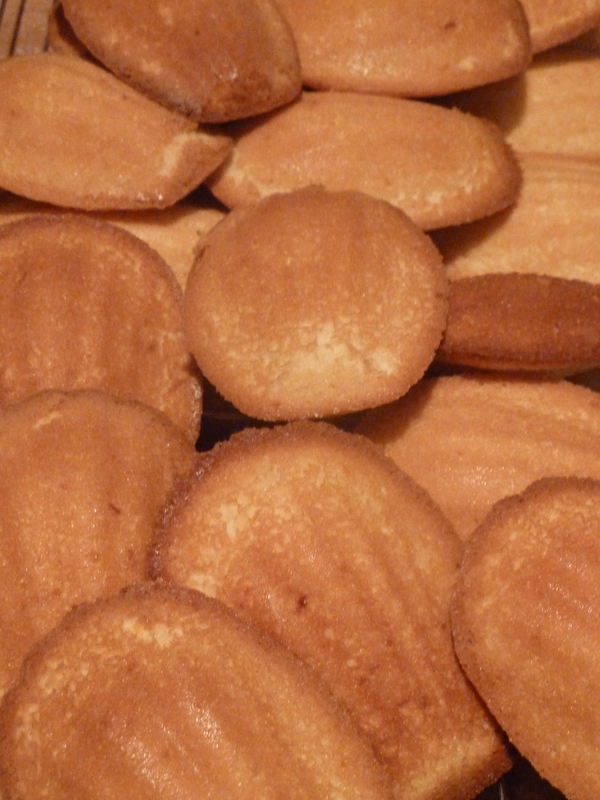 The mixture will spread and level out, filling all of the shapely Madeleine grooves. You probably won’t need to put as much batter into each well as you think, but this allows you the option of topping up any wells that look a little low. I really love these cakes so zesty and sweet. 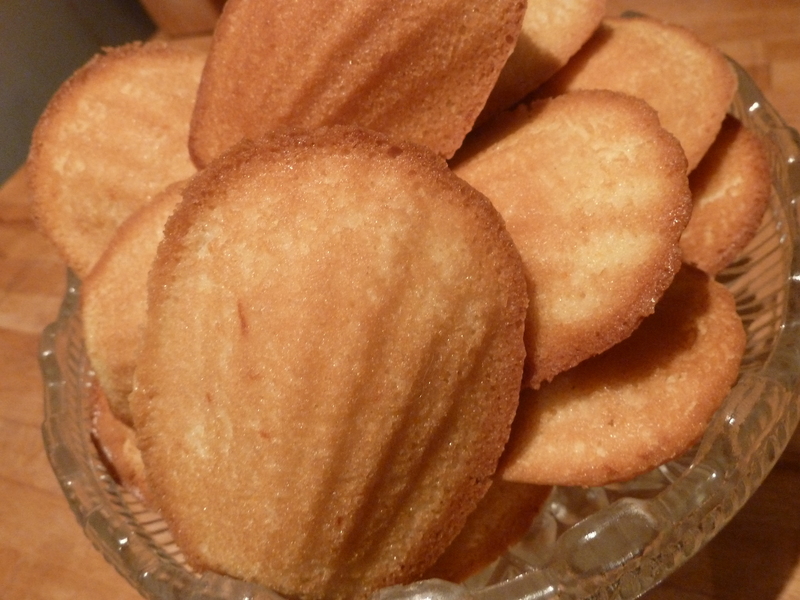 Having baked them in the Madeleine shape, they have a wonderfully light and soft centre with a golden crust, with a nice bite to it. Not dry or tough in the slightest. I will be making these again for sure. 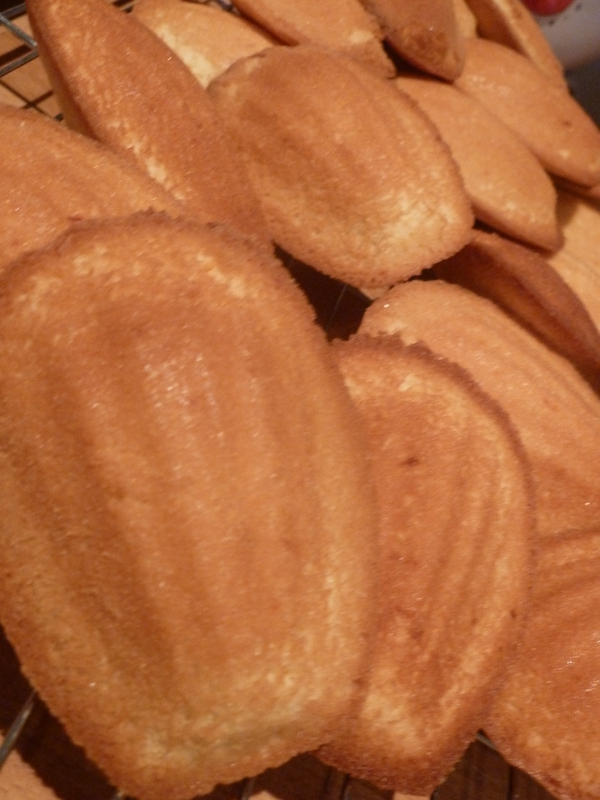 They are traditionally baked as round cakes or one large cake but I quite like how portable and hand sized the Madeleines are easy to eat on the move with a good cuppa! If you’re feeling fancy you could even dust them lightly with confectioner’s sugar or frost with Orange Butter Frosting. 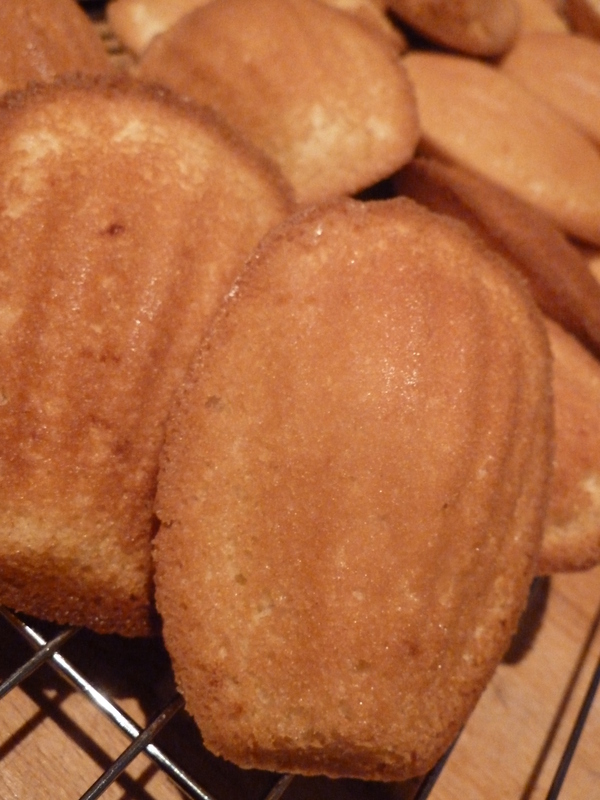 But I think I prefer to see the shapely grooves of the Madeleine. In Hiroshima, I spotted shop windows stylishly displaying towers of tantalisingly multicoloured circular sandwiches, of every colour in the rainbow. At this point, a couple of yearrs ago now, I had never even heard of Macaroons, let alone tasted one. I kept promising myself one, but with all the other amazing food I never got round to it! Returning home I realised I was macaroonless. 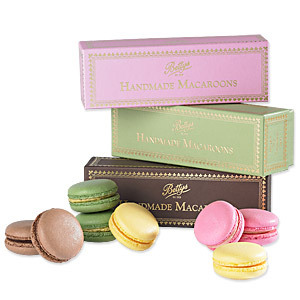 I then heard more and more about Macaroons, they were everywhere, from Gossip Girl to Lorraine Pascale. (Think Blair Waldorf eating an entire box of pistachio macaroons in the bath.) Then The Great British Bake Off with Edd Kimber’s fabulous macarons. The more I heard about them the more I wanted to try them. 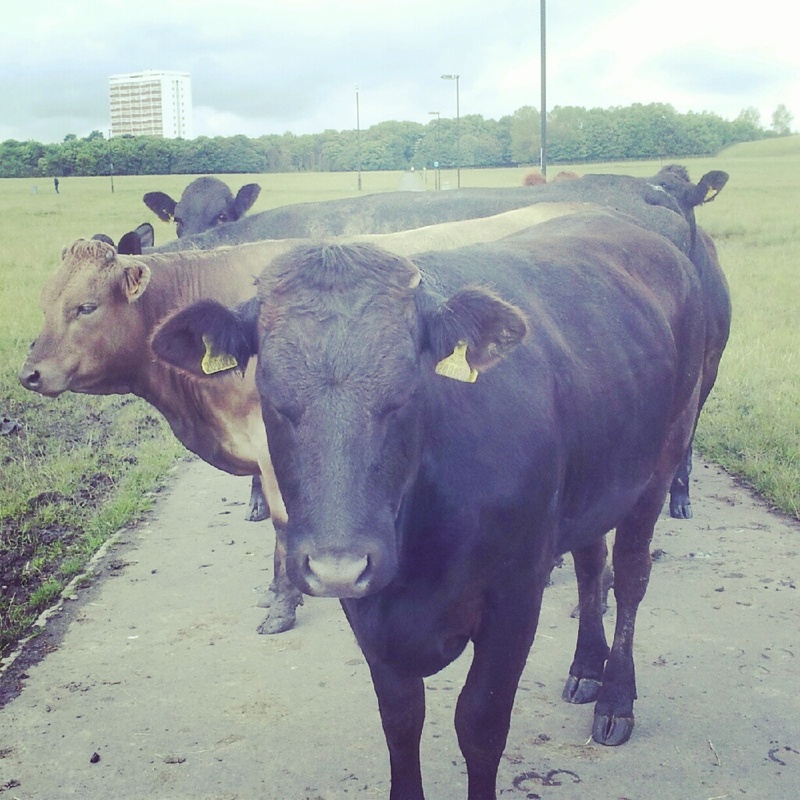 Newcastle is not the Macaroon (or macaron – you choose which spelling you prefer, English or French?) central of the world. However my Mam happened upon them in Betty’s Tea Room and bought me an entire box! How decadent and divine, so light and sweet. I sampled the lot, lemon, pistachio, chocolate and strawberry glossy and smooth macaroons filled with delicious jam and buttercream. They feel like something French aristocrats would enjoy on a daily basis. 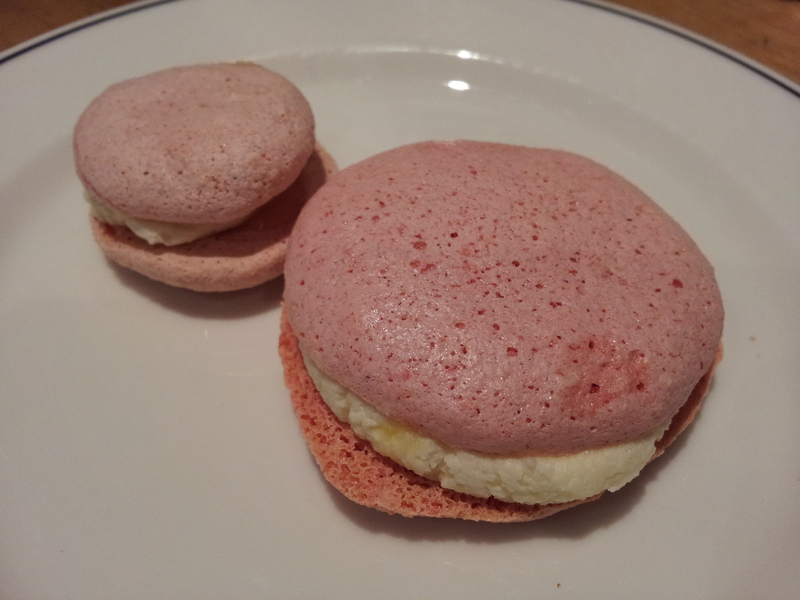 Betty’s Tea Rooms Handmade Macaroons – note the glossy exterior, feet and lift! I learned a few things along the way when making these. They are quite technical and a bit tricky but essentially they are a meringue and like when I made pavlova and mini meringues they require ‘drying out’ or cooking in a low temperature oven. 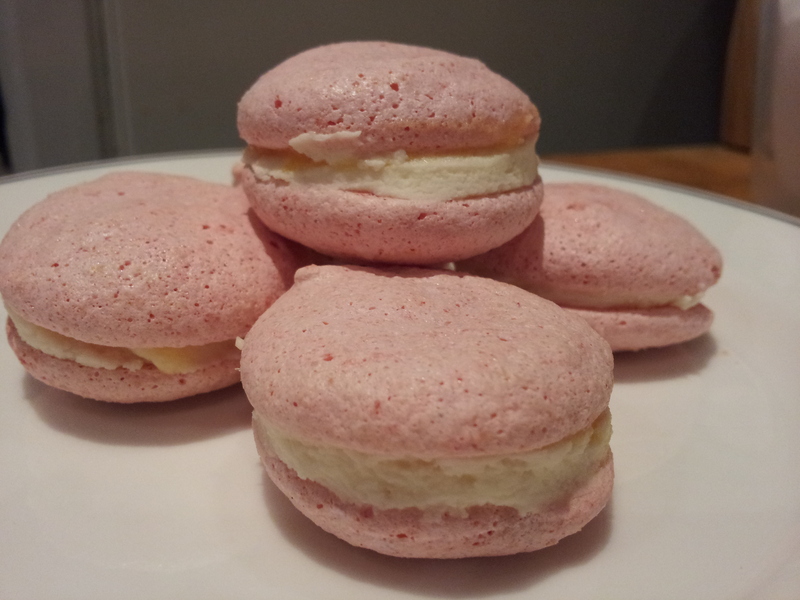 I chose a classic macaroon recipe to follow and adapted it to suit the flavours that I had in my cupboard. 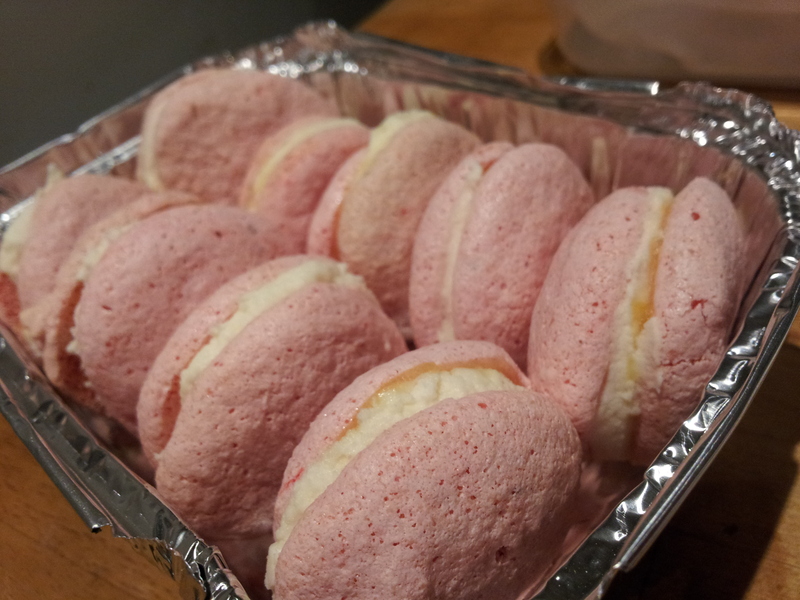 Which meant that I ended up with pink lemon flavoured macaroons. This kind of messes with your mind a little. 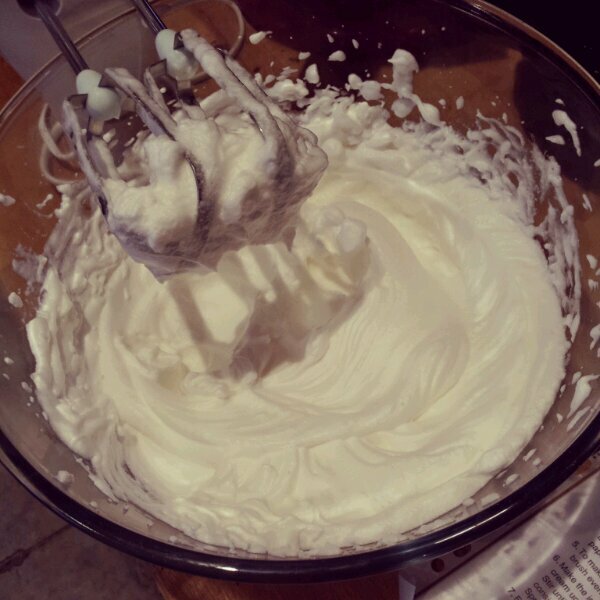 It can take 10 minutes or so to whisk the egg whites until they are shiny. Then you known they’re ready for the ground almonds. 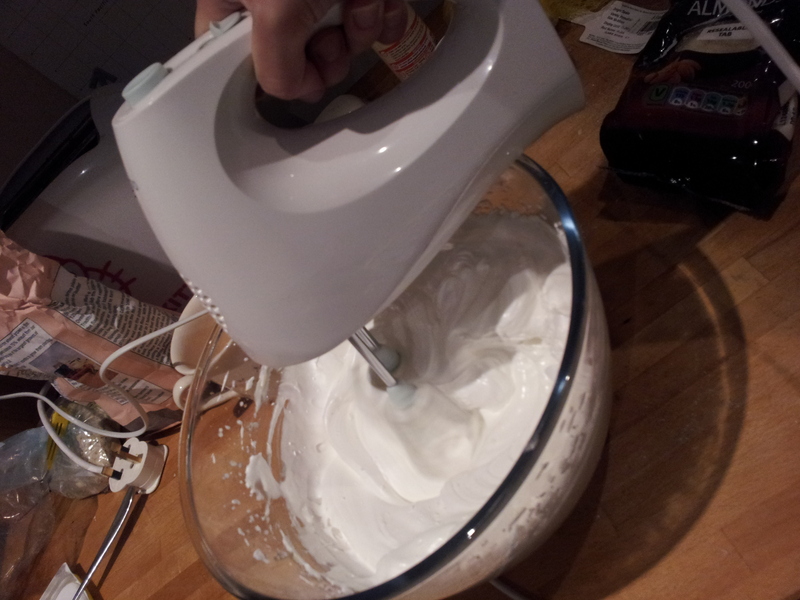 Using a metal spoon I carefully folded in the ground almonds, so as to keep as much air in the meringue as possible. I spooned the meringue paste into a piping bag with a plain round nozzle and piped freestyle. 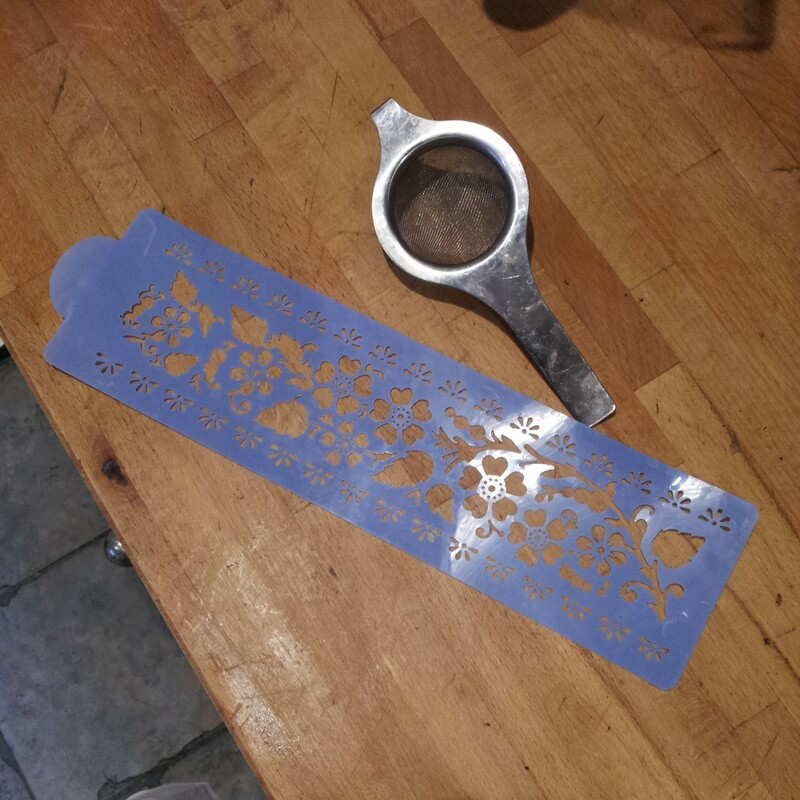 Some people like Holly Bell, who are far more prepared than me, use a template of equally spaced circles (or other shapes) under their greaseproof paper to pipe equal amounts onto the tray. I however was in a baking frenzy and choose to guess. Therefore my results are somewhat less than consistent. My piping was supposed to produce little delicate rounds of meringue onto the baking tray lined with grease proof paper. Occasionally little meringue peaks formed on my macaroon circles. 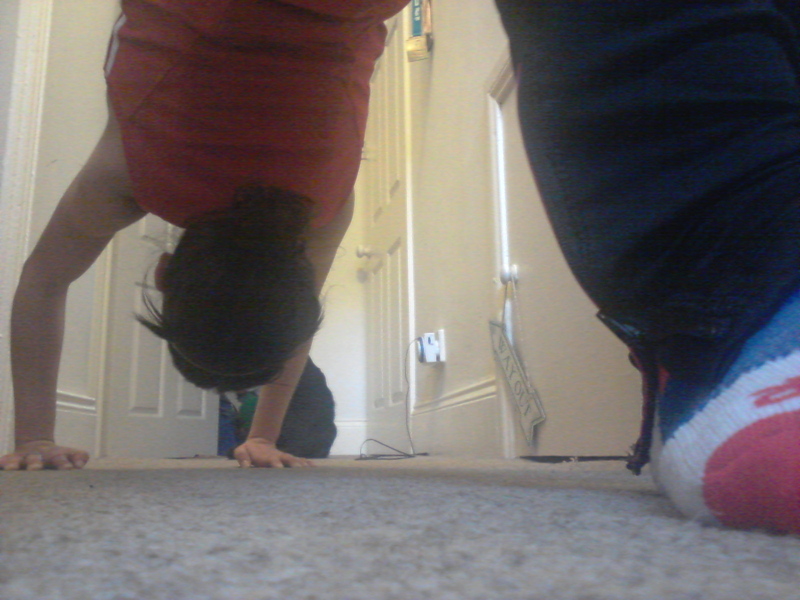 I quickly flattened them down again with a slightly wet finger. Good news however! There’s no need to grease the paper before piping, which is always a nice treat. 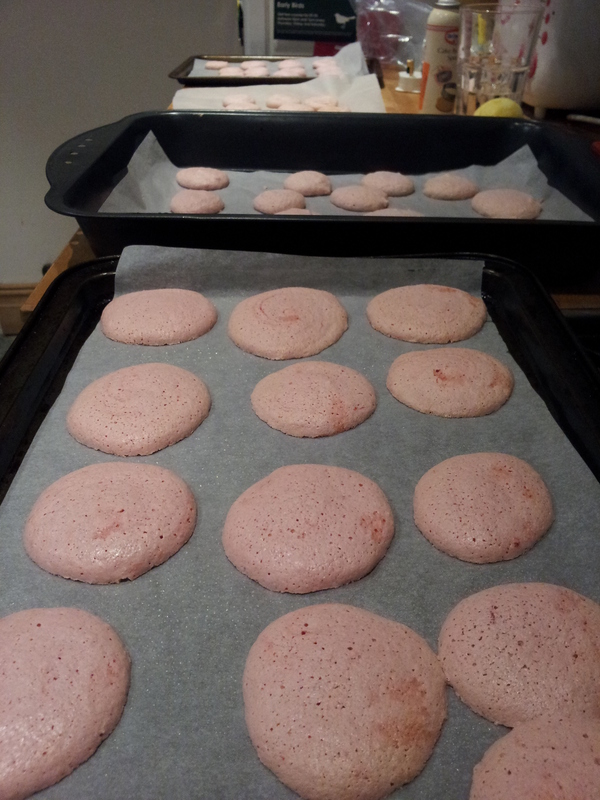 a) Gently banged the tray on the worktop to make sure the bottom of the macaroons were flat. 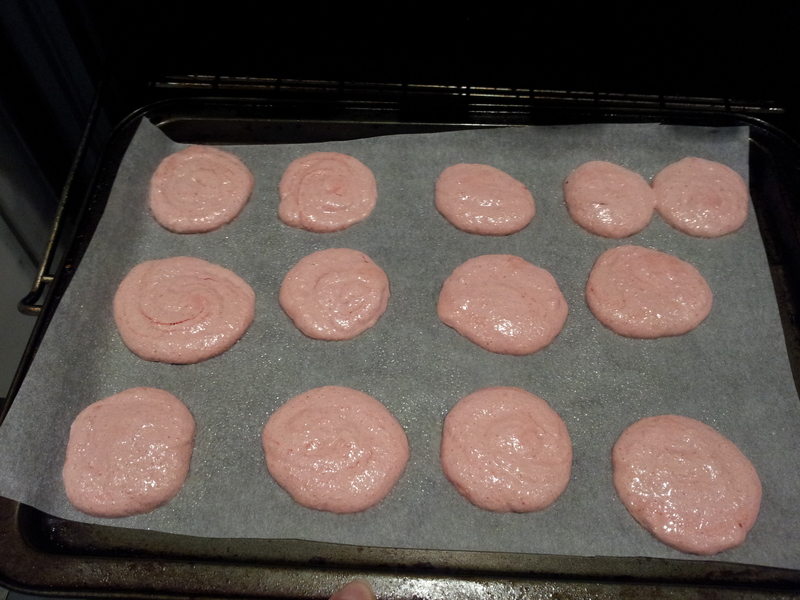 b) Left the macaroons for 20 – 30 minutes to dry slightly and form a skin on the top before putting them into the oven. (I have since discovered that you get a more glossy finish by doing this and it helps the macaroons to form their characteristic ‘feet’(the little rugged ridge around the base of the shell) and lift up from the tray in the oven. 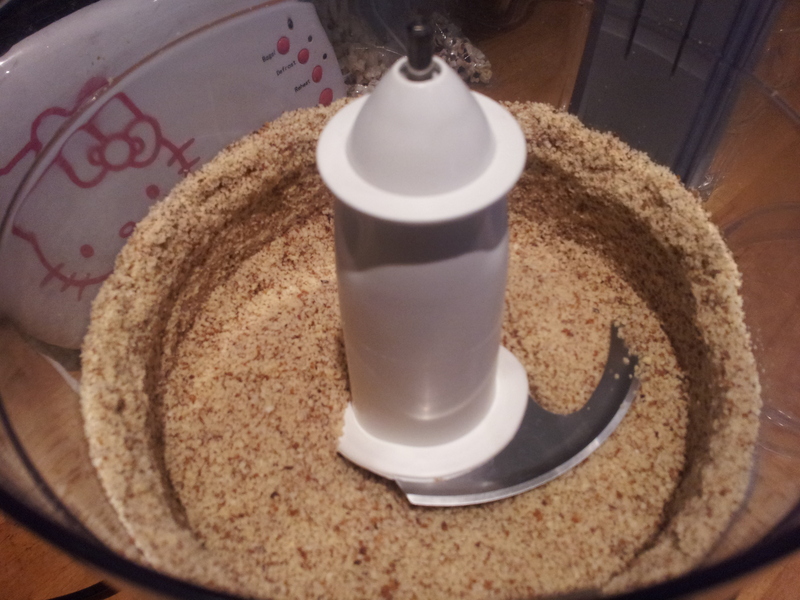 c) Blitzed my ground almonds in the food processor before using them to make sure they were really fine. This is supposed to help ensure a smooth and glossy finish. 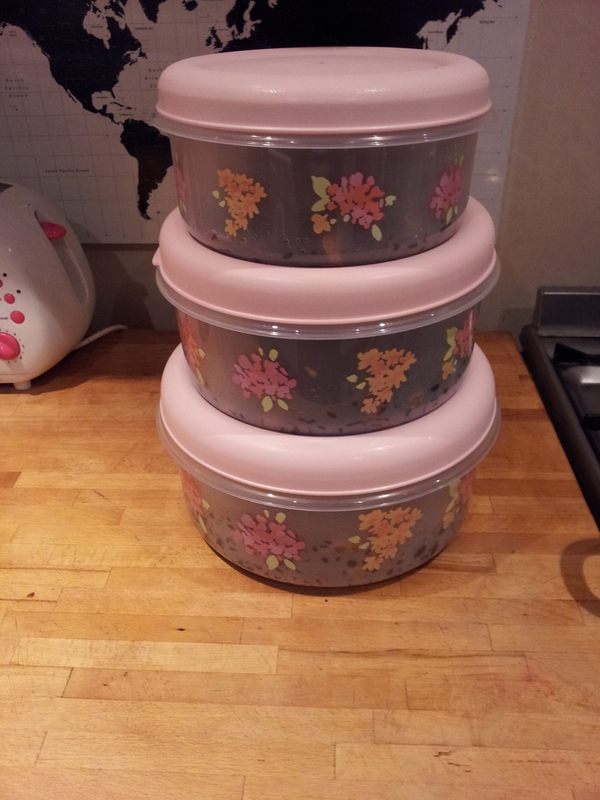 I may have even sieved them if I could have been bothered. 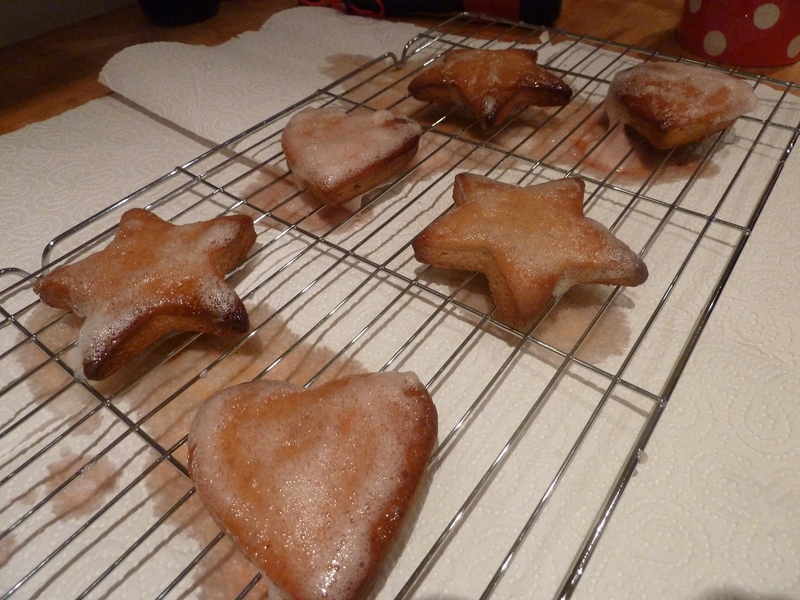 d) Used icing sugar! The recipe just called for caster sugar. Other recipes I’ve looked at use powdered sugar to get a smoother finish. e) Froze the first batch before I filled them. Apparently freezing macaroons helps to make them look and taste even better. I left them to cool completely before filling them with a generous smudge of my home made lemon curd and a sneaky layer lemon buttercream. Then sandwiched two shells together. This recipe was only supposed to make 15 macaroons. I ended up with well over 30, so perhaps I made slightly smaller ones than I was supposed to, but they seemed massive to me. All the more macaroon to enjoy in my opinion. I took a whole box along with me on my last day in my job and they were the first thing to disappear from the buffet table, which indicates success despite their ever so rustic appearance. With the other half I wrapped the empty shells carefully in layers of greaseproof paper and stored them in an airtight container. I froze them for a month and defrosted them for my friend’s leaving do. They accompanied me to the pub in their own takeaway container. I have a whole macaroon book to experiment with so you can definitely expect messy macaroons part 2 in the near future as I’m determined to perfect them! Baked for 40 minutes at 150 degrees C with the oven door slightly open. I’ve always loved lebkuchen. It always seem like Christmas when the shops start selling these chewy and crunchy pink and white sugar coated cookies. This year seemed the right time to attempt to make my own. I’ve not visited Germany (yet) but if the continental Christmas markets are anything to go by I know that I will love it. This is definitely a different type of gingerbread to the Sunderland Gingerbread, very rich and sweet. 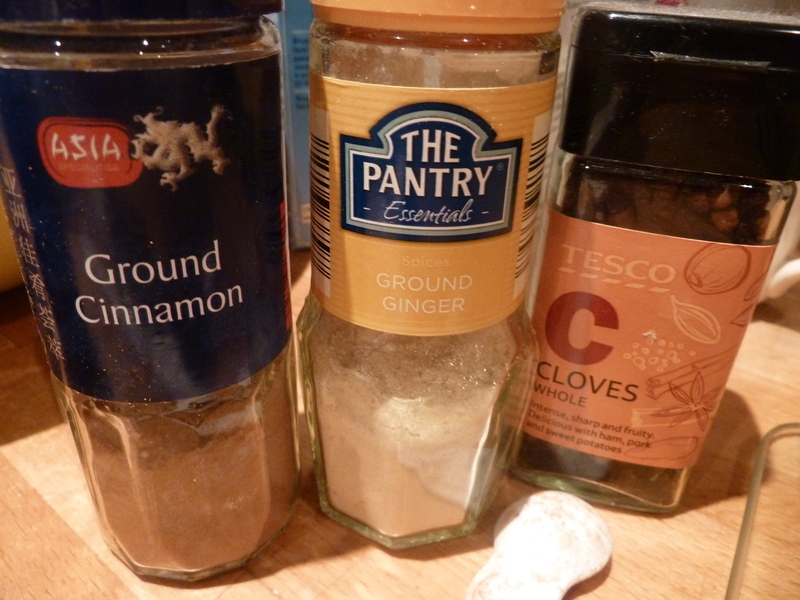 But like Sunderland Gingerbread you throw this all in a pan and melt it together! Fantastic! It needs quite a good stir to mix it all together.. In a bid to speed things up I divided the dough in half and froze half for other Christmas baking emergencies. 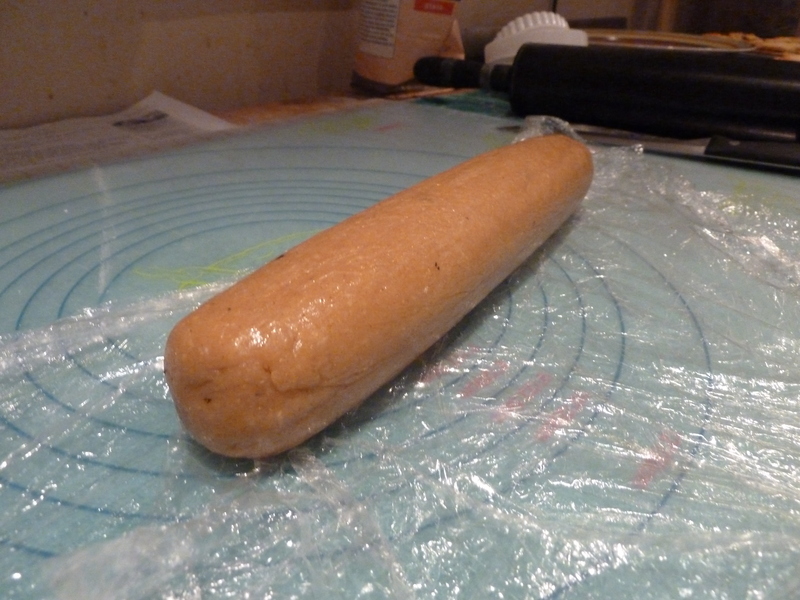 I then folded cling film around the dough to roll it out without needing my pastry board and to prevent it sticking to the rolling pin. Choosing my most Christmassy cookie cutters I cut out the festive shapes and popped them into the oven for a mere 15 minutes. 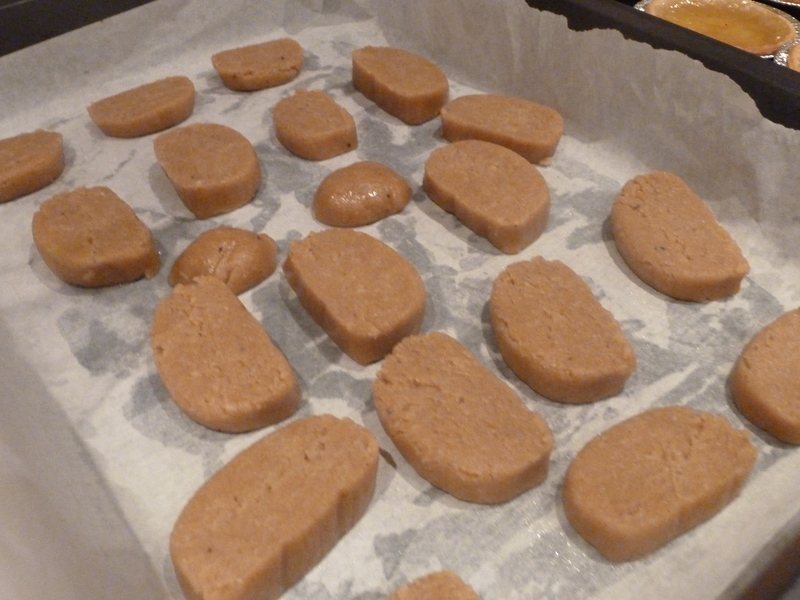 Then all they needed was a glossy sugary coating once they cooled down enough. Whisking an egg white up with some icing sugar to create a glaze is something that I’ve never done before. There’s another first to cross off my list. I drizzled it over the biscuits and let them drip dry onto kitchen roll. 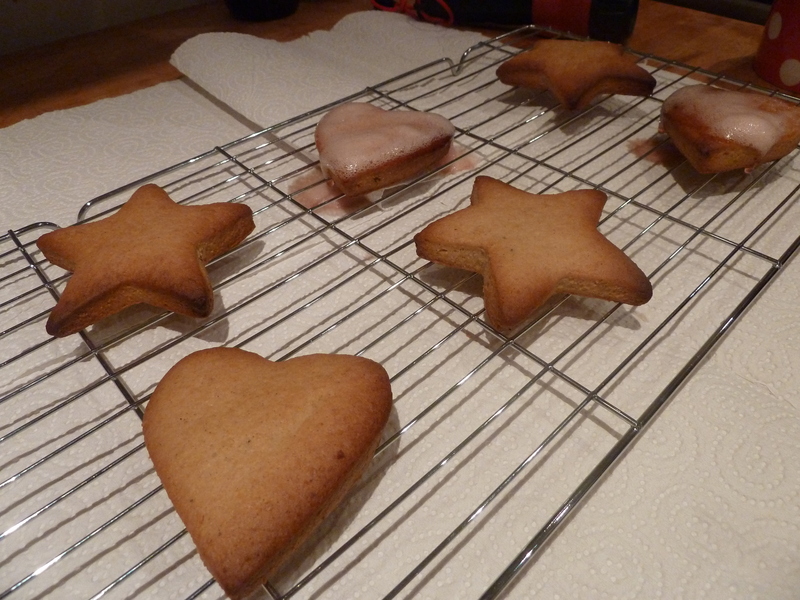 Once they hardened slightly they were ready for eating and the biscuit tin! They were lovely and chewy on the inside. They aren’t overwhelmingly spicy but rich and I enjoy the kick of the black pepper and cloves. I will be baking these every year from now on. I may even try some new variations. I’ve seen some with a much more crispy coating and with a little jam in the middle too to make them extra gooey! 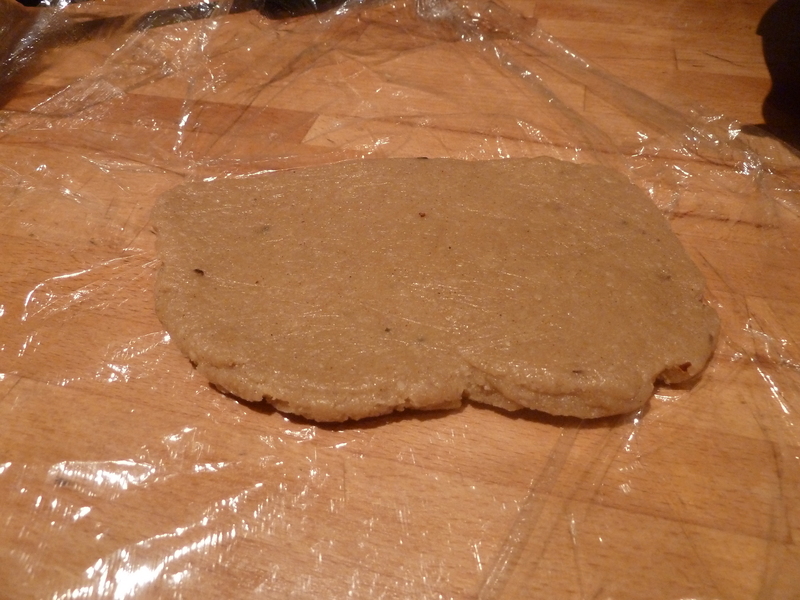 I did whip up the second batch in a baking emergency, during a Christmas baking marathon, so didn’t cut them into shapes but made a dough roll (using cling flm to roll it up of course) and chopped it up… very quick and easy! This is another non bake so I’m not counting it towards my eighty bakes from around the world. 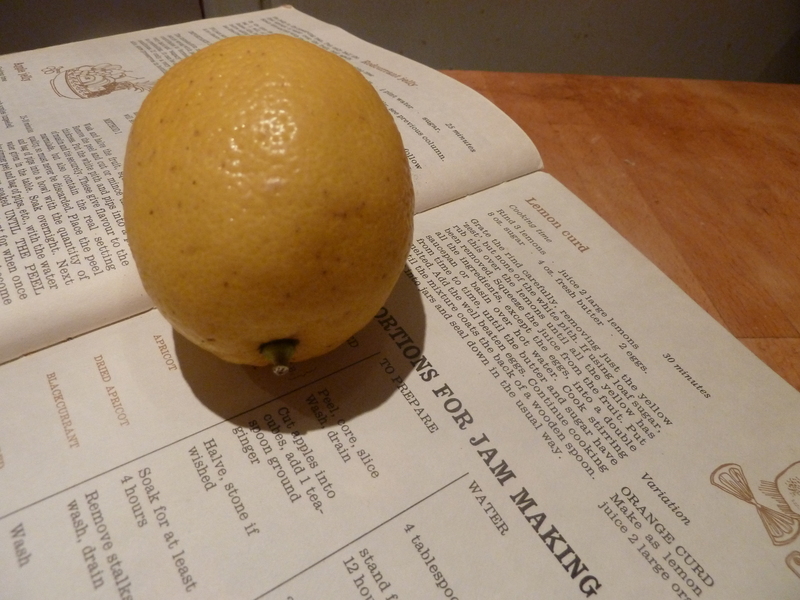 However I want to master the many skills that are needed to be a good baker and make things from scratch hence the curd experiment.I had a bag of lemons that needed to be made into something lovely and after reading Mary Berry’s ‘At Home’ book I realised Lemon Curd is a vital ingredient in many, many cakes. Marguerite Patten made my first venture into jam making so easy that I wanted to try another recipe from her Everyday Cookbook. The addition of eggs scares me a little. What if I do it wrong and I poison people?! Pushing down those terrible thoughts, I put my faith in Marguerite. She’s never let me down yet and my Dad loves Lemon Curd so I’m sure he will appreciate it. It was a relatively simple process. 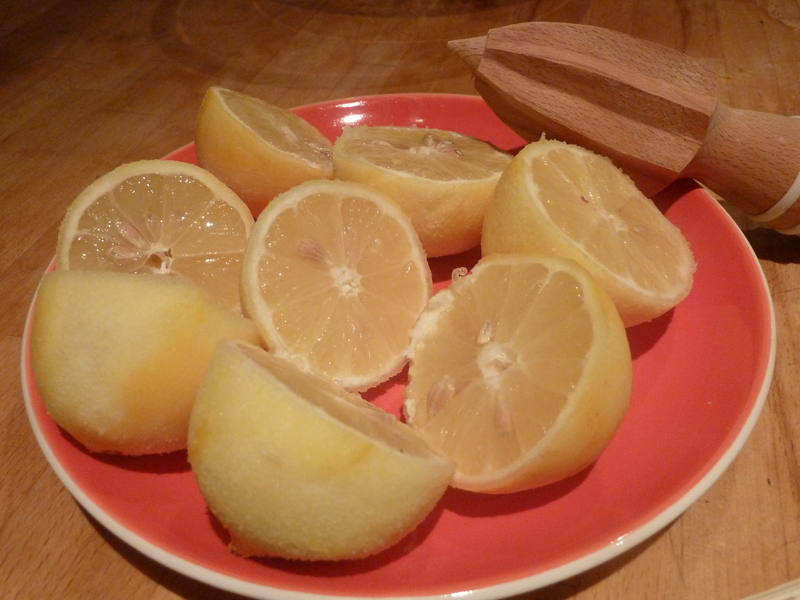 Grate the lemon zest and juice the lemons into a jug. Admittedly this is hard work when you only have a little wooden juicer thing (I’m not sure of its real name) and trying to avoid pips getting into the mixture. If only I had some muslin or something to sieve the juice through… I try to avoid using the fine sieve whenever possible as I don’t like washing it but it had to be deployed here to sieve out the remaining shards of pip. 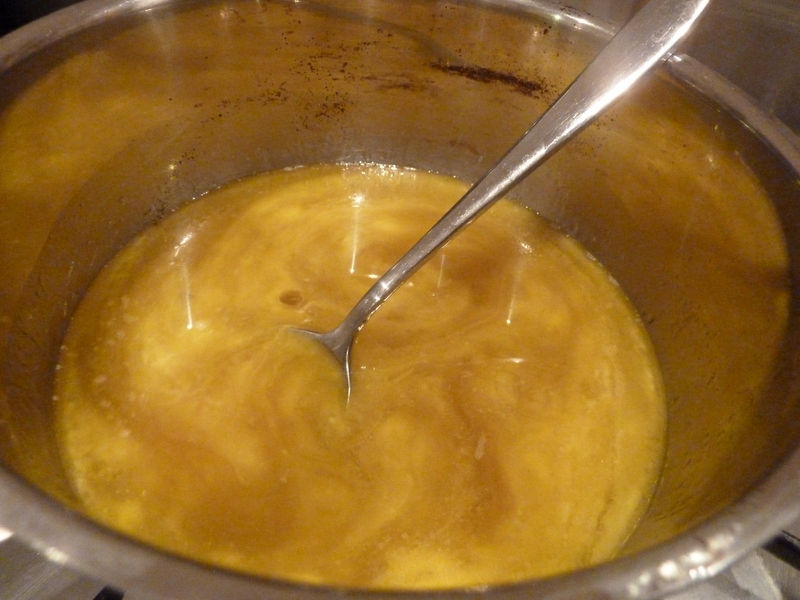 All the ingredients, butter, sugar, lemon and eggs had to be placed in a good old bain marie to simmer. With a constant and vigorous stir to avoid lemon scrambled eggs. 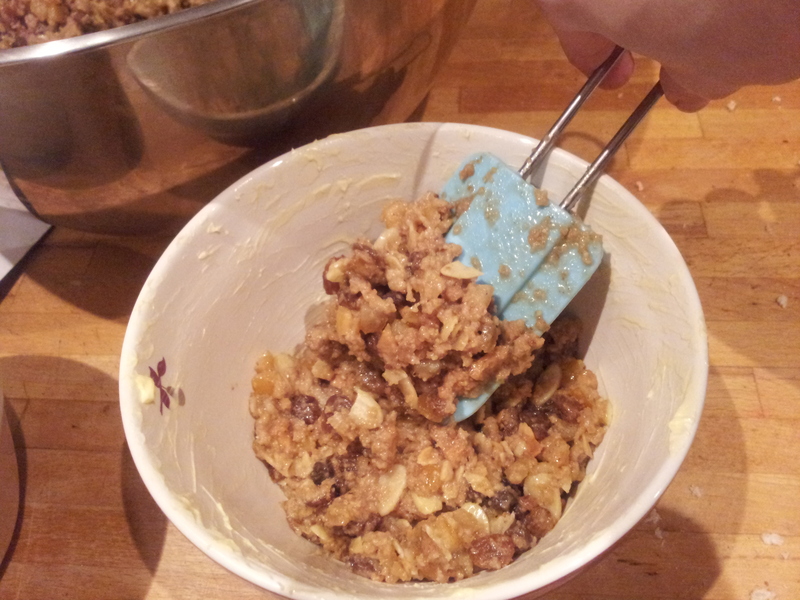 After about an hour on a gentle heat it was the right consistency to ‘coat the back of a spoon’. I find this term a bit confusing as most things do coat the back of spoon… I think Marguerite means when the mixture is thick enough it sticks to the spoon and slides slowly off, or that’s the definition I went with. Then all I had to do was pour it into my sterilised jar (previously of curry sauce origin – lets hope this doesn’t taint the final product!) I had purchased a beautiful thick glass jar with a hinged lid for preserve making. However I managed to knock it onto the floor before work one morning and it promptly smashed into smithereens and flew everywhere! Hoovering under the cupboards before work whilst holding back a curious cat is not so much fun! 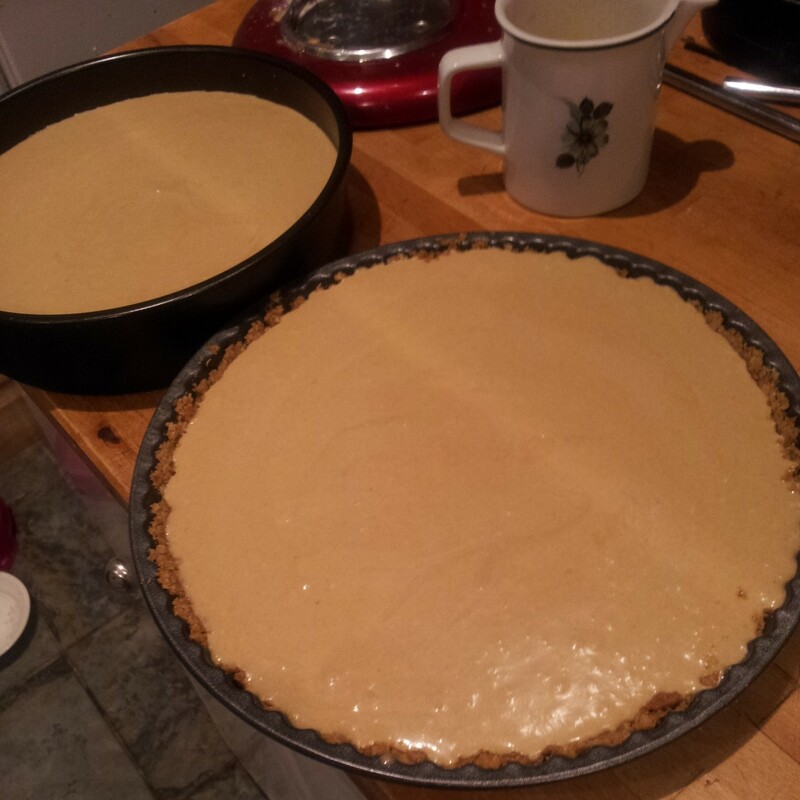 I saved the curd for a special occasion and cracked it open to make a couple of lemon curd tarts this week. It is beautifully sharp and sweet and just the right consistency. There was no curry like after taste either (phew!) so I had sterilised the jar very well. 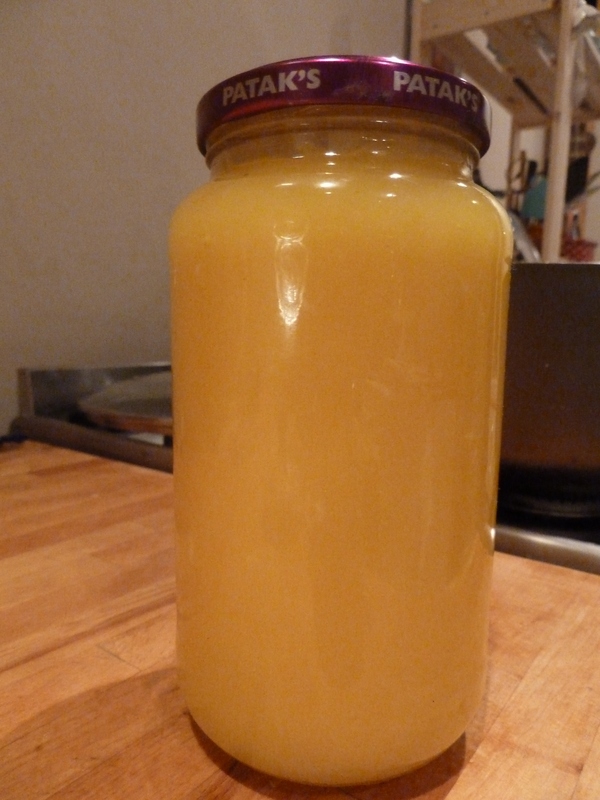 I may never buy lemon curd from a shop again!